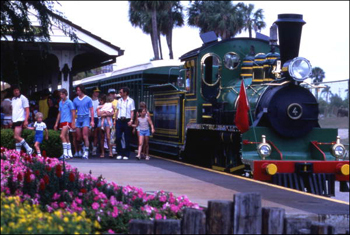 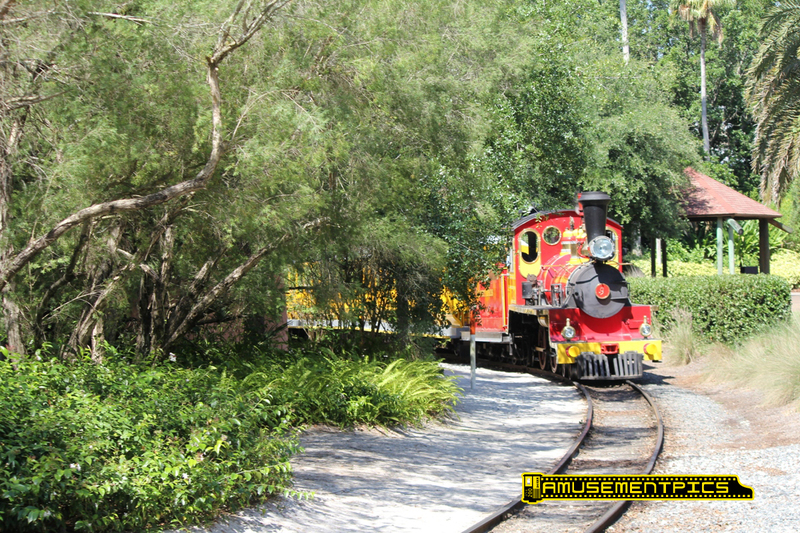 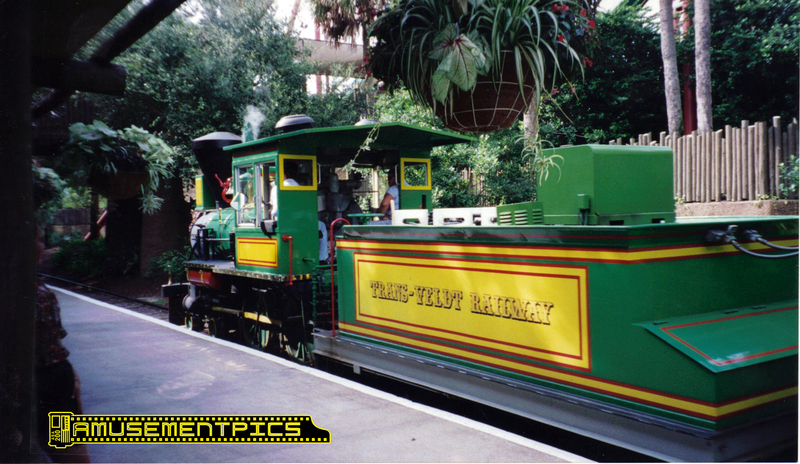 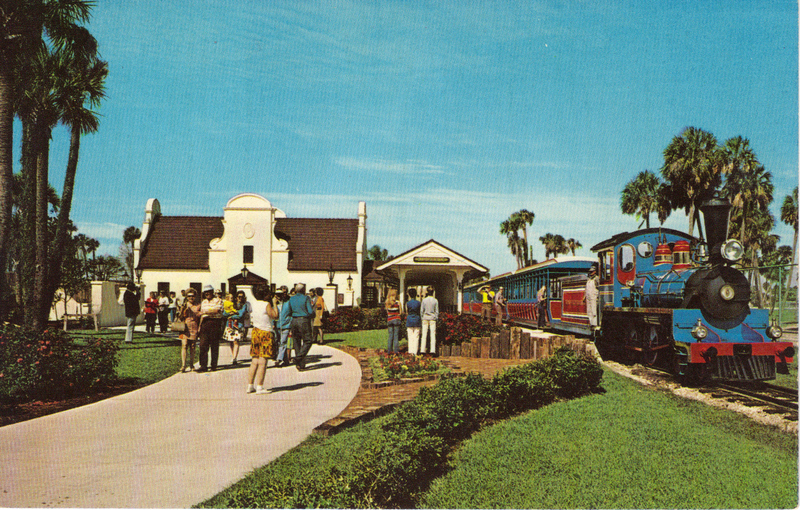 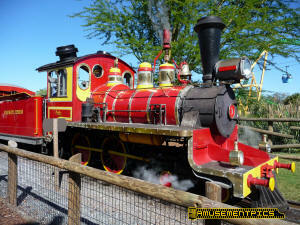 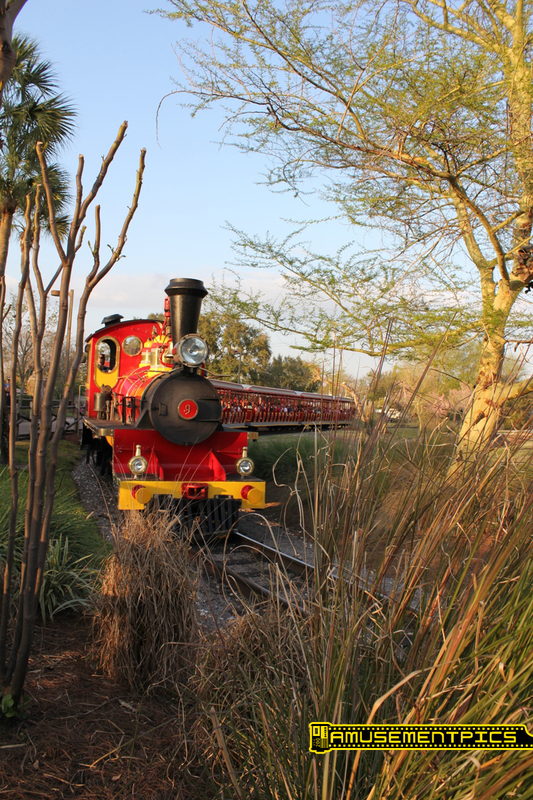 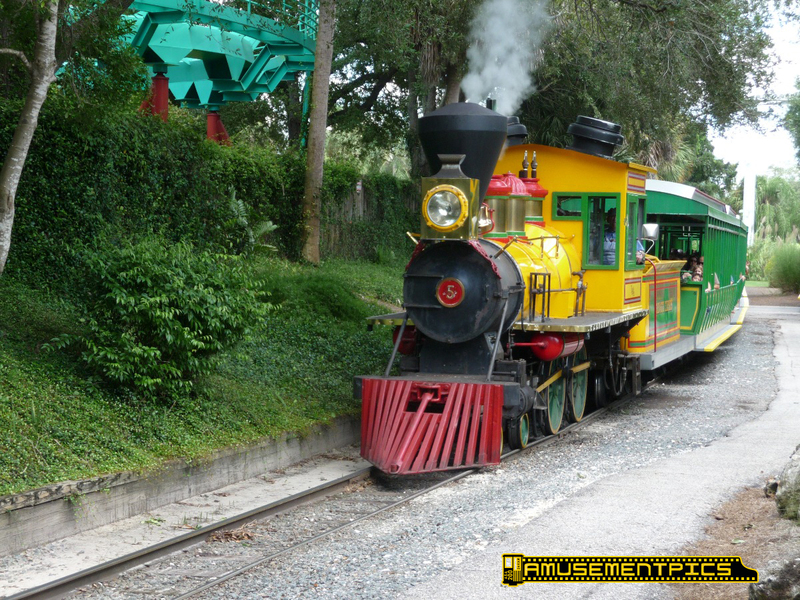 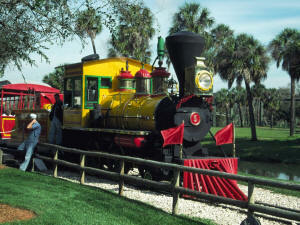 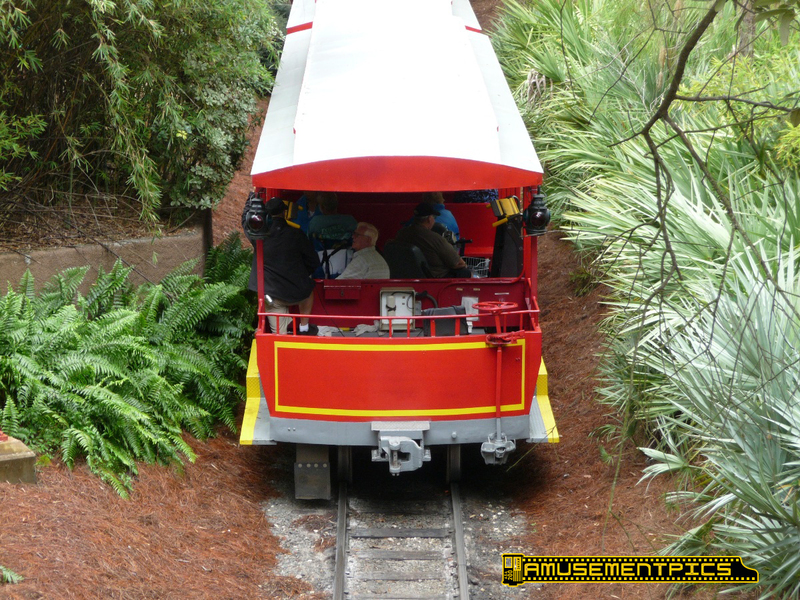 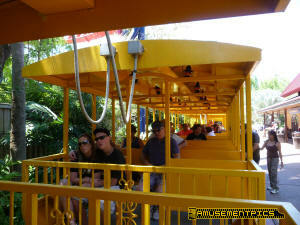 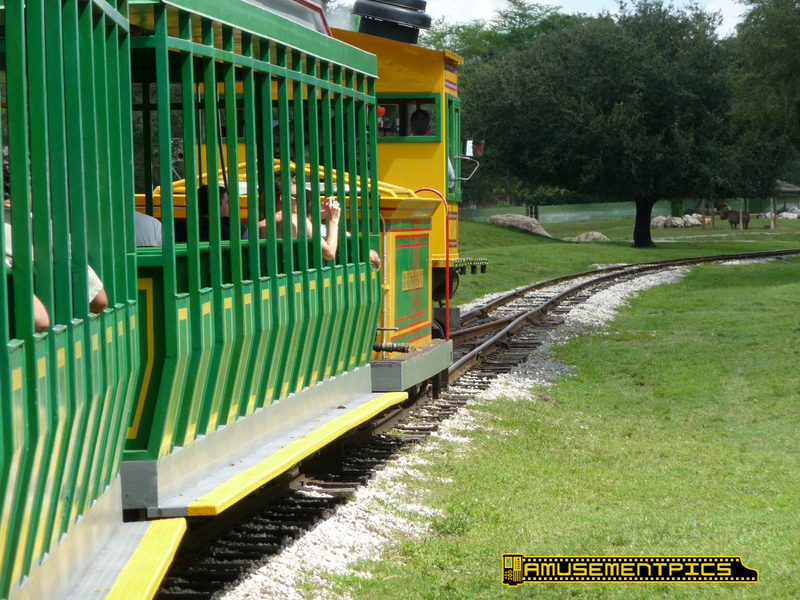 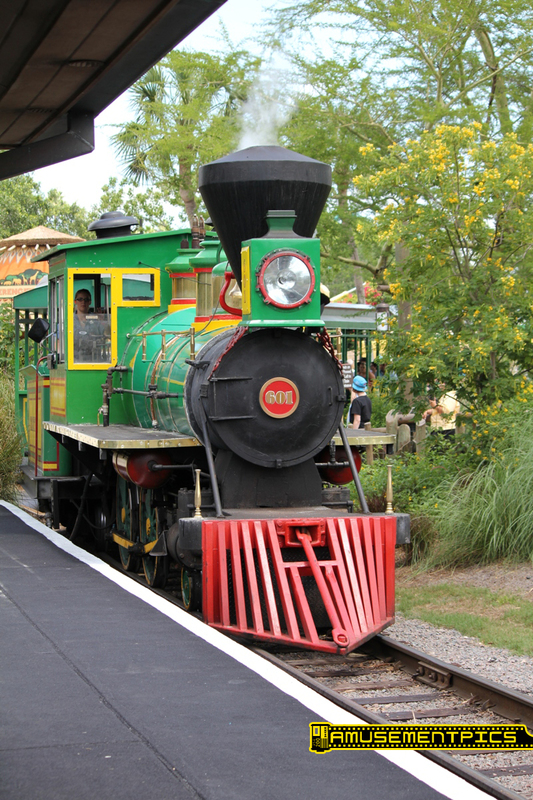 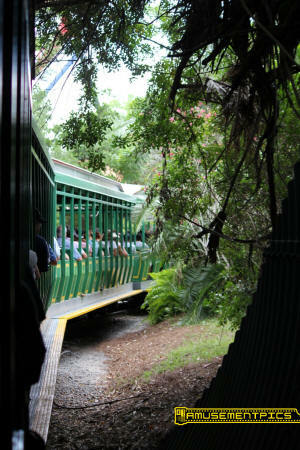 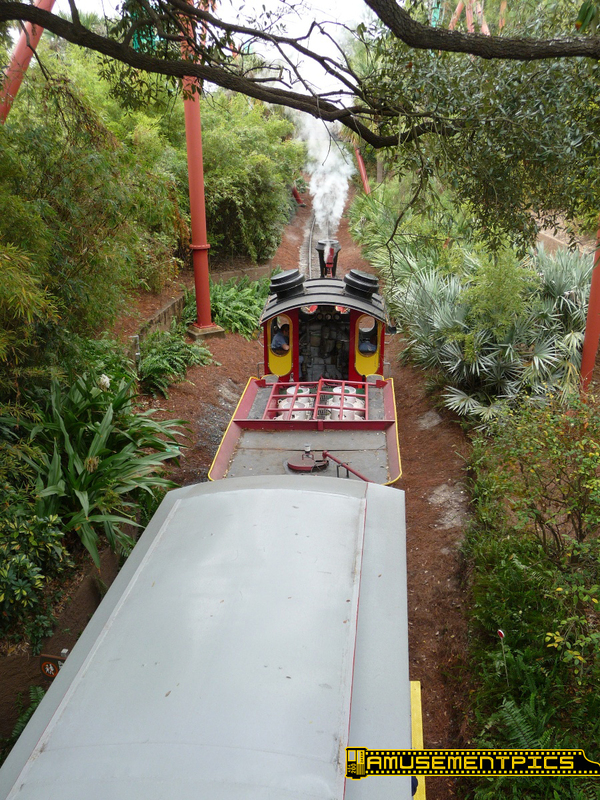 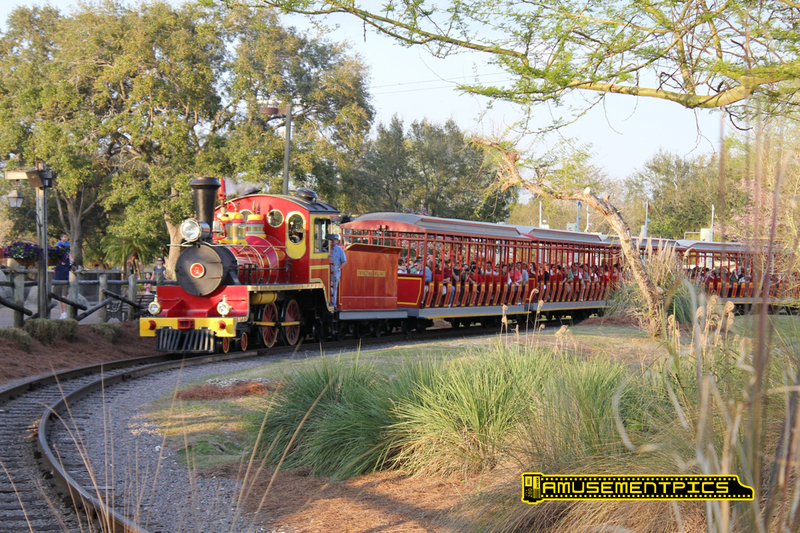 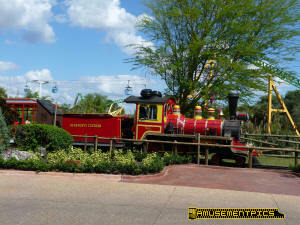 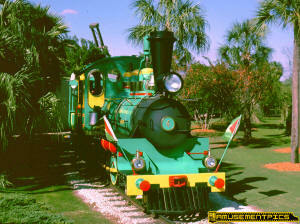 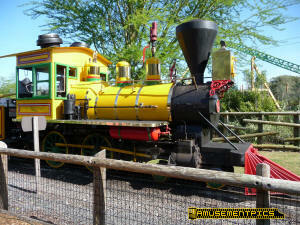 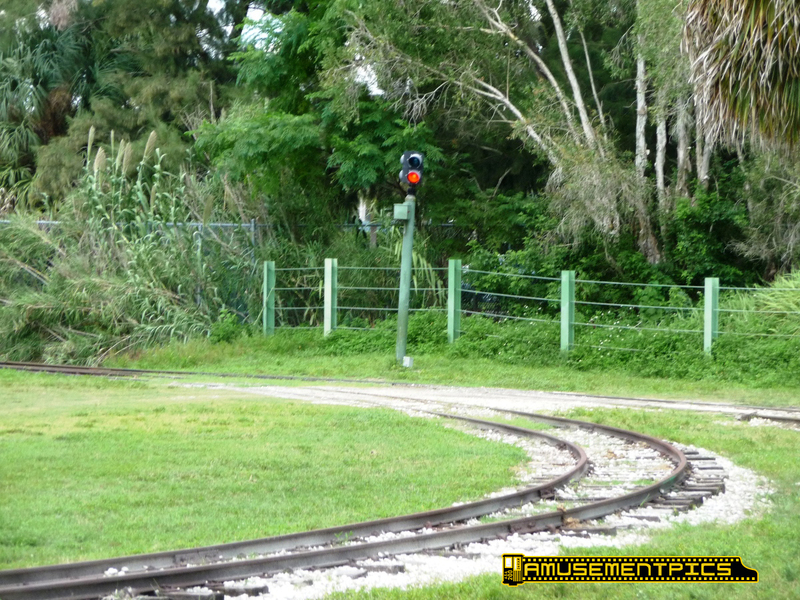 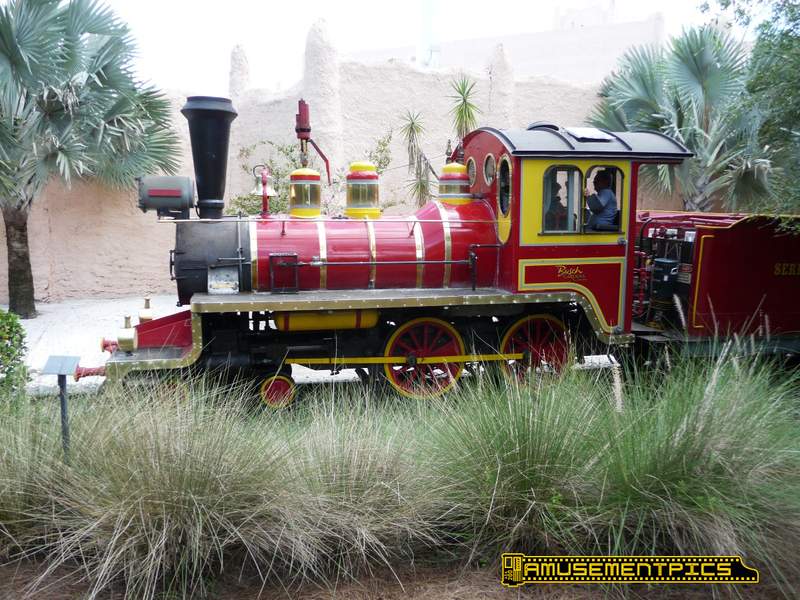 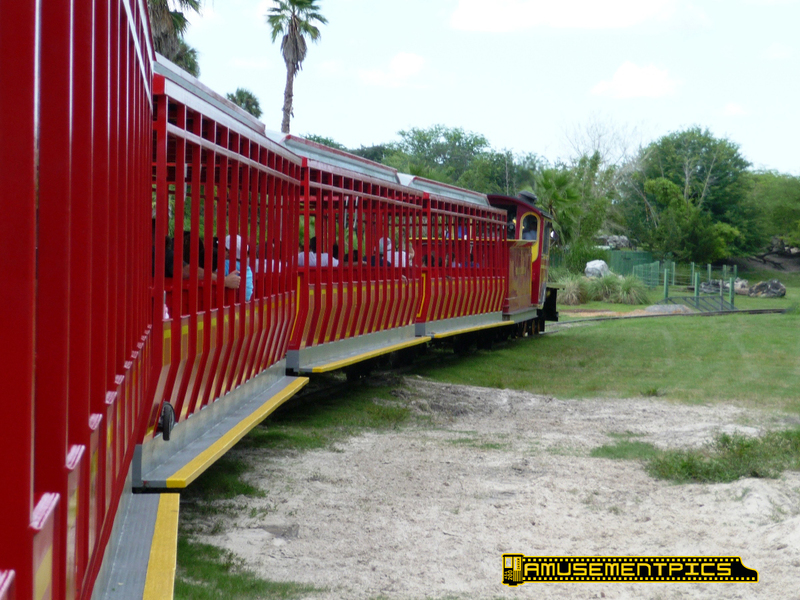 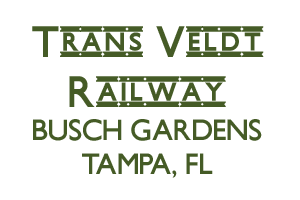 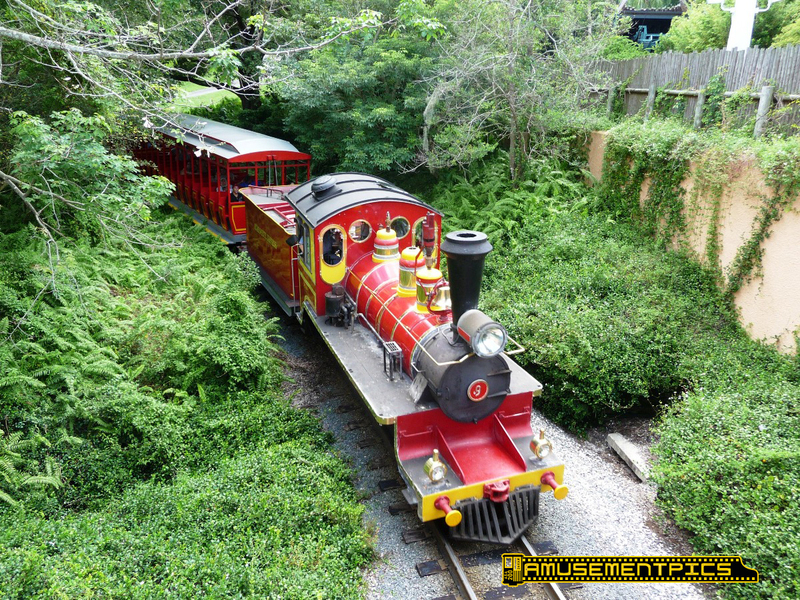 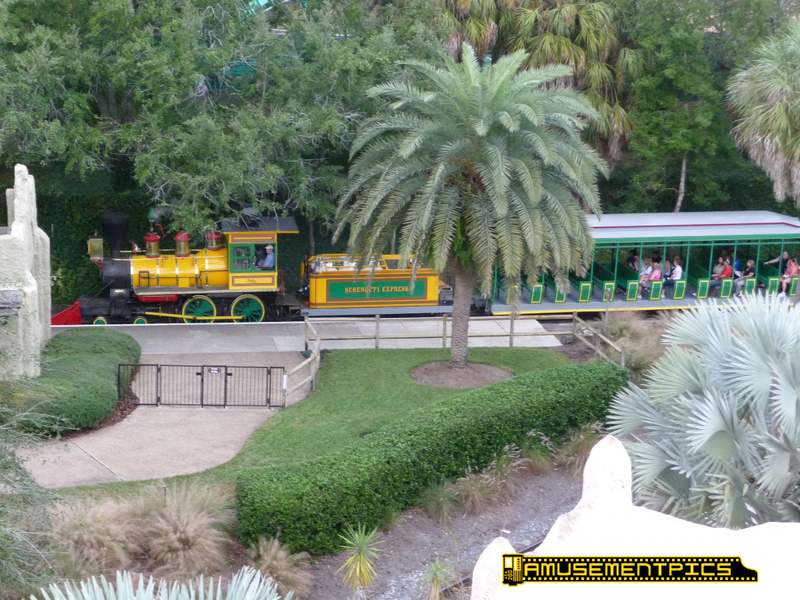 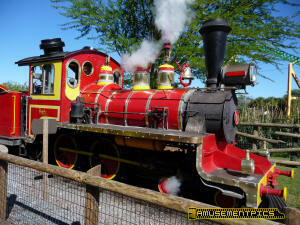 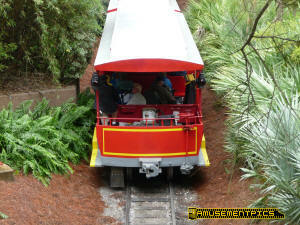 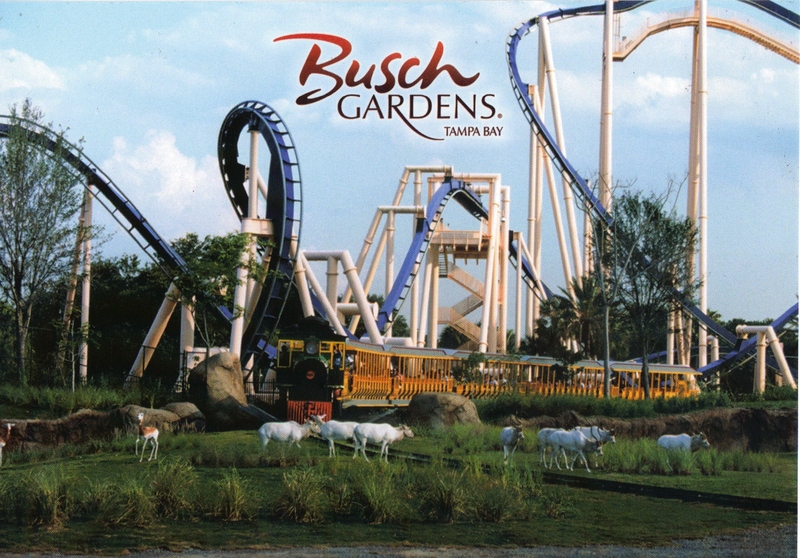 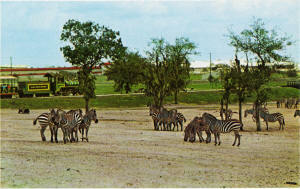 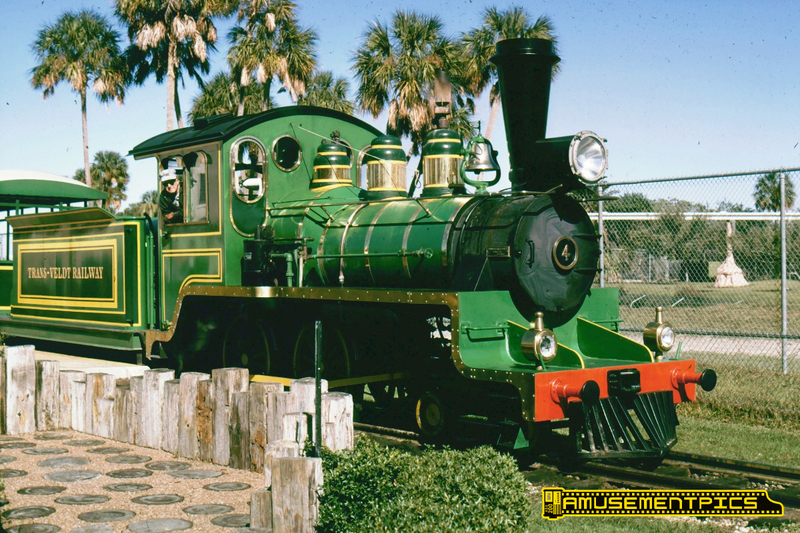 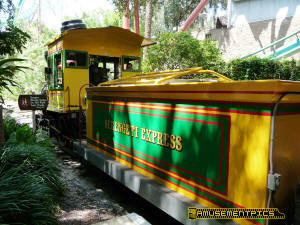 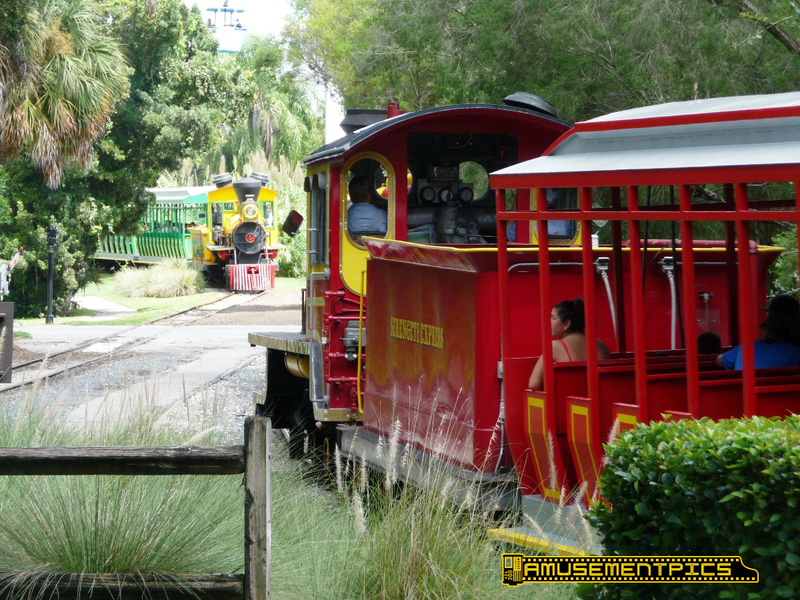 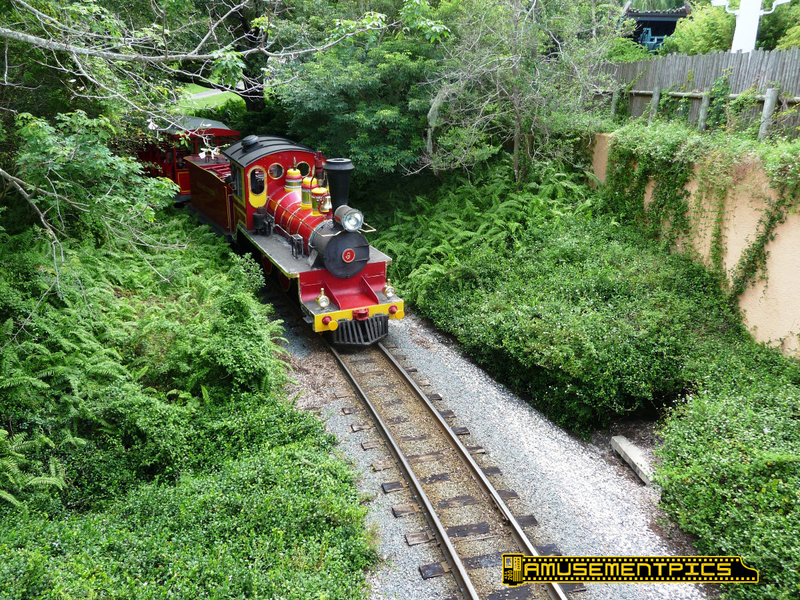 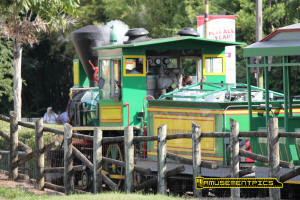 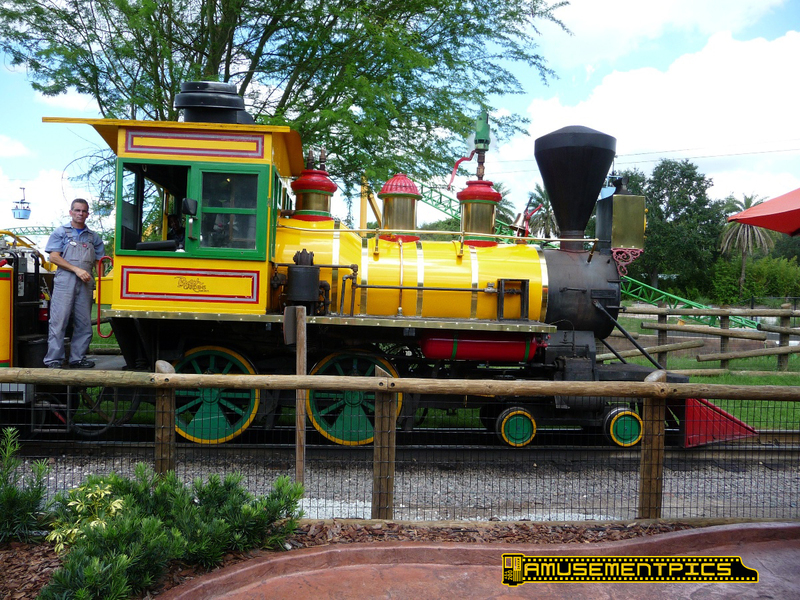 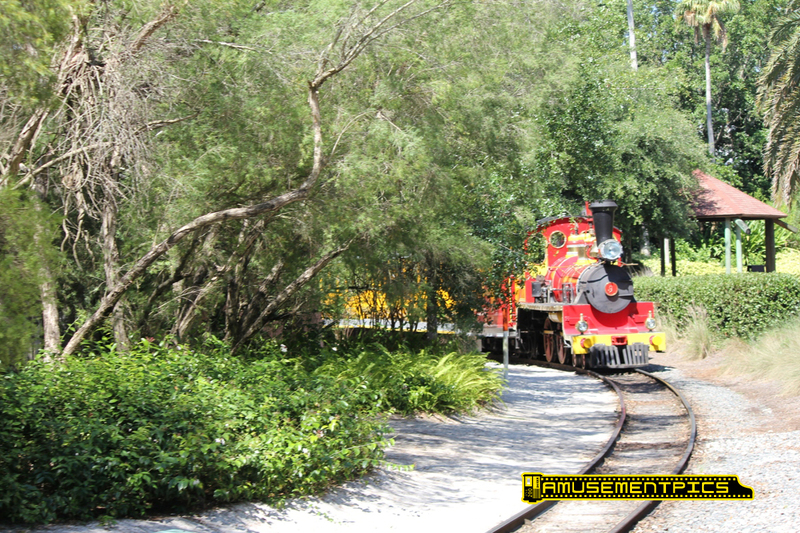 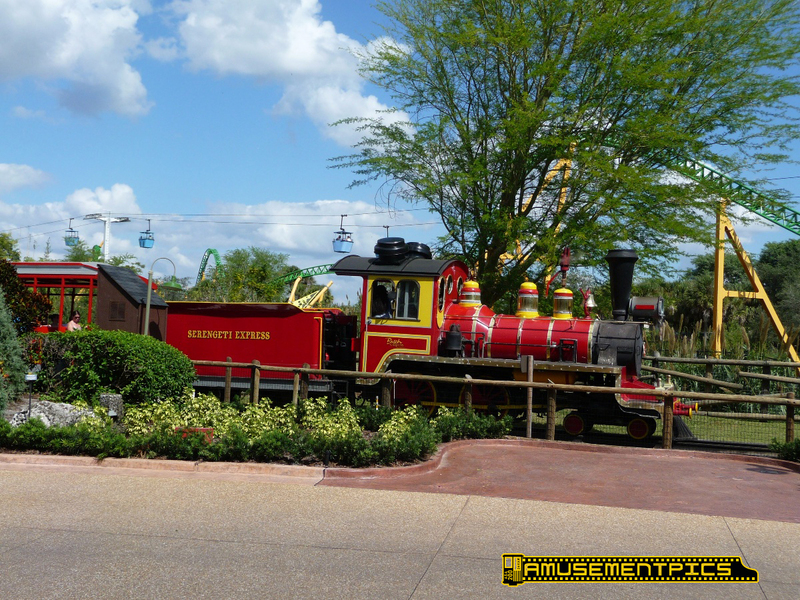 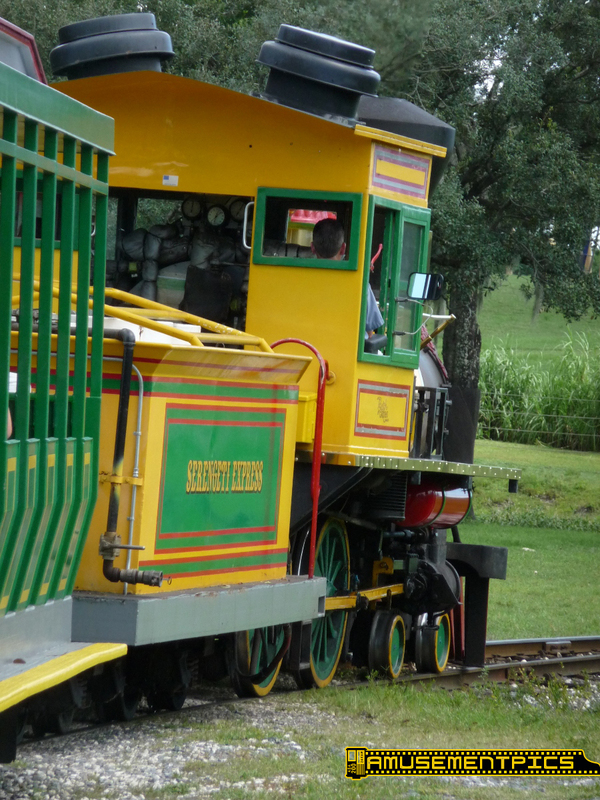 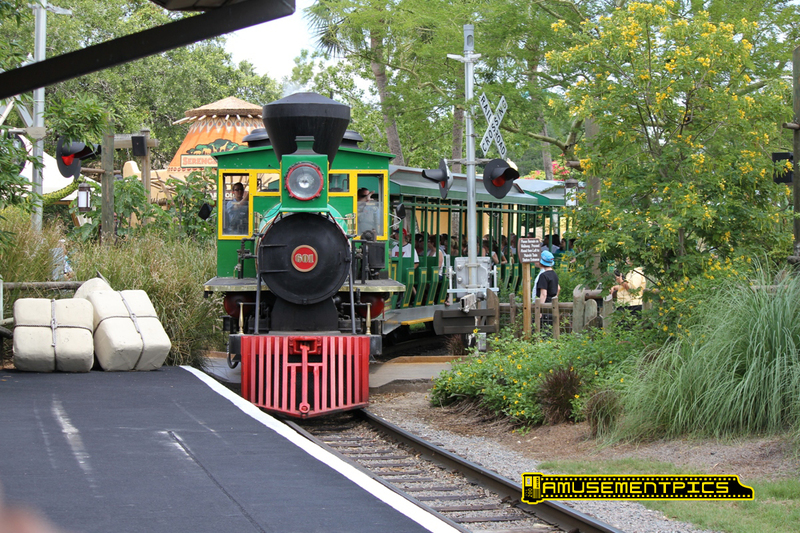 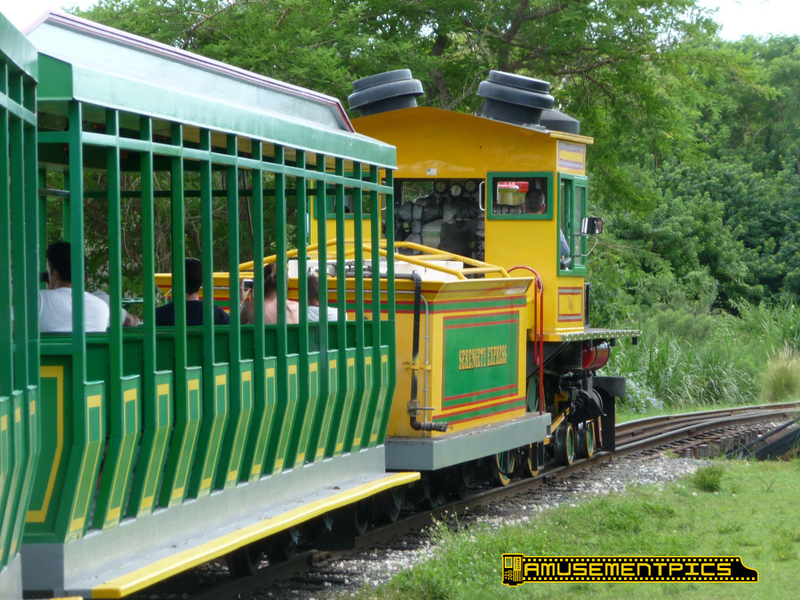 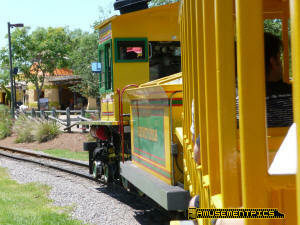 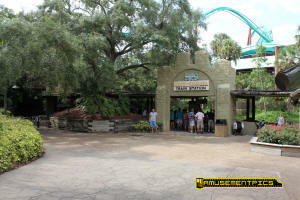 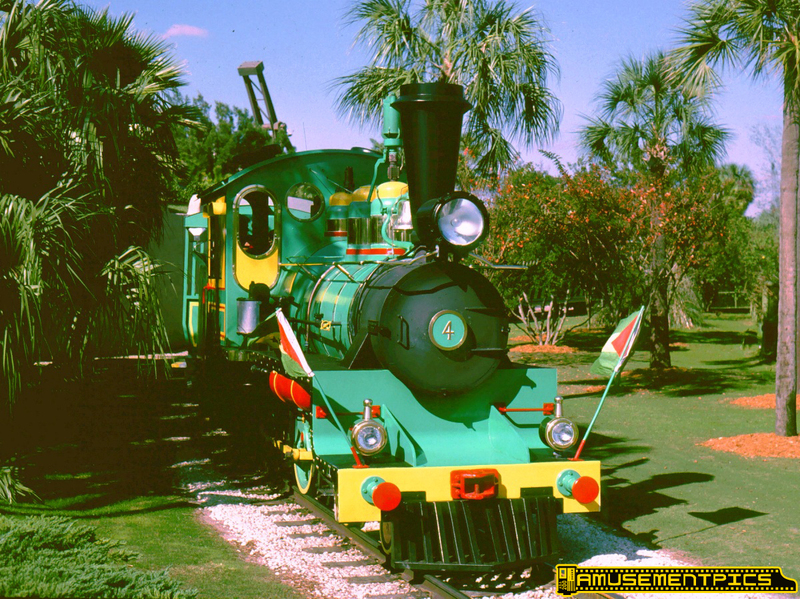 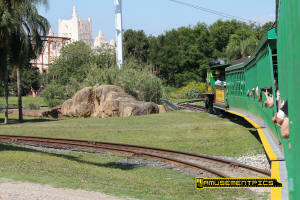 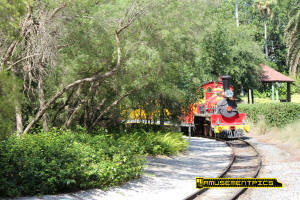 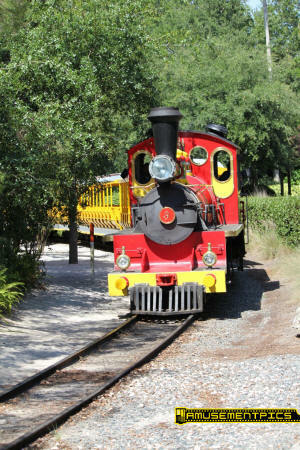 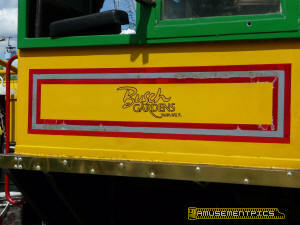 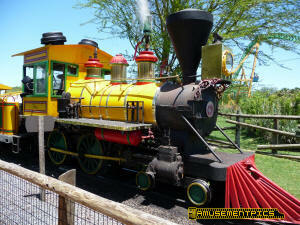 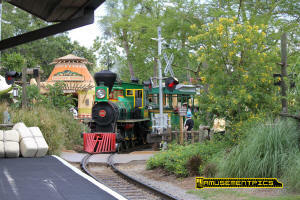 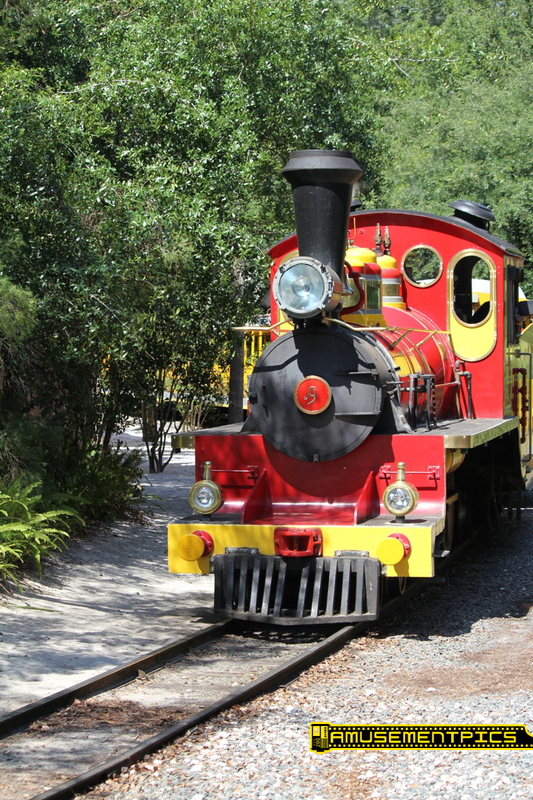 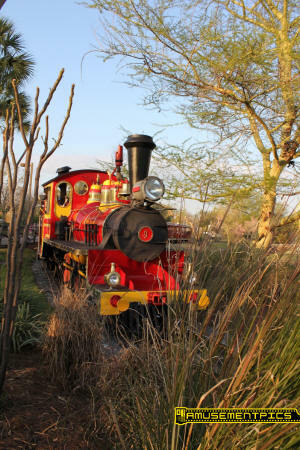 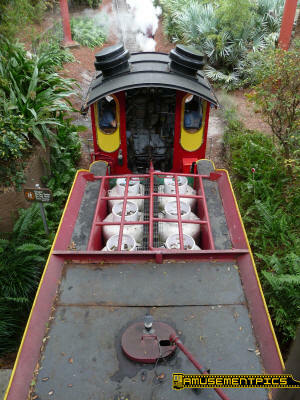 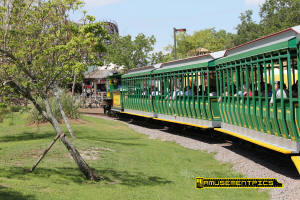 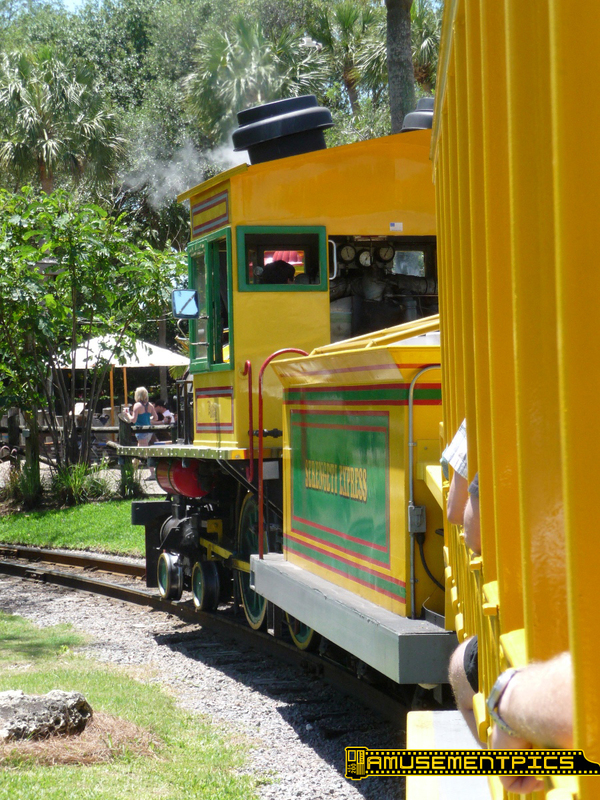 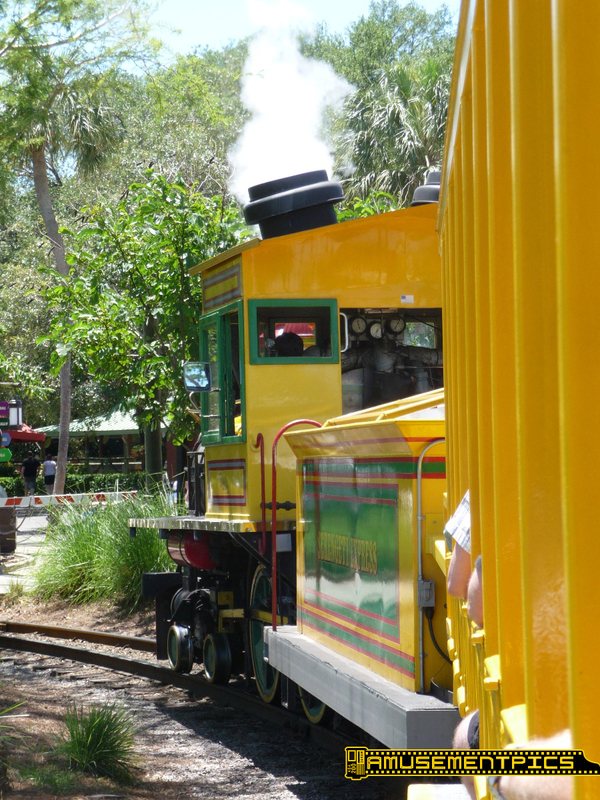 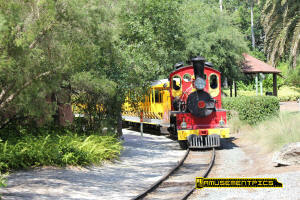 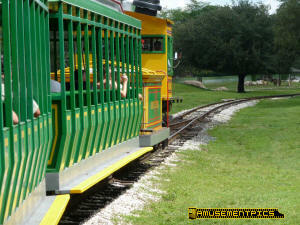 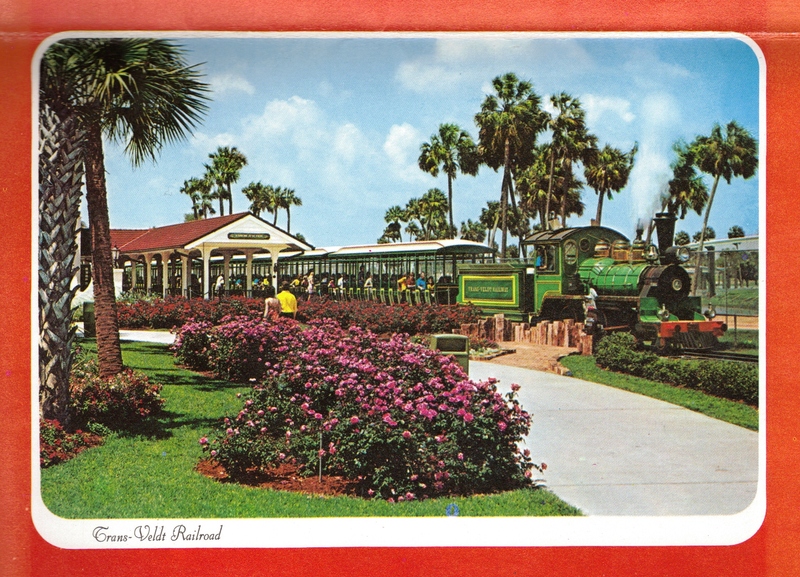 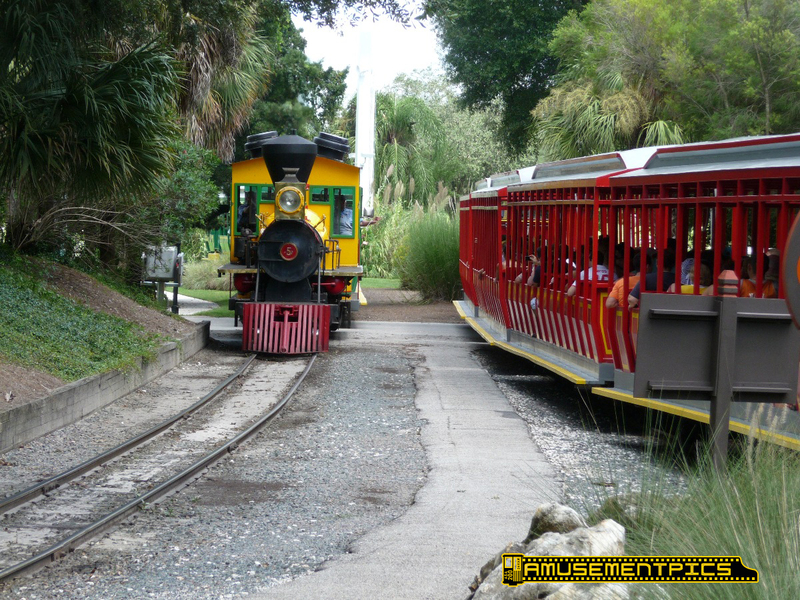 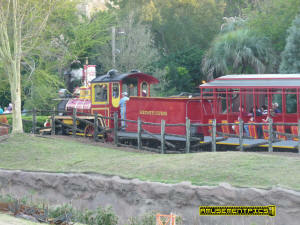 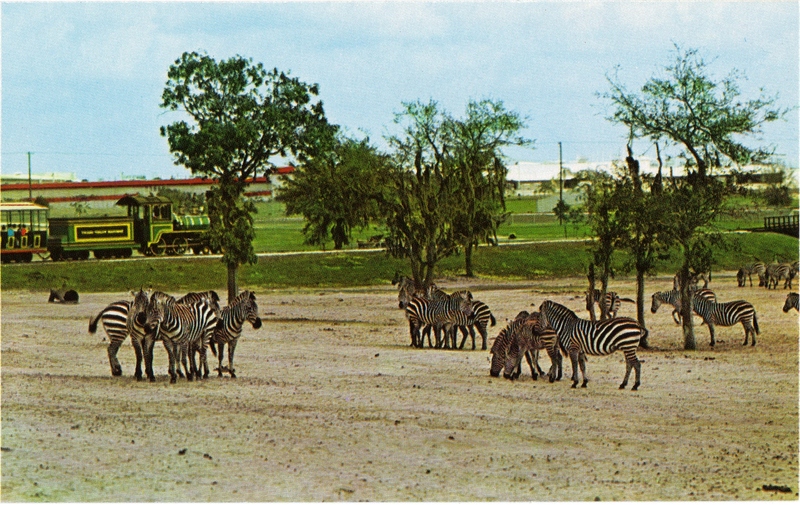 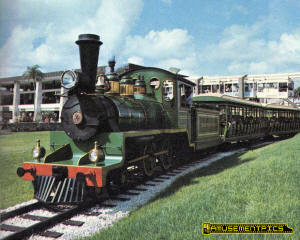 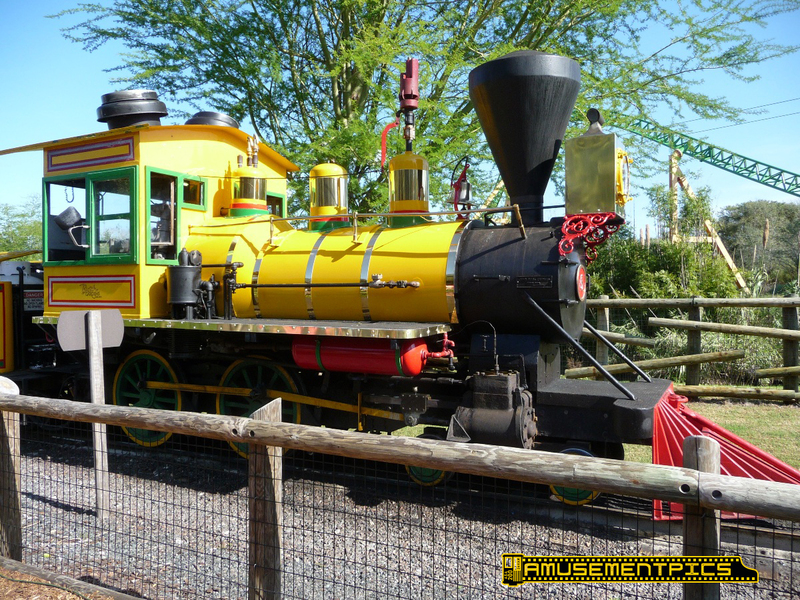 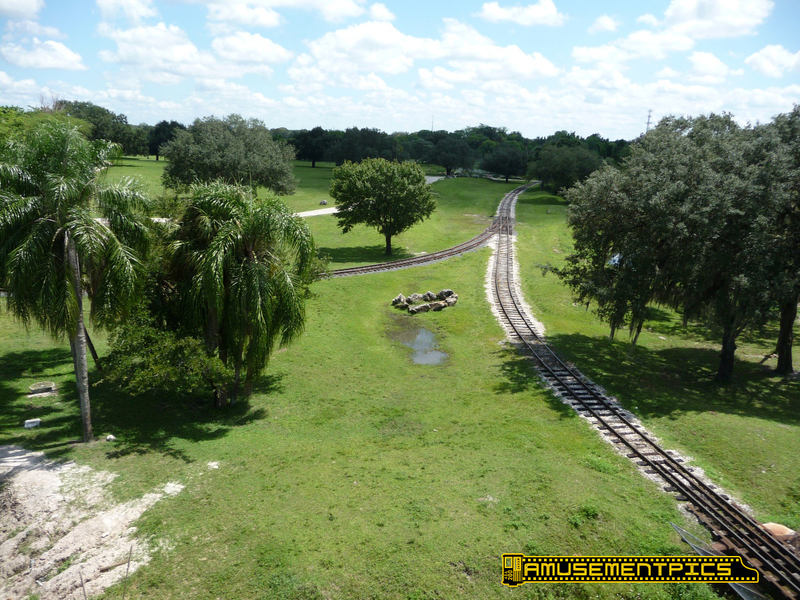 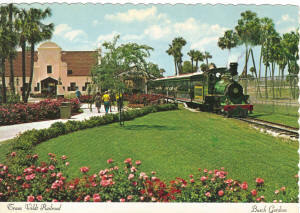 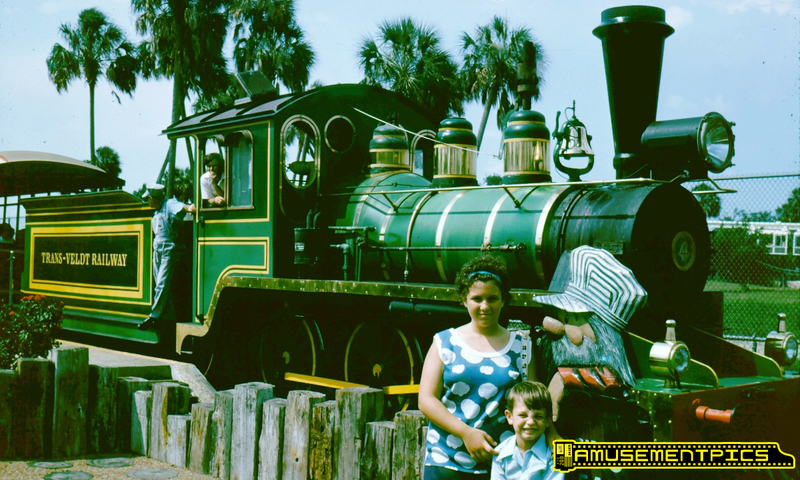 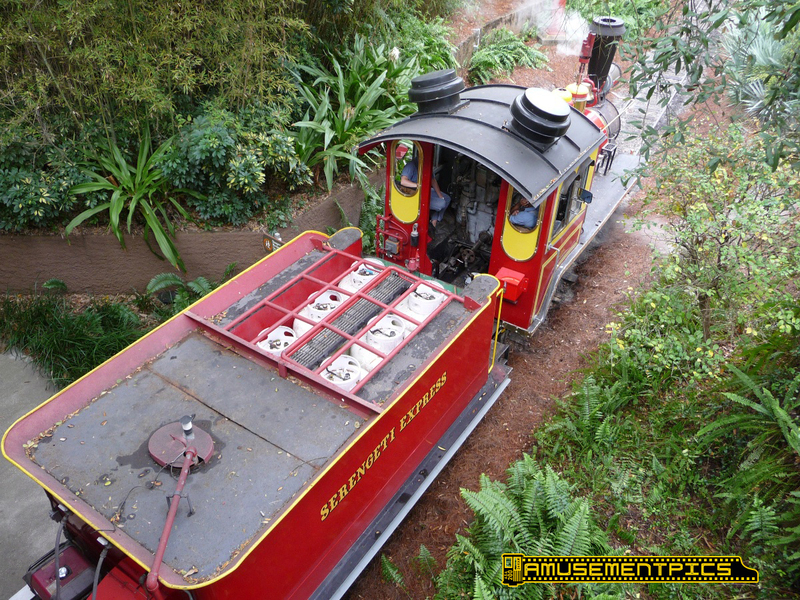 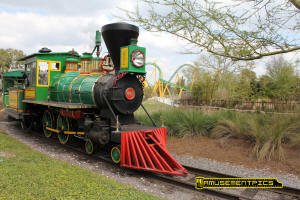 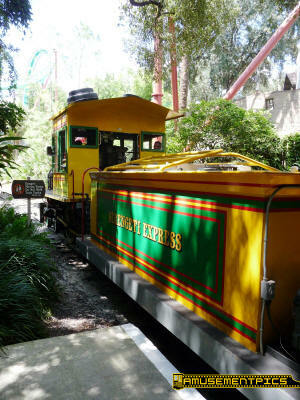 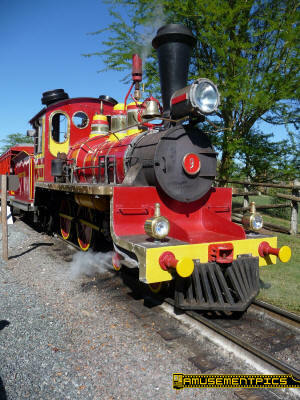 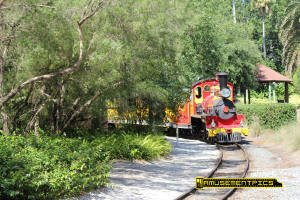 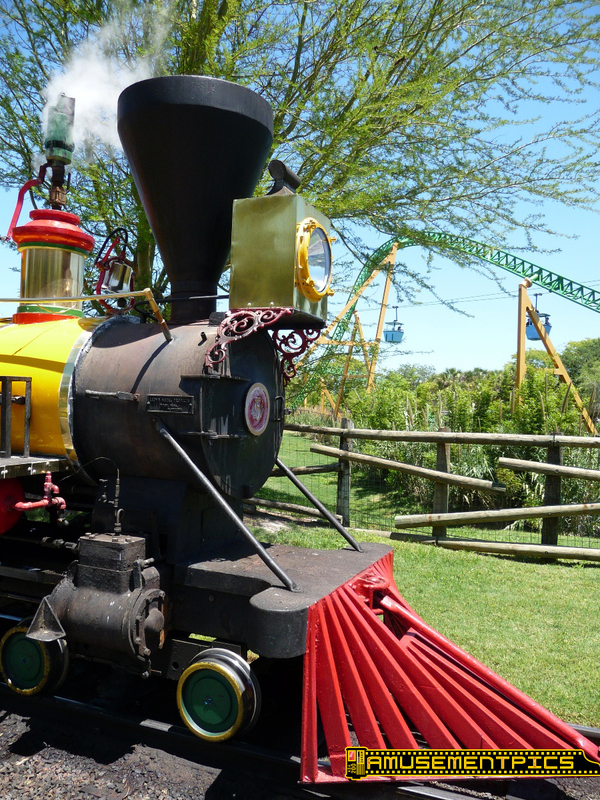 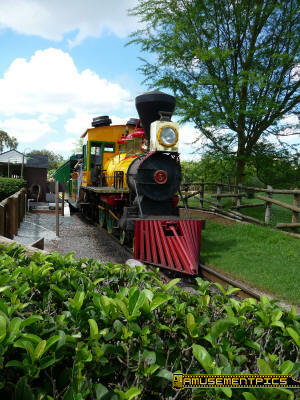 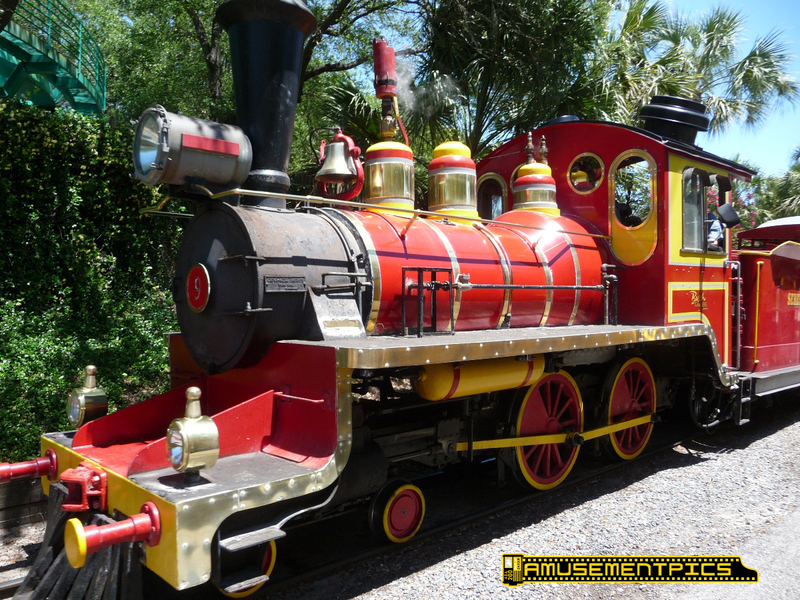 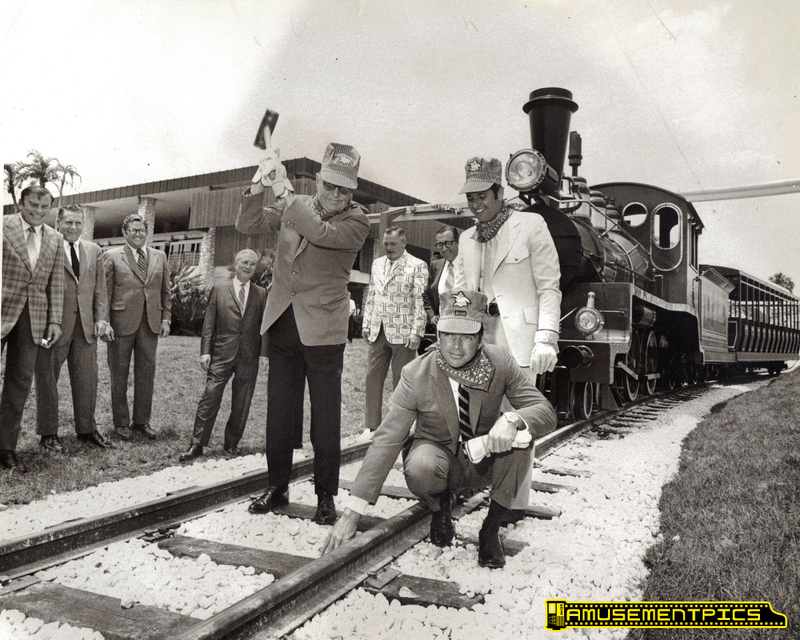 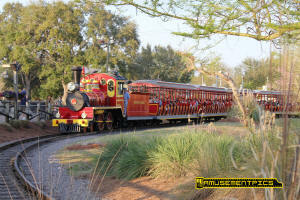 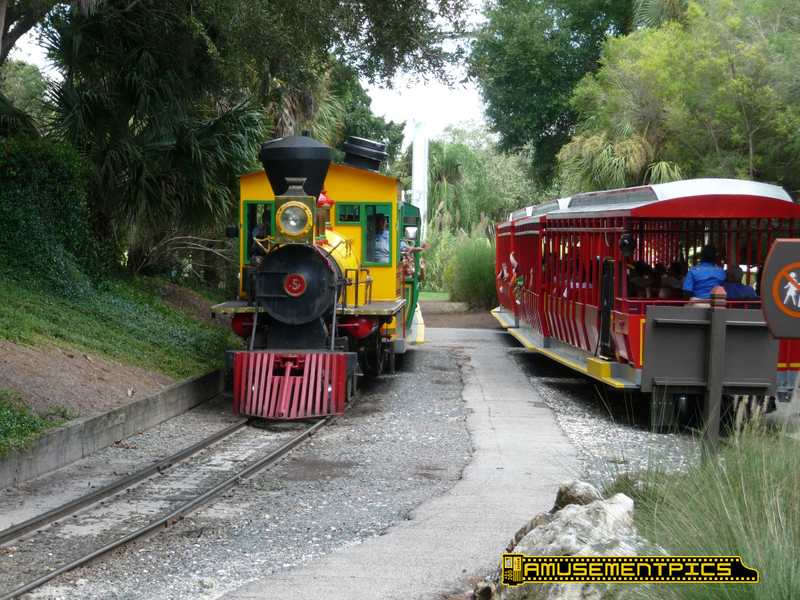 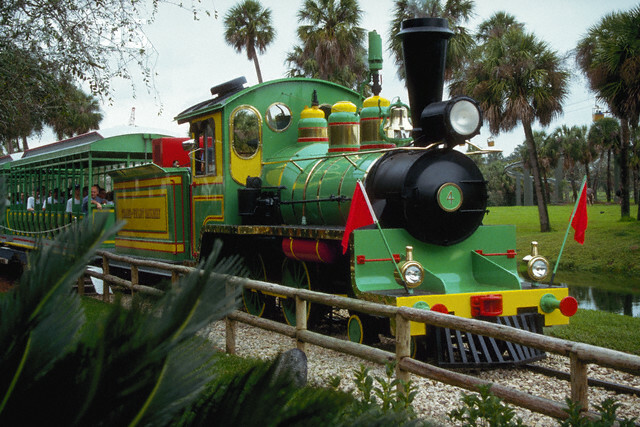 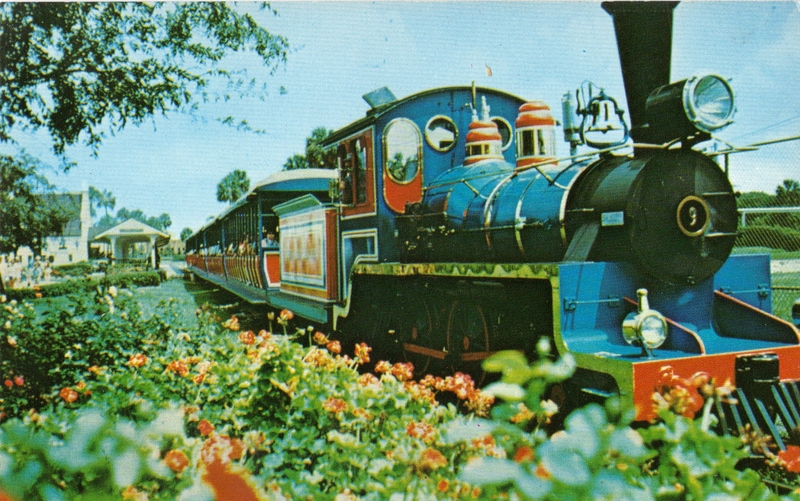 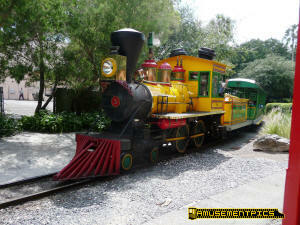 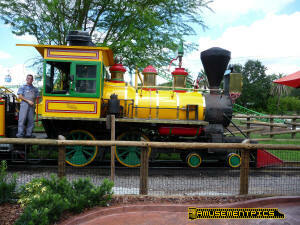 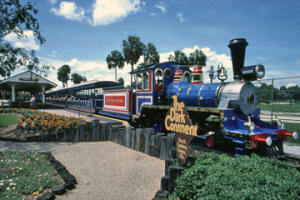 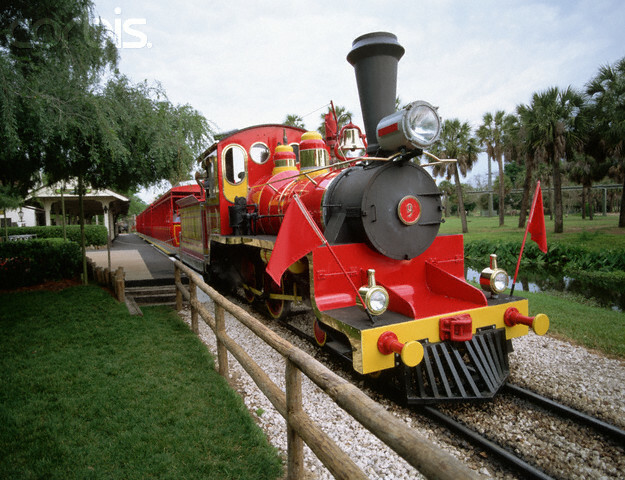 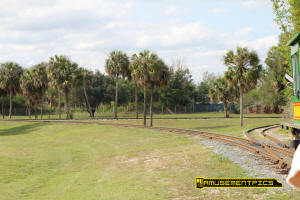 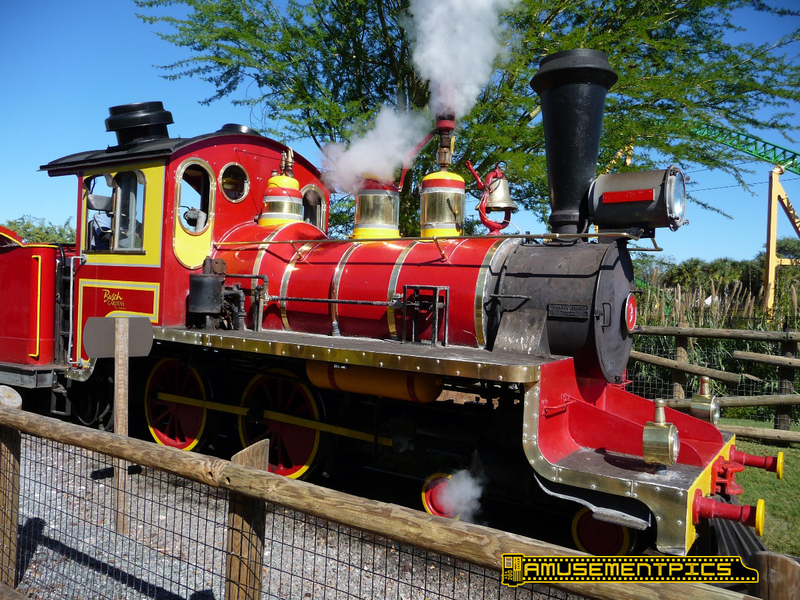 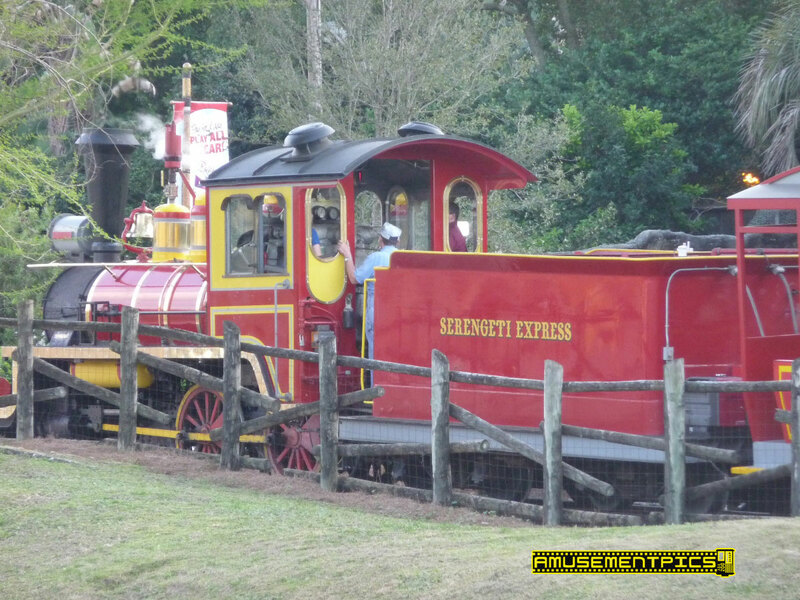 The Busch Gardens Tampa Trans Veldt Railway was introduced in 1971, with custom built trains designed to reflect the African theme of the Wild Animal Kingdom. 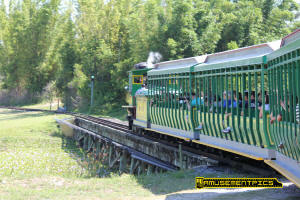 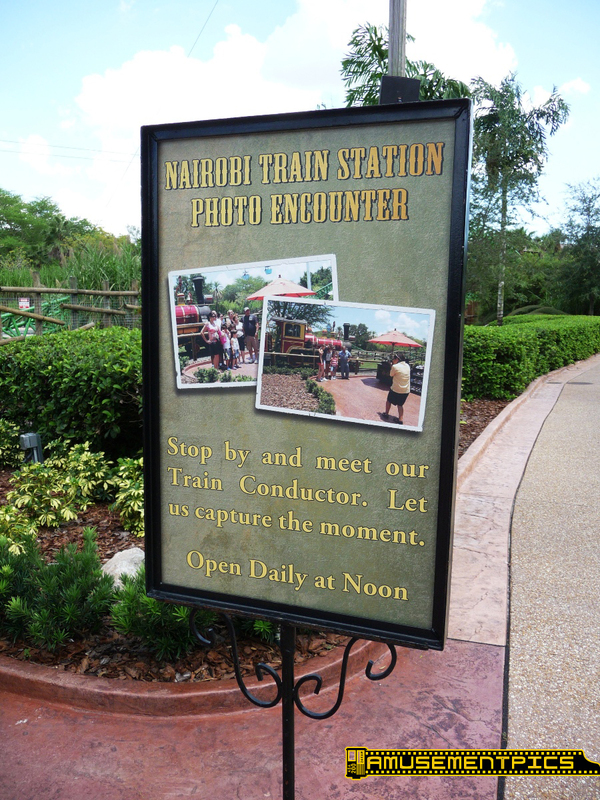 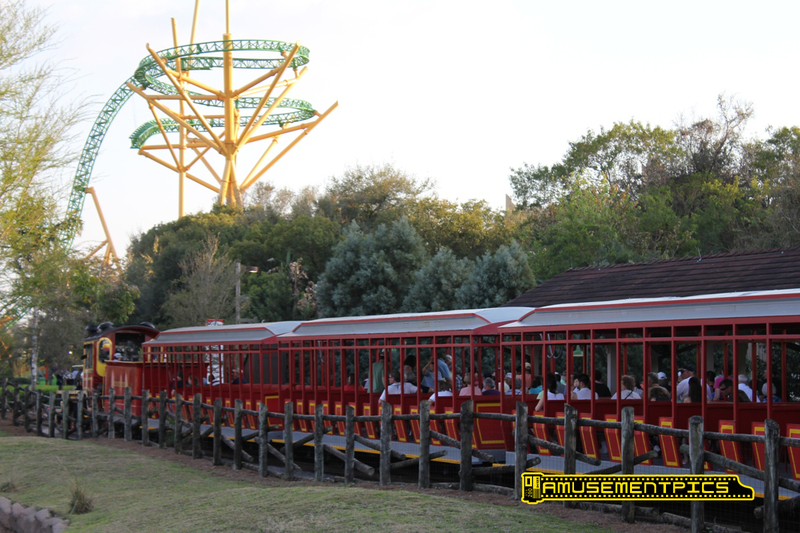 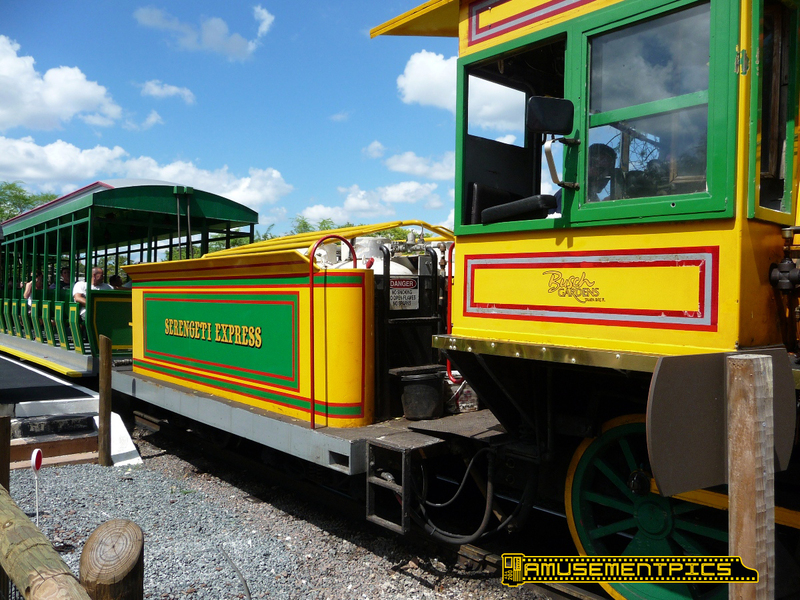 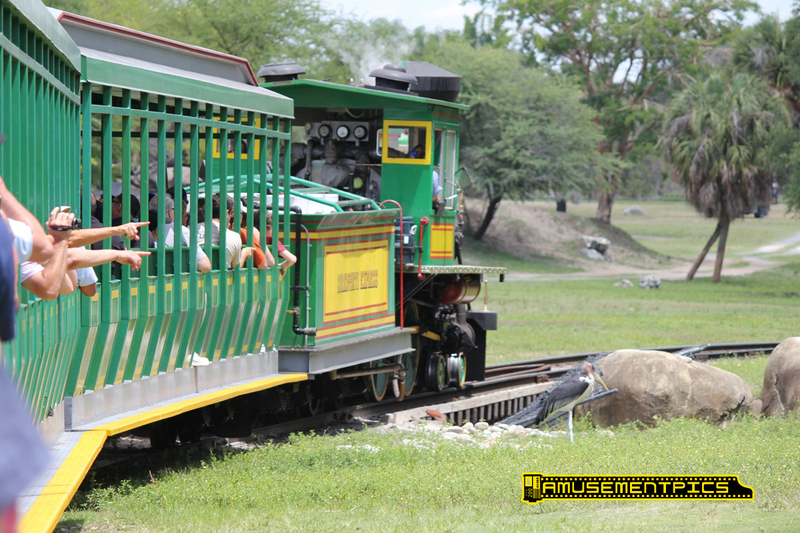 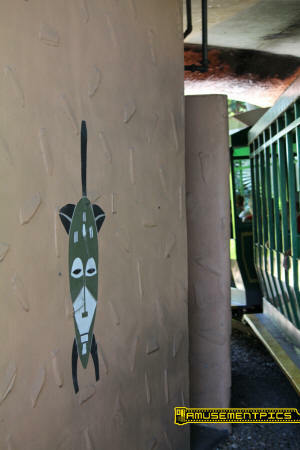 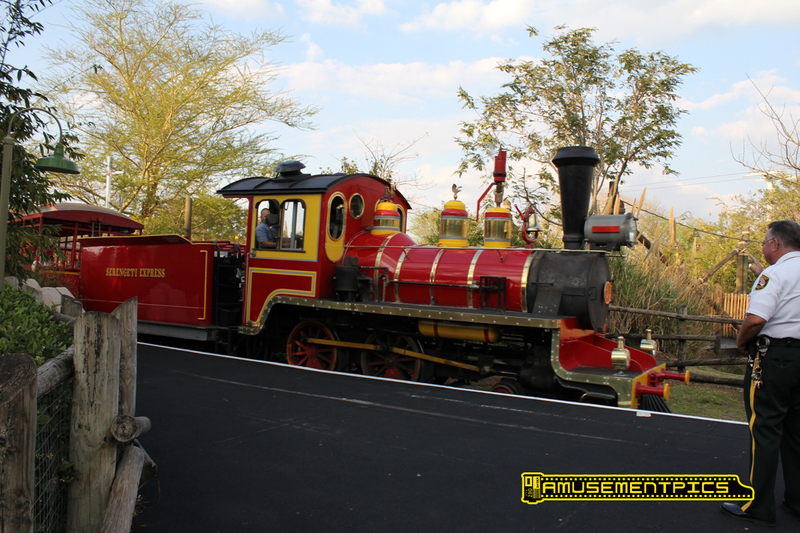 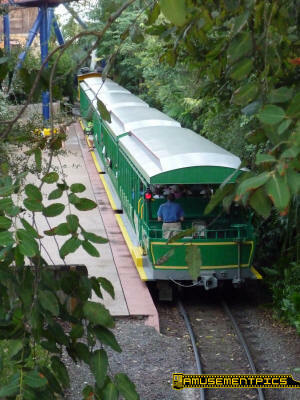 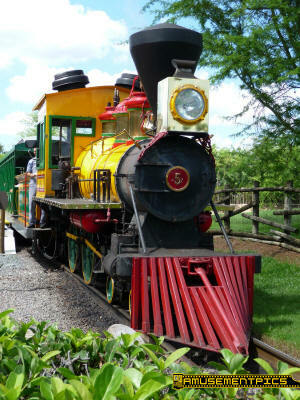 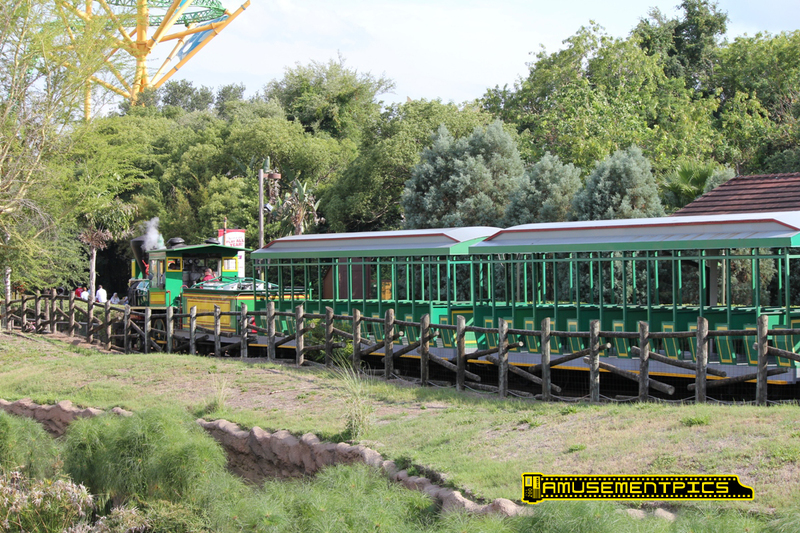 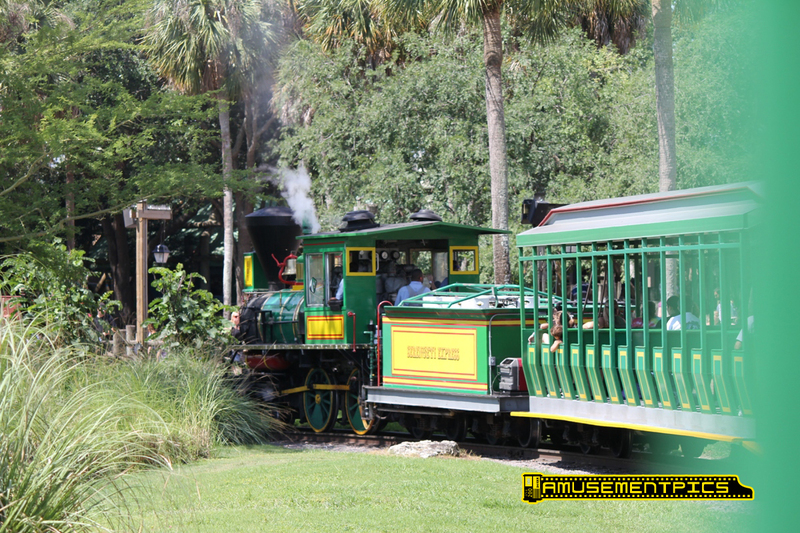 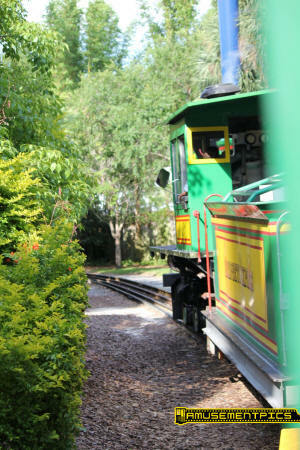 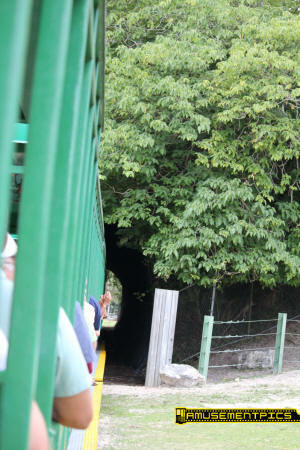 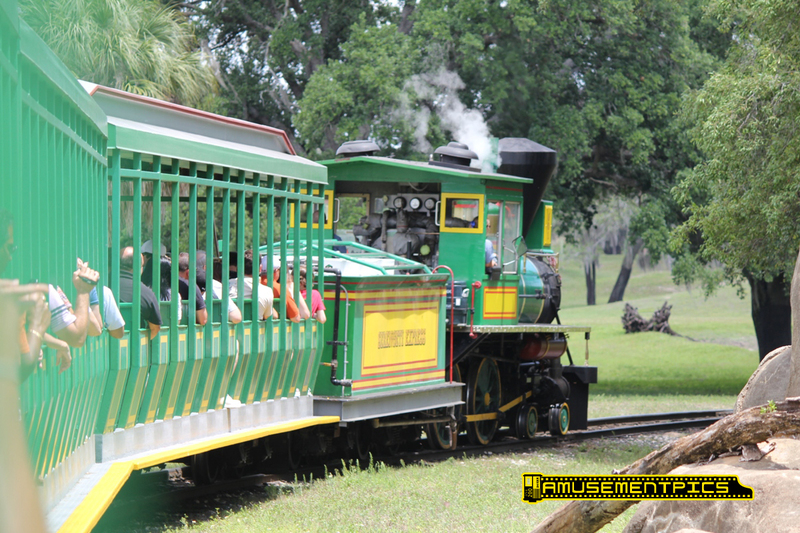 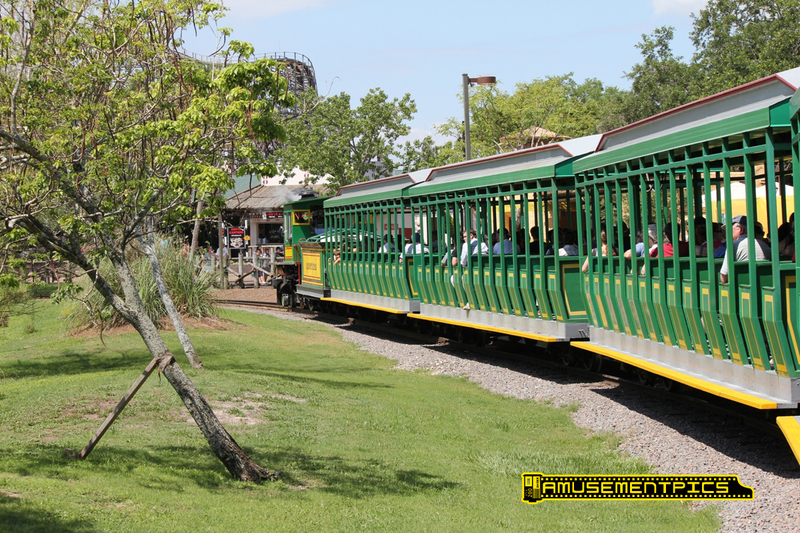 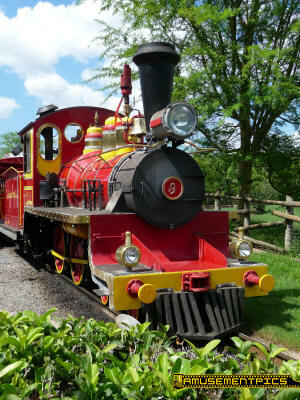 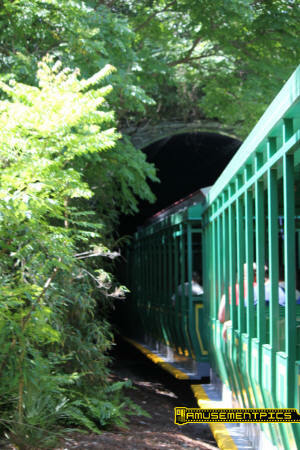 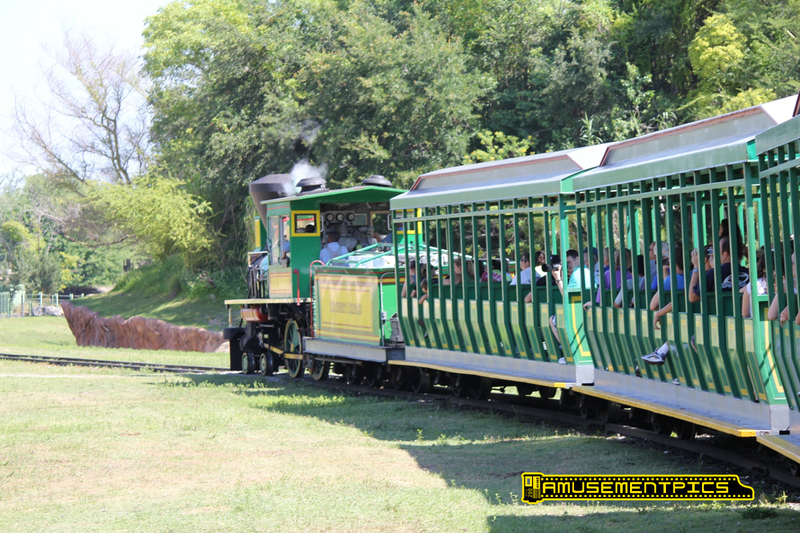 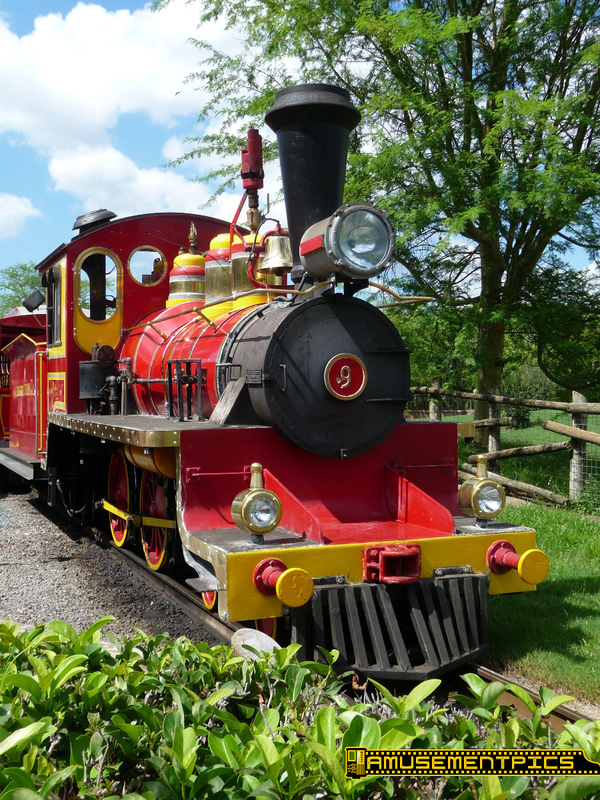 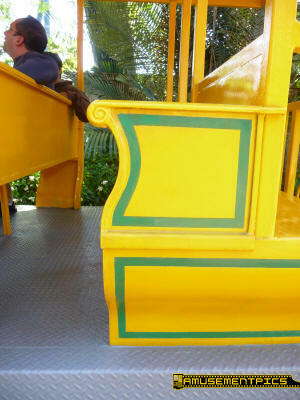 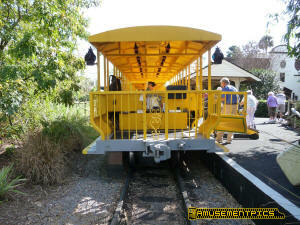 The two trains were designed to serve as transportation for park guests to get around the sprawling park as well as to offer unique views of the animal areas along the park's "Serengeti Plain". 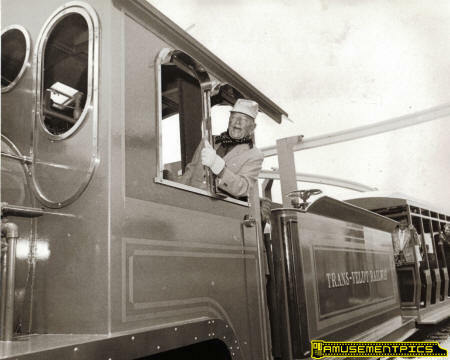 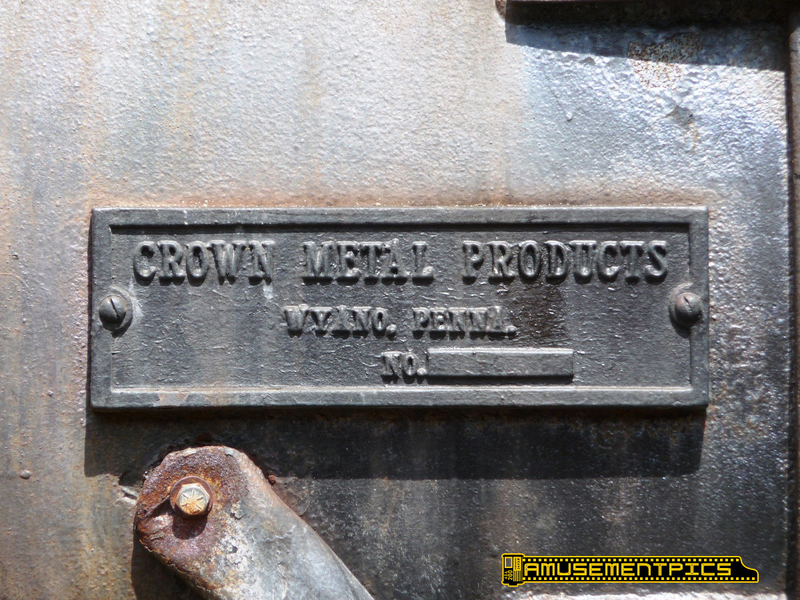 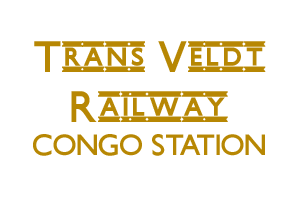 The Trans Veldt Railway cost $1 million to build and featured two locomotives that were built by Crown Metal Products, using the standard chassis and boilers that most of the 36" Crown locomotives used. 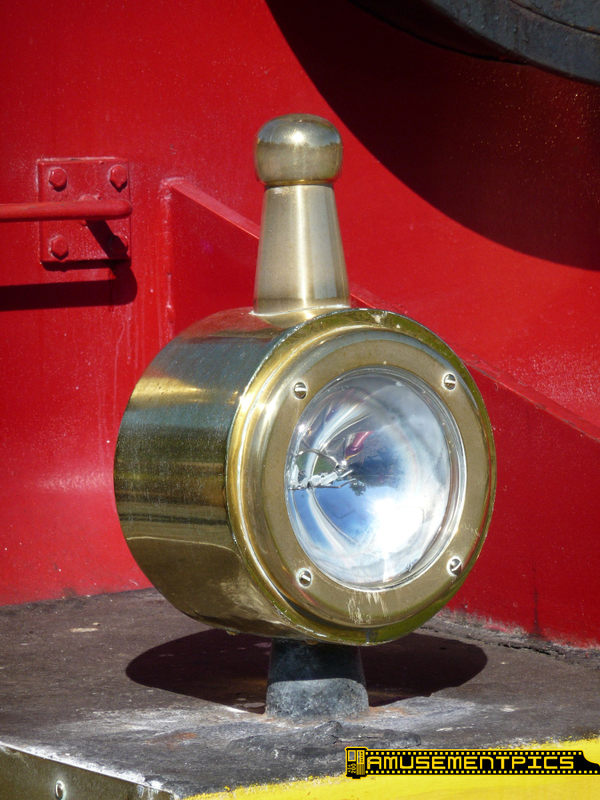 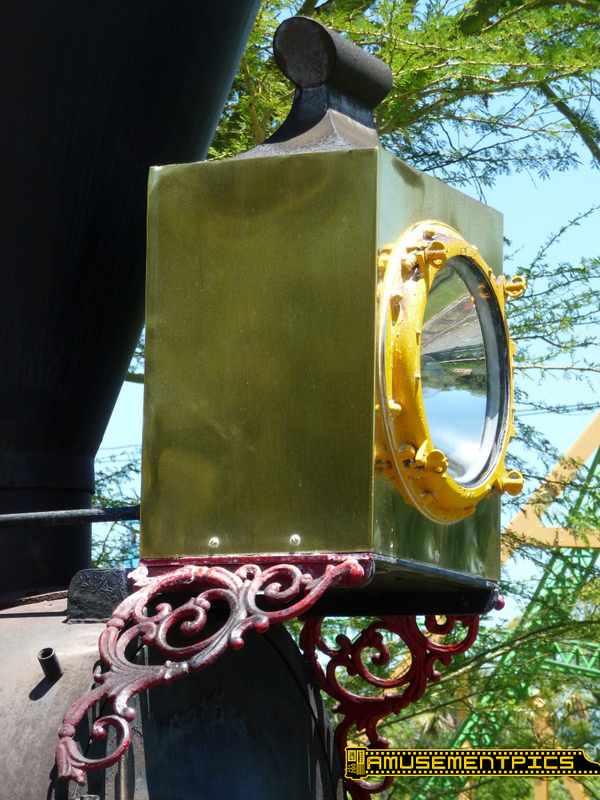 The African styling of the locomotives was created with details like European style buffers and cowcatchers, brass marker lamps, arch roofed cabs and round windows. 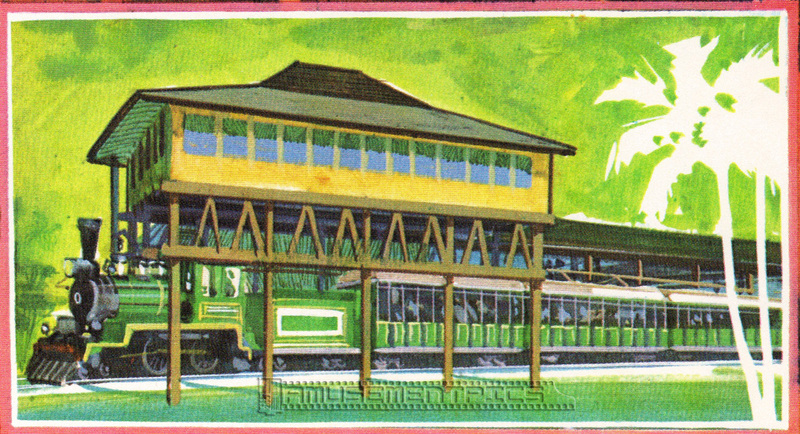 The two locomotives were built nearly identically, with the #4 locomotive featuring 3 domes, and the #9 only featuring two initially, though a third was added in later years. 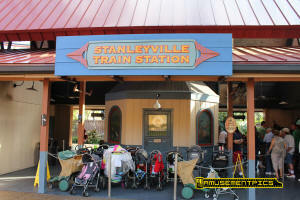 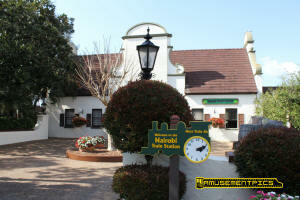 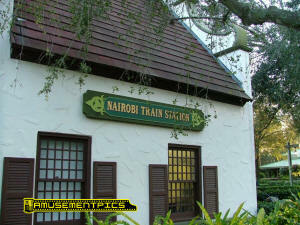 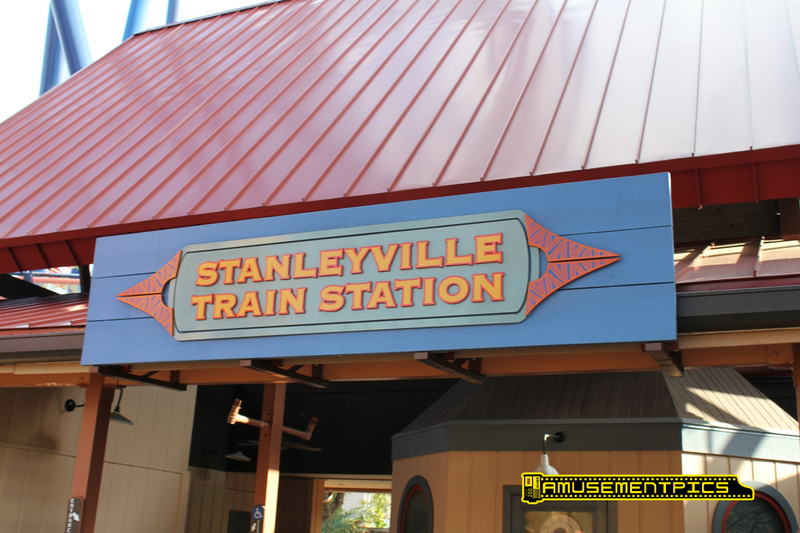 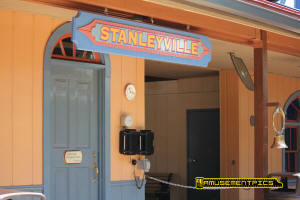 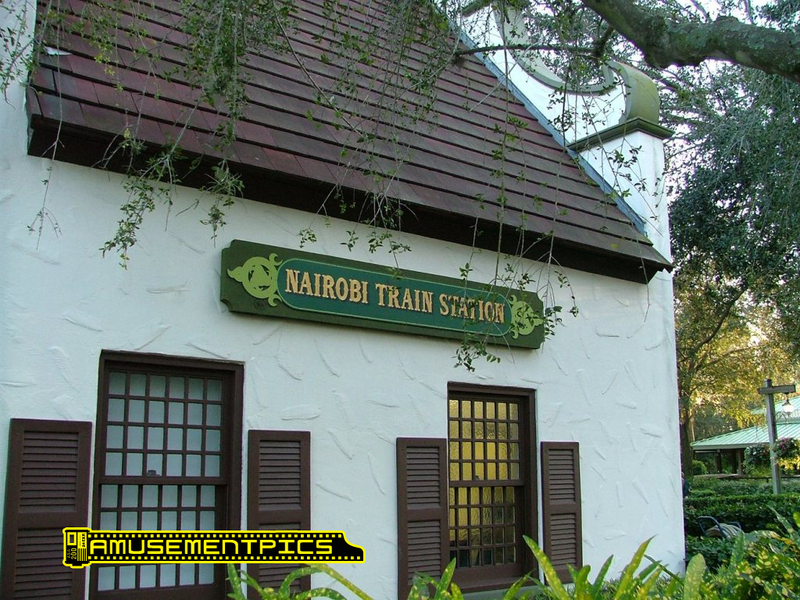 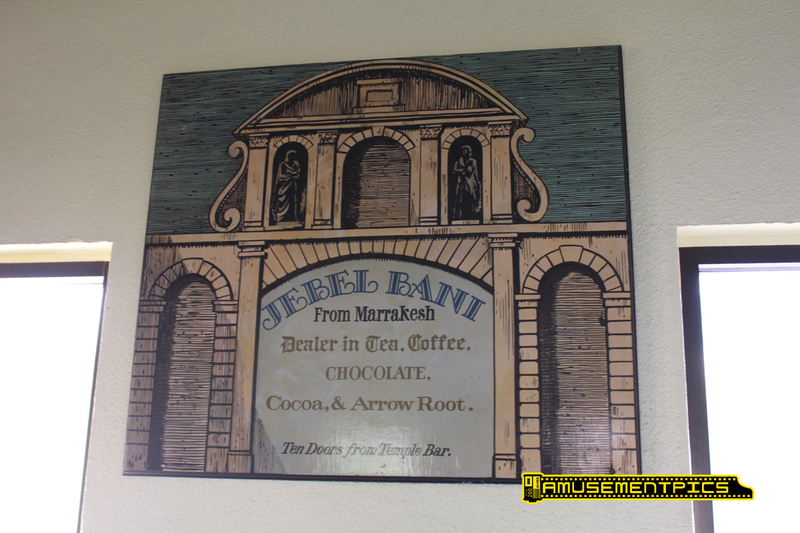 When the Railway was built, the park's attractions all had separate tickets and the two stations in Nairobi and Stanleyville had working ticket windows. 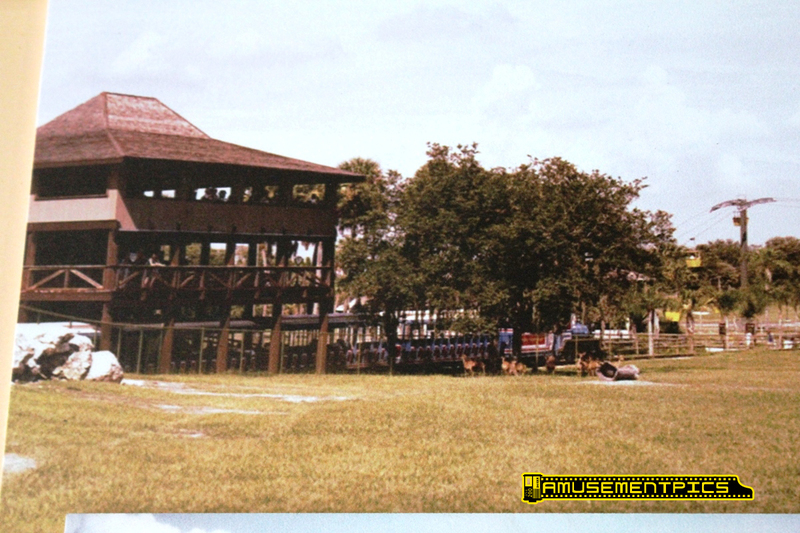 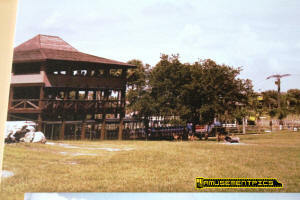 In July of 1971 the ticket price for the 25 minute ride was $1.00 per adult and $.50 for children 6-12. 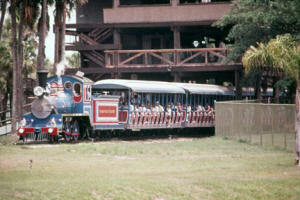 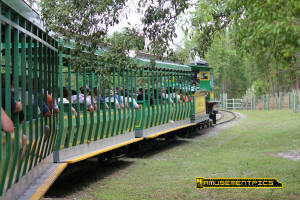 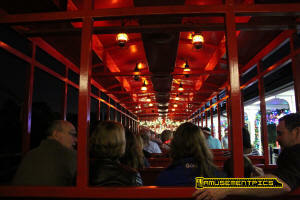 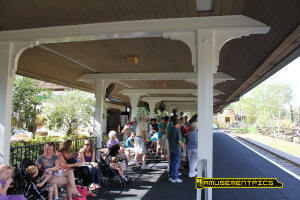 The trains had a capacity of 80 guests per car for a total of 400 per train. 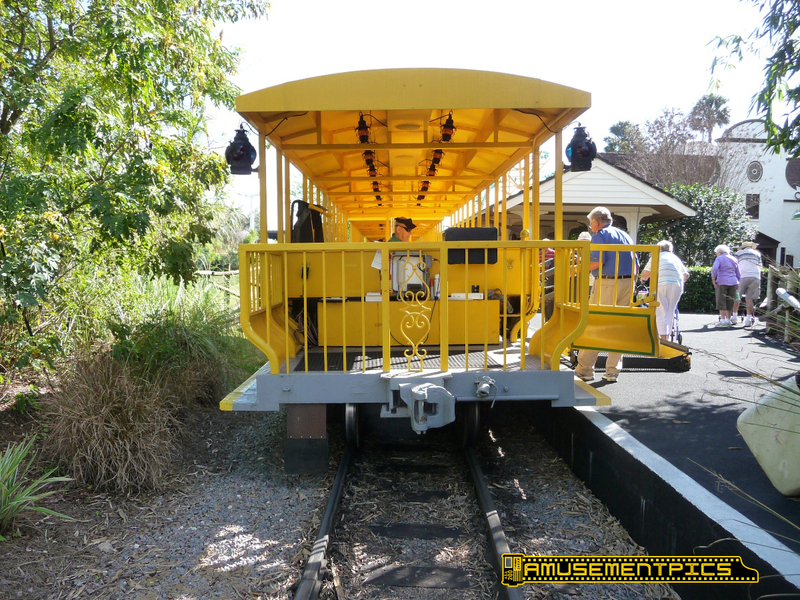 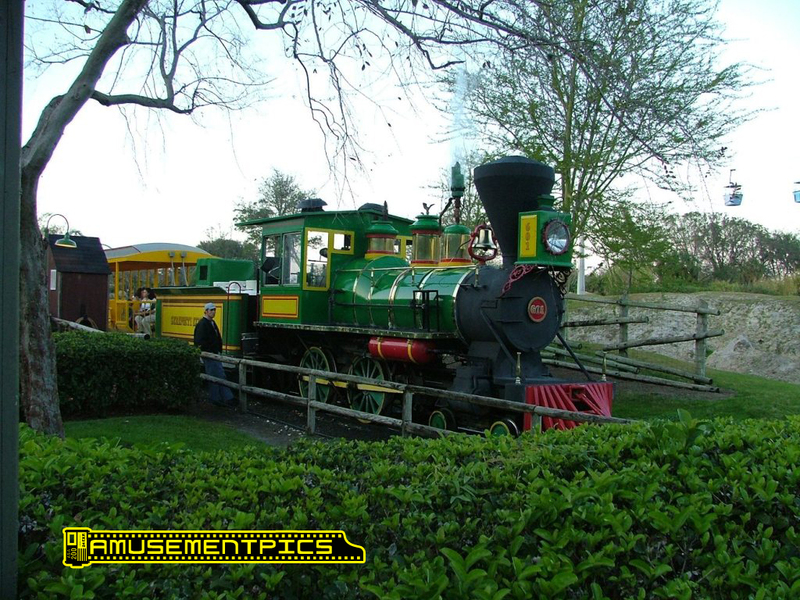 Over the Railway's 40 year history many changes have taken place as the park has expanded and additional stations and equipment have been added to keep up with the needs of the popular park. 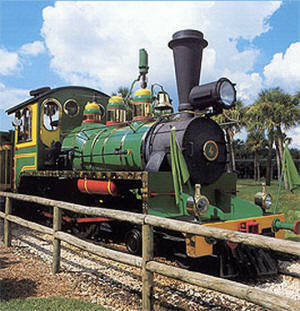 Two additional American style Crown locomotives were acquired over the years, along with one additional train, allowing three trains to run on the line at once for peak crowds. 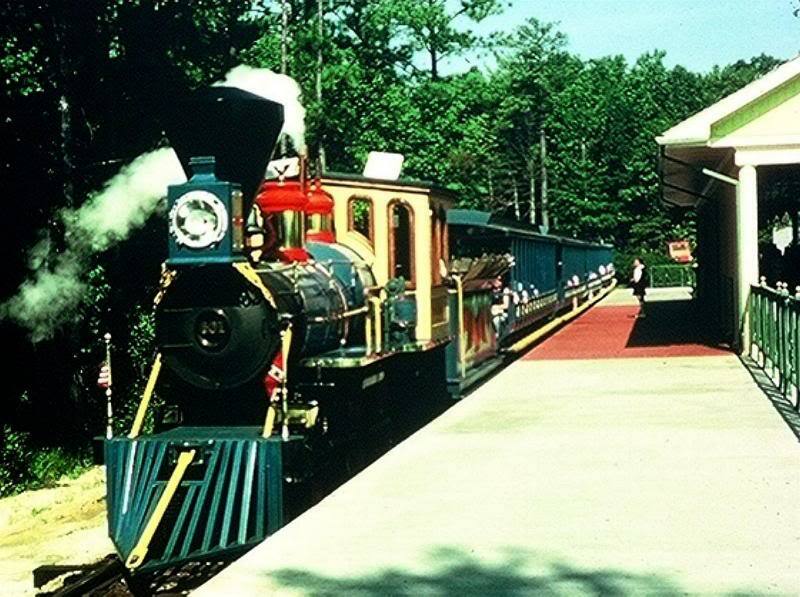 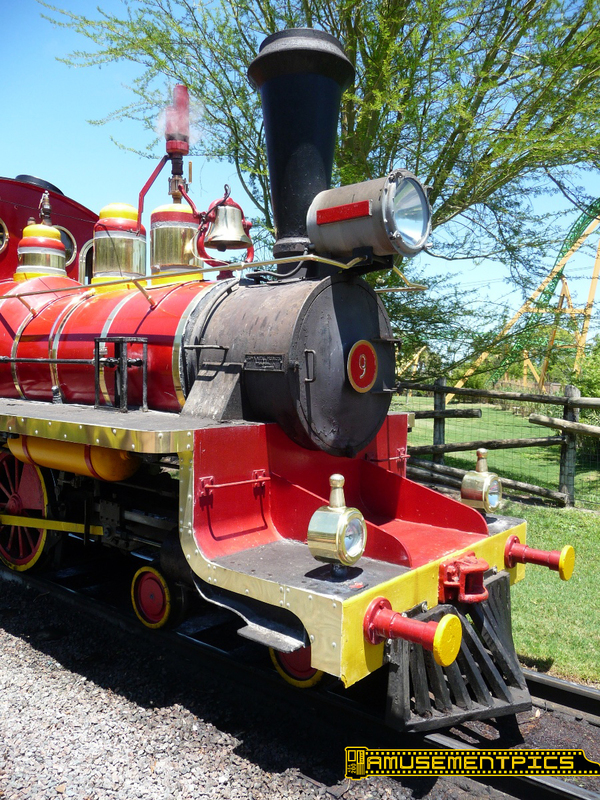 The #601 engine and train were acquired from Kings Dominion in Virginia and the #5 engine was acquired from Six Flags Over Mid-America. 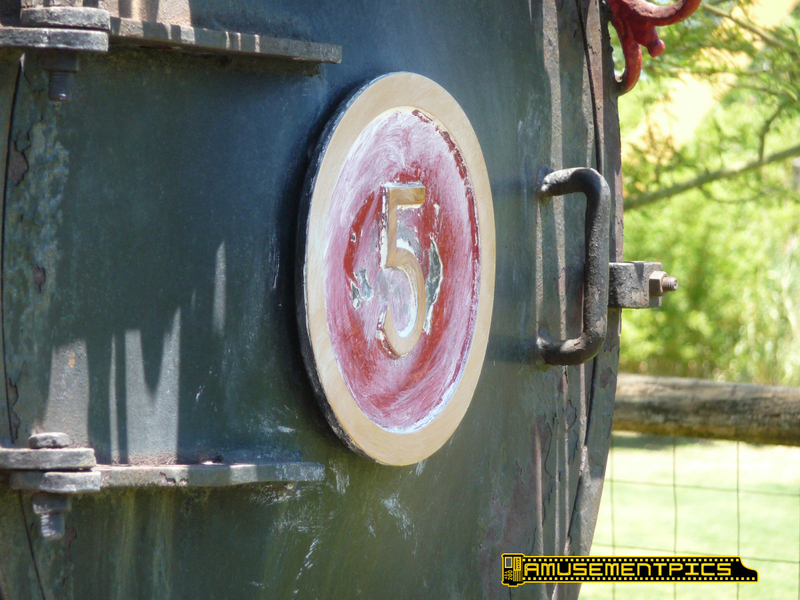 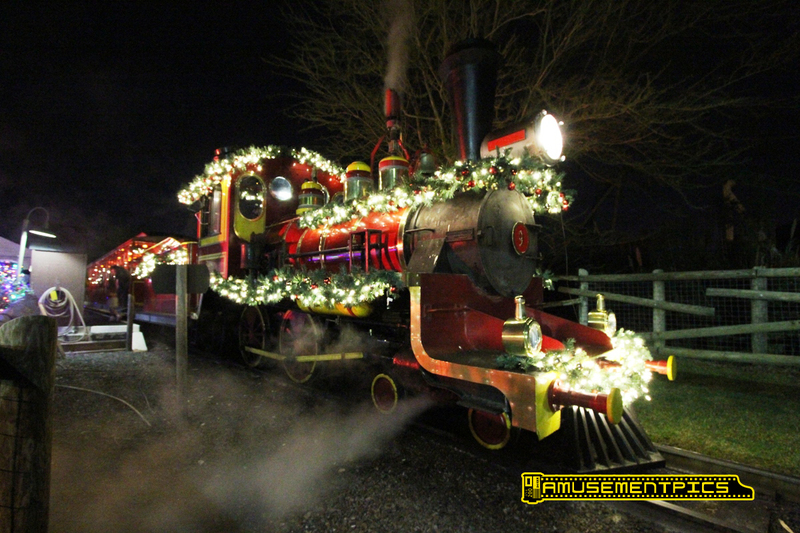 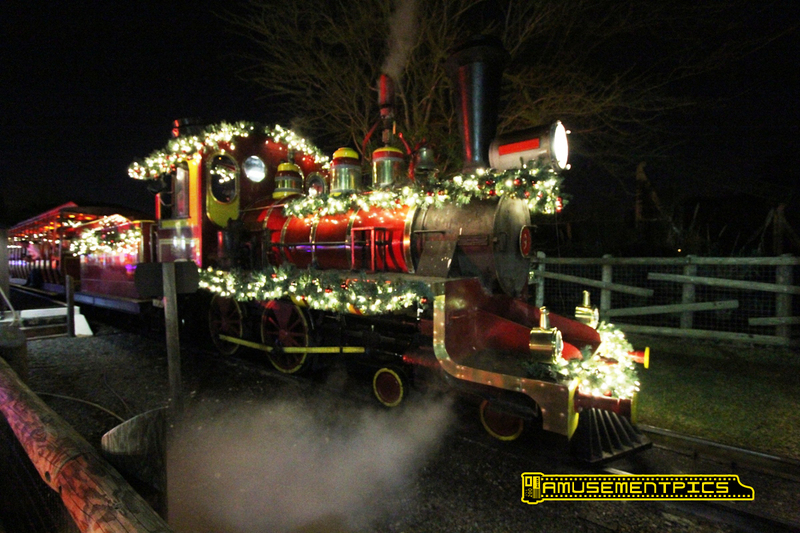 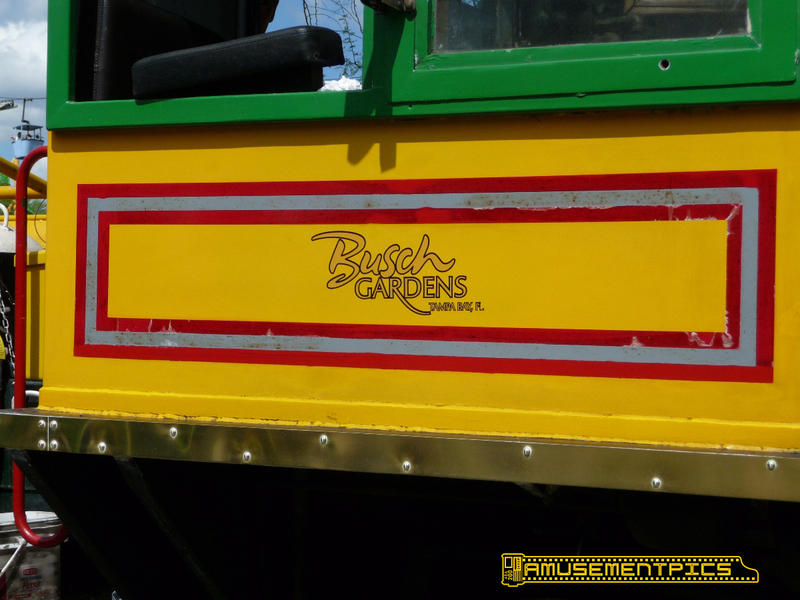 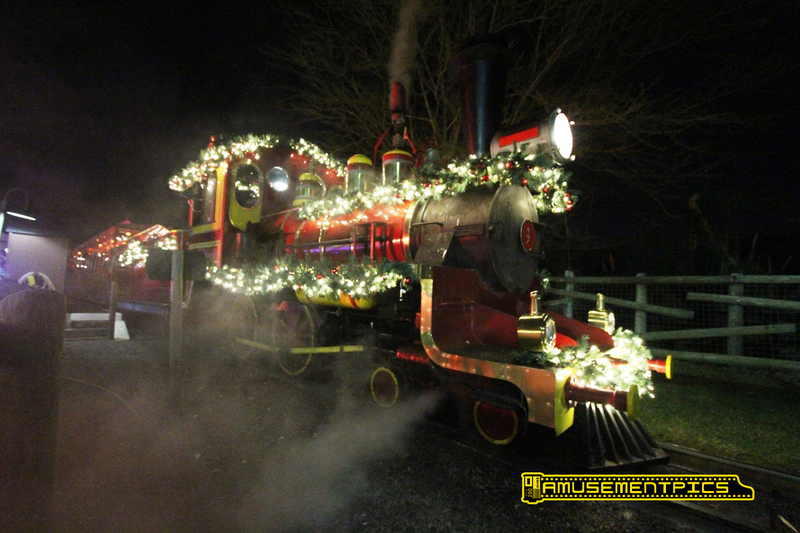 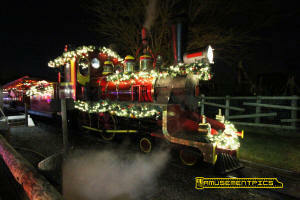 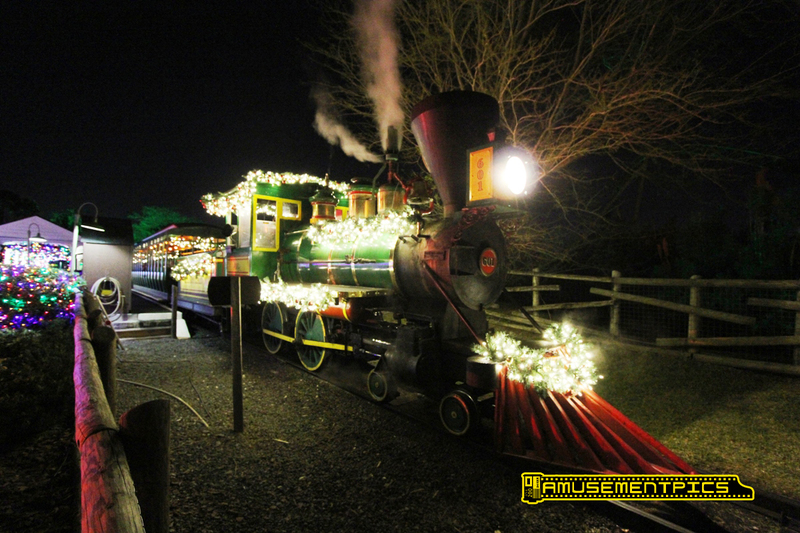 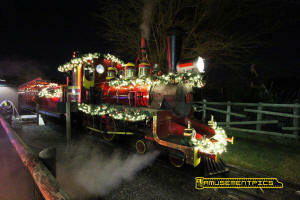 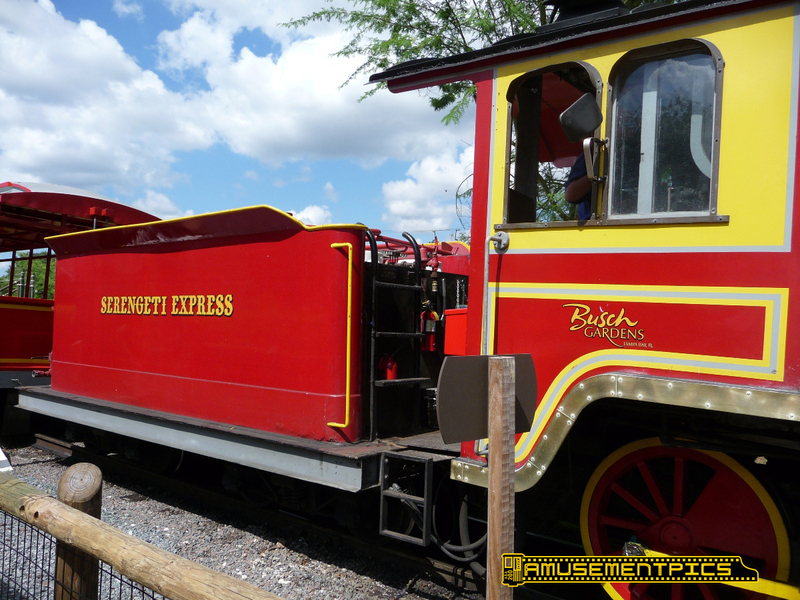 The train that originally belonged to the #5 was sent to Busch Gardens Williamsburg where it became part of the Alpine Express. 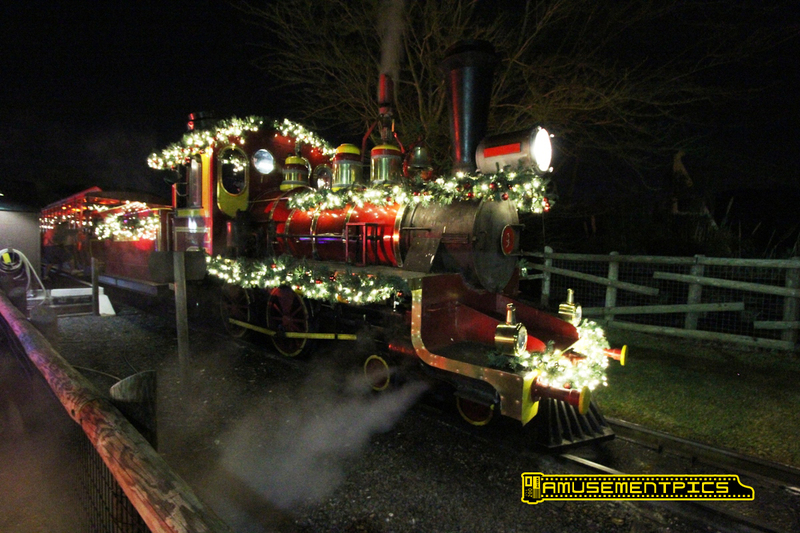 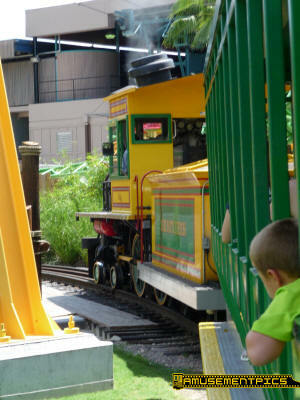 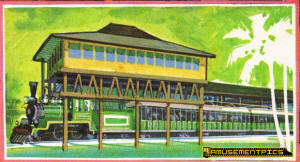 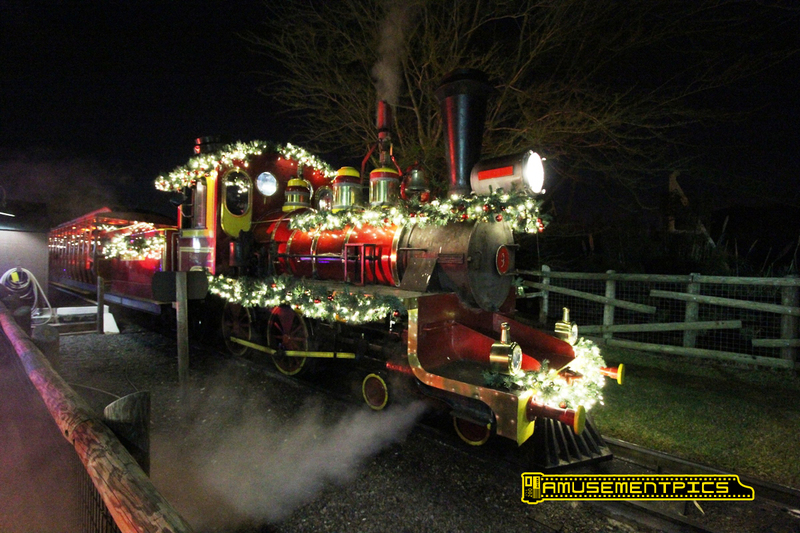 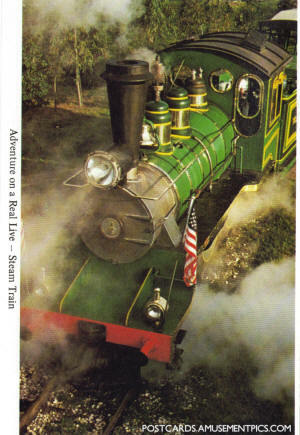 The green and red rail cars are the original two custom built trains that came with the #4 and #9 locomotives, while the yellow rail cars are the standard Crown coaches that came from Kings Dominion. 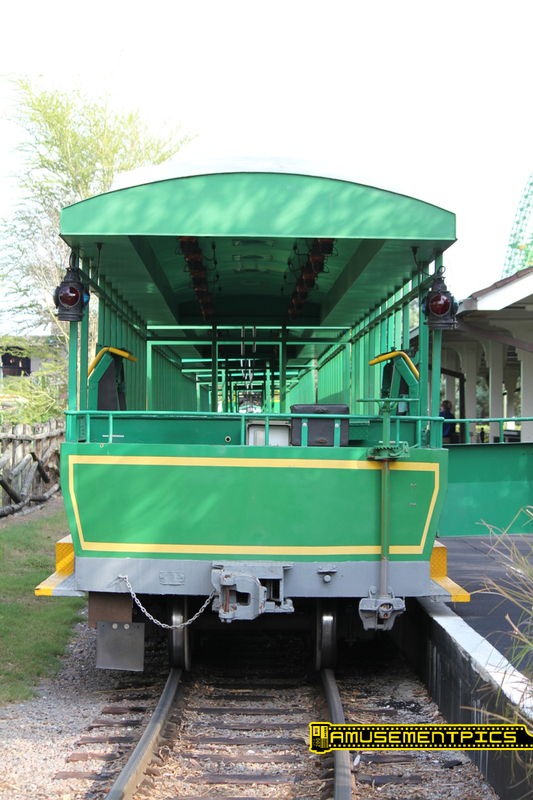 All three trains have been upgraded over time with new PA systems as well as wheel chair lifts making the trains ADA compliant. 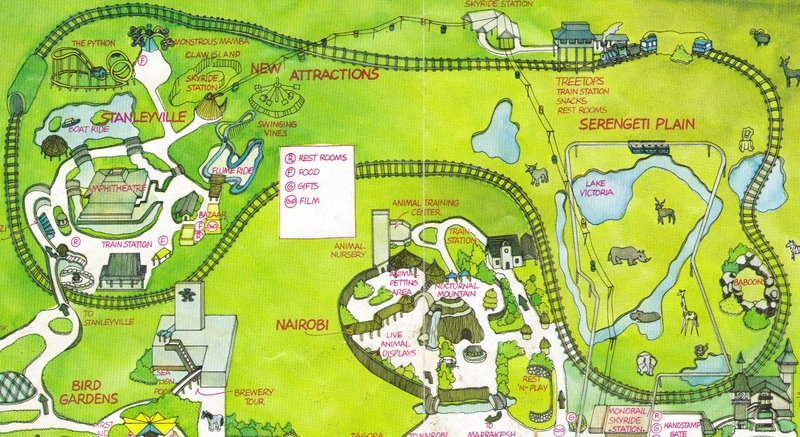 This park map shows the Railway layout in 1977. 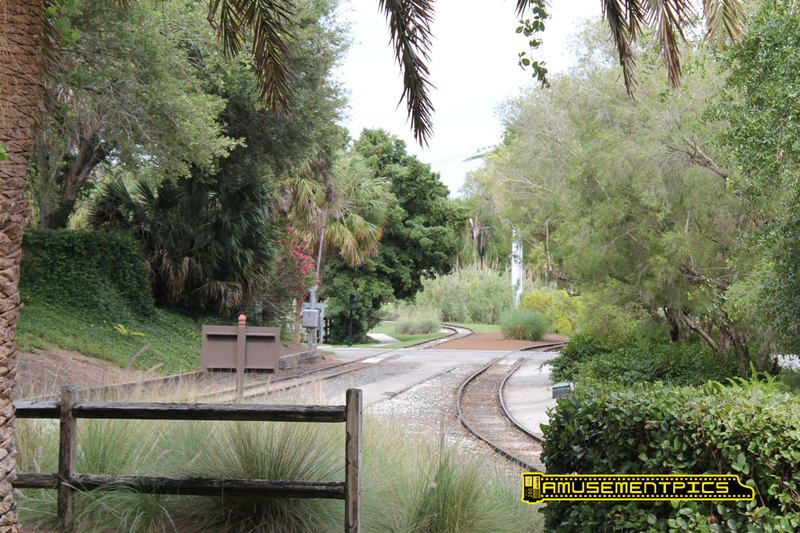 As the park has grown in the years since then, the track has been realigned as new paths connecting the originally separated areas have been added. 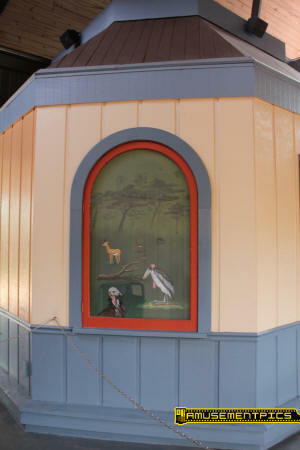 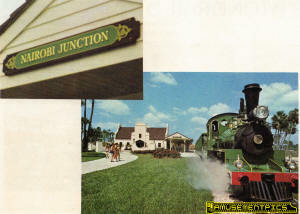 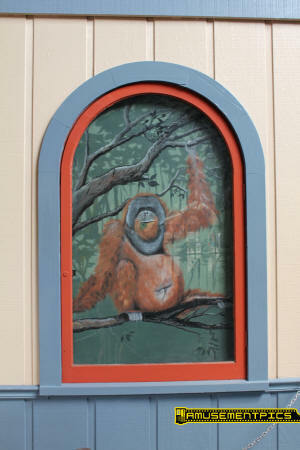 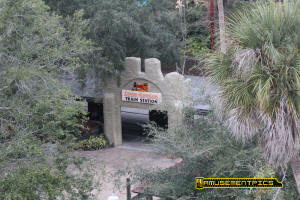 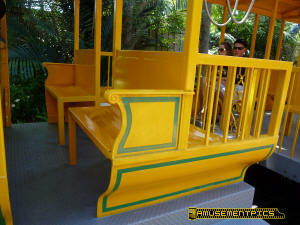 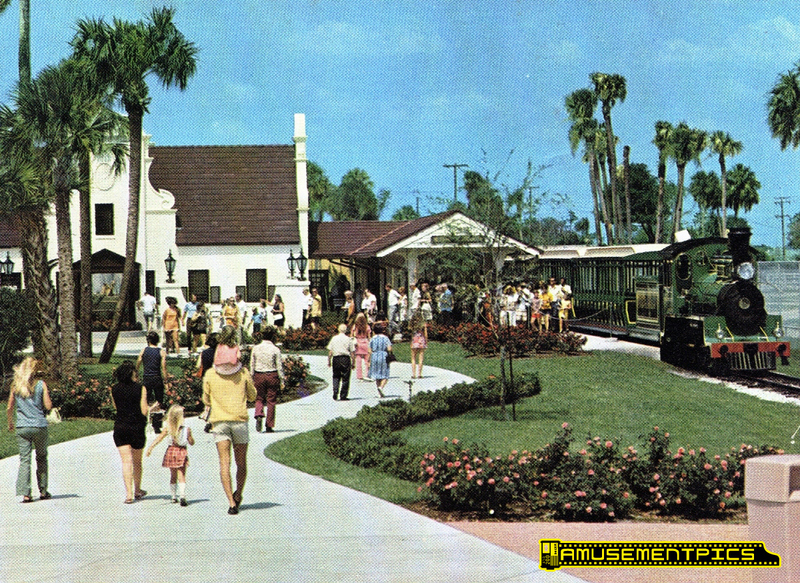 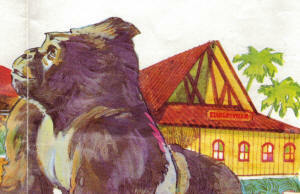 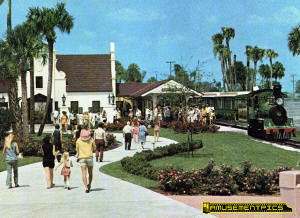 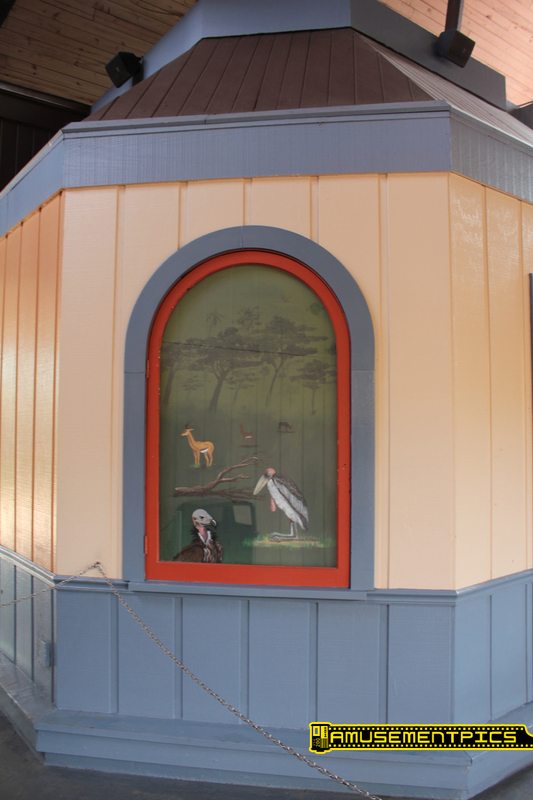 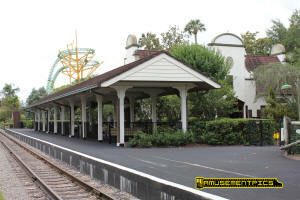 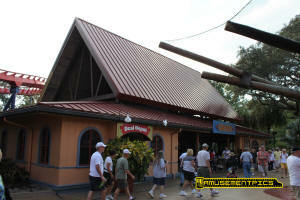 The Tree Tops Station which stood on the plains has been eliminated and the Congo Station added. 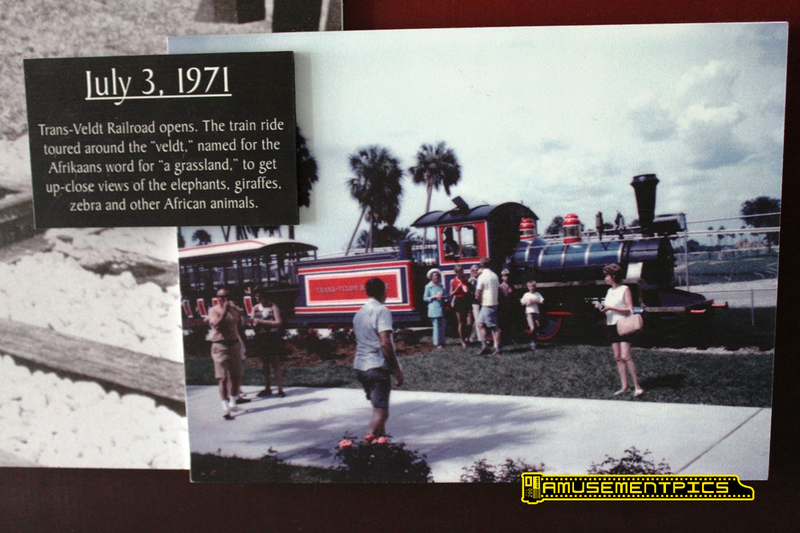 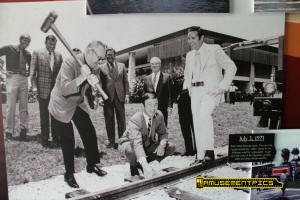 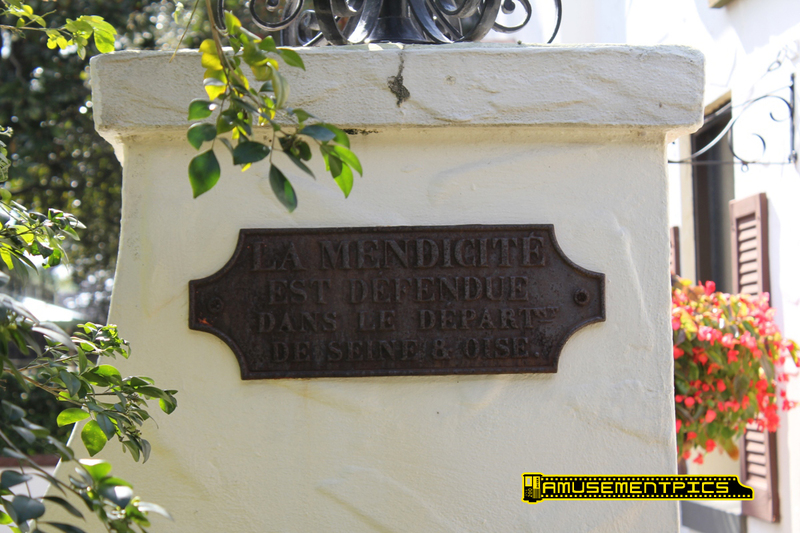 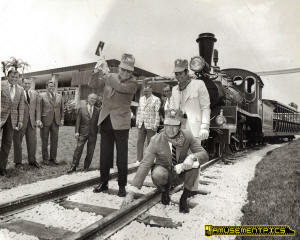 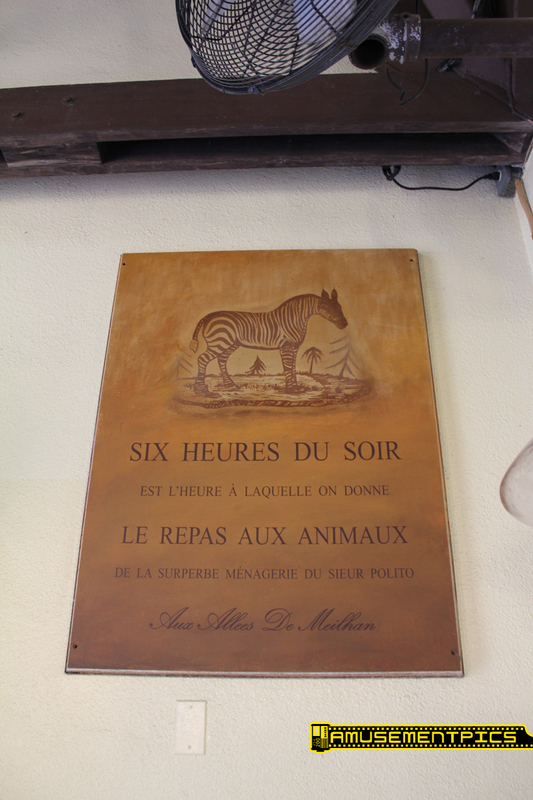 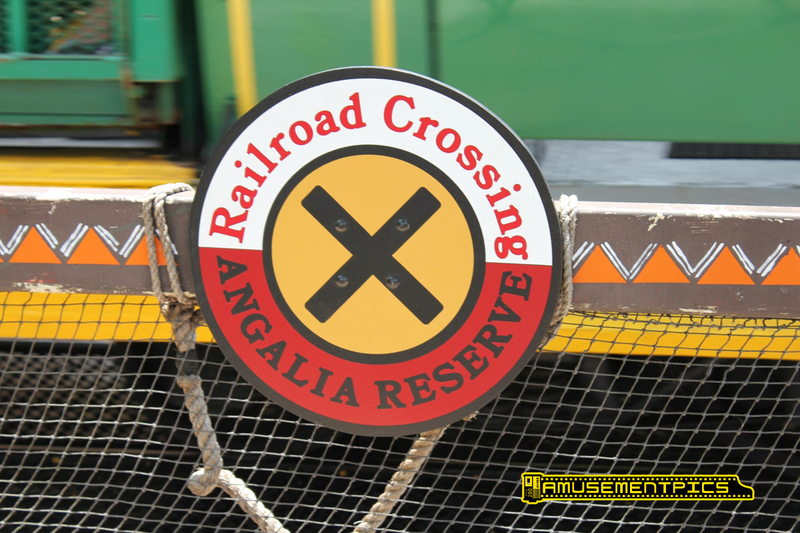 From the park's 50th anniversary display a small plaque mentions the opening of the Trans-Veldt Railway along with a picture of the ceremonial final spike being driven. 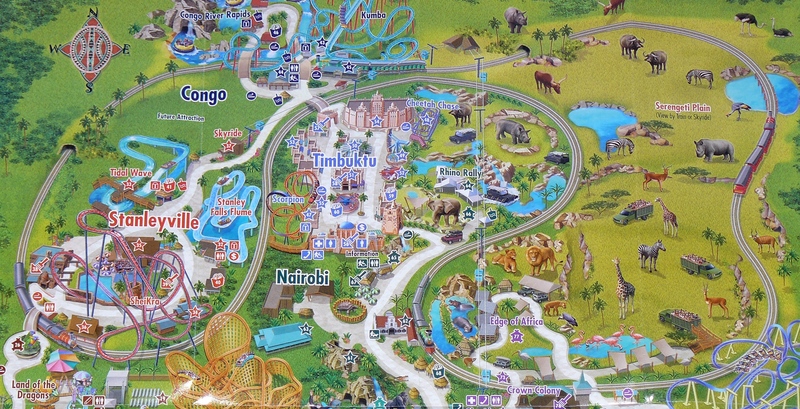 The 2007 map shows the current track layout. 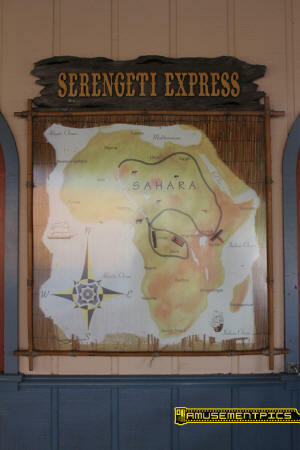 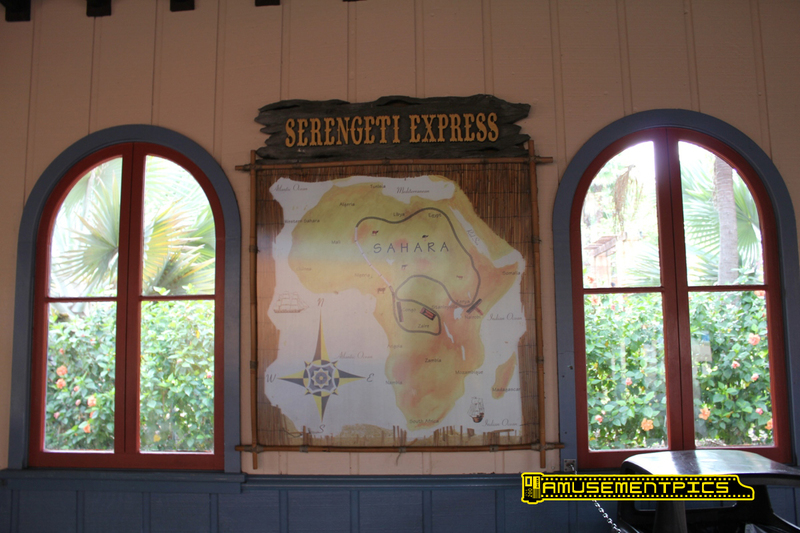 Though not depicted on the map, the Railway can be operated as a single loop circling the Serengeti Plain, or as the full loop servicing all the stations and offering transportation from one area of the park to another. 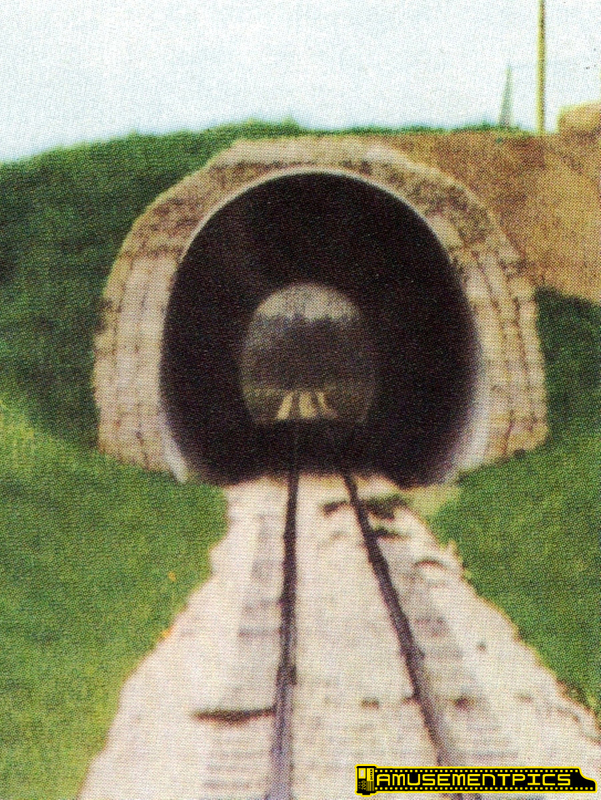 Early pictures of the trestle and tunnel from the 1974 souvenir book before all the trees grew in. 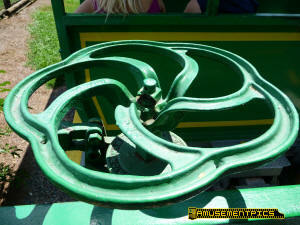 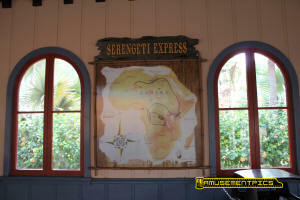 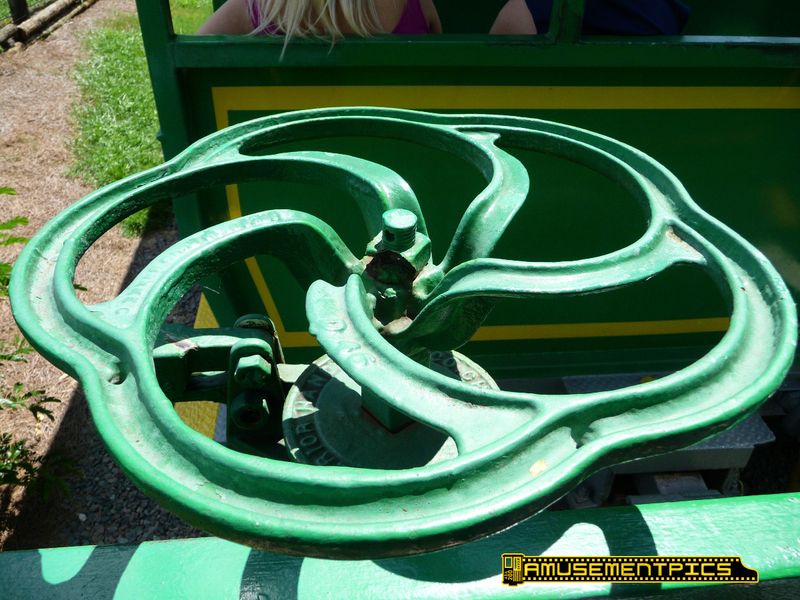 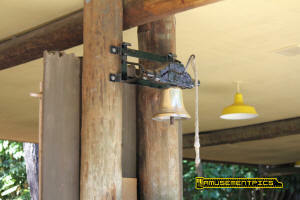 The line runs in two large loops, with a switch allowing a single loop around the Serengeti Plains area when necessary. 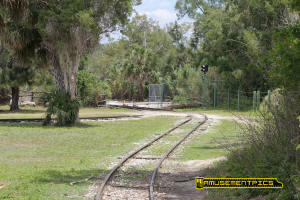 There is a wye at the back edge of the park that allows access to the storage tracks and maintenance area. 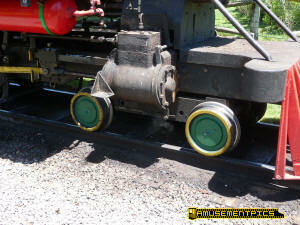 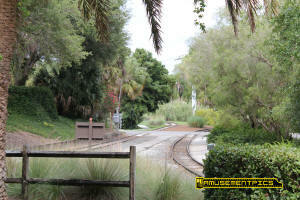 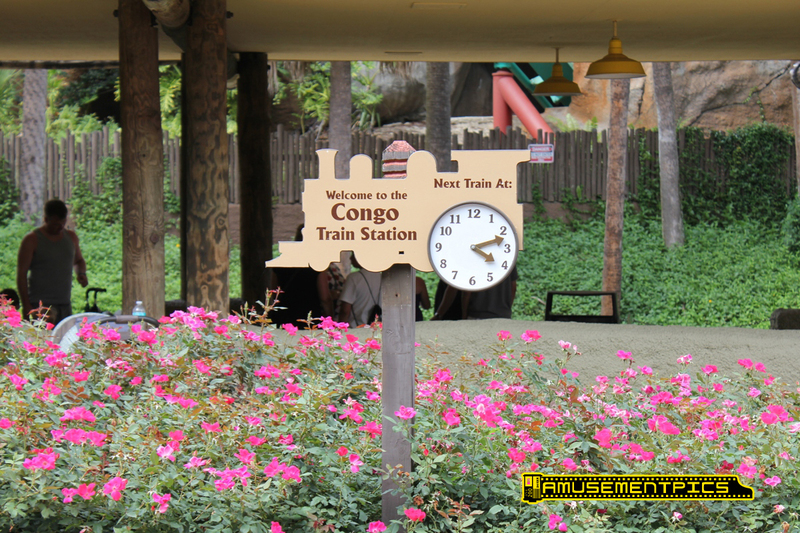 At one point near the Congo station the tracks run parallel to one another for a short stretch. The tracks wind under and over the pathways and rides in the park. 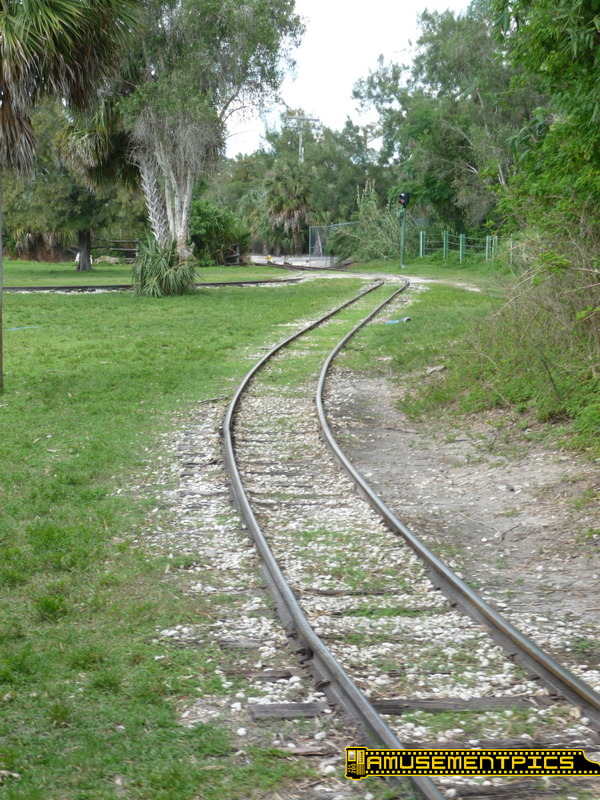 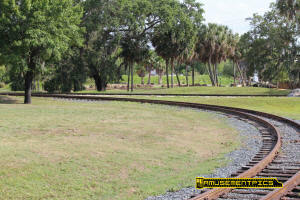 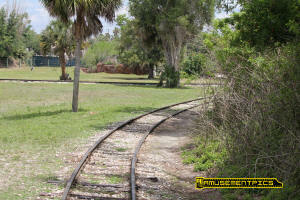 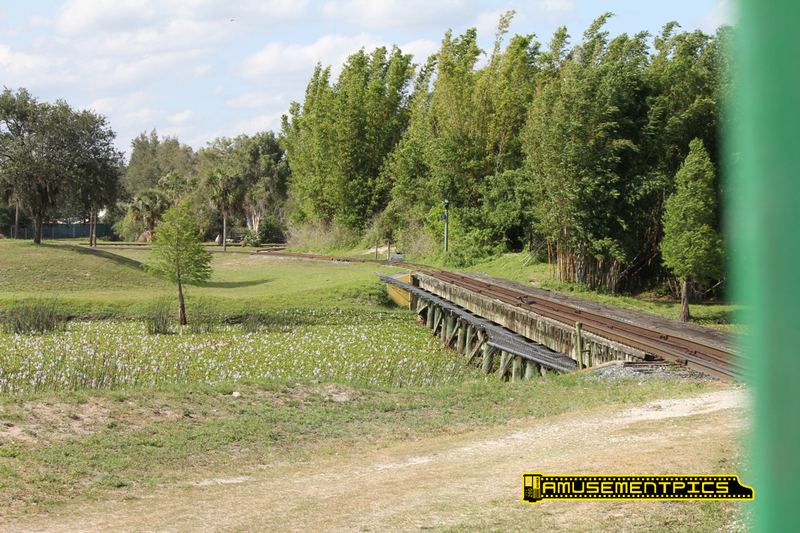 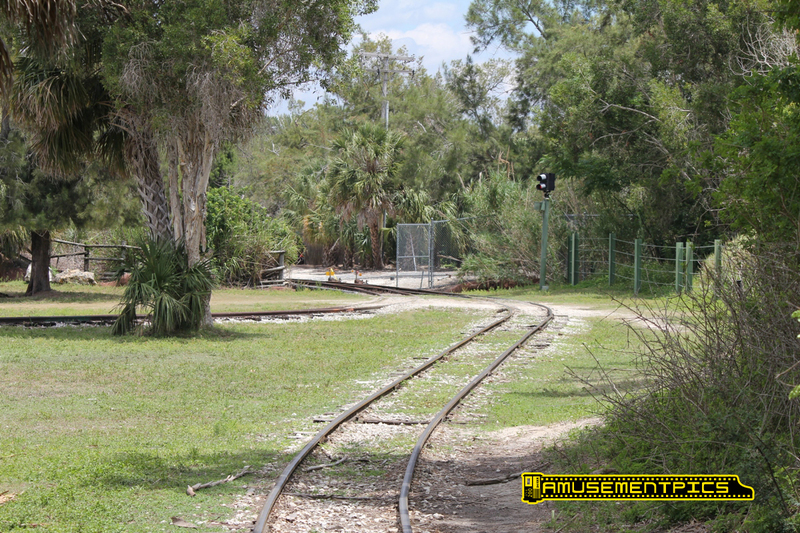 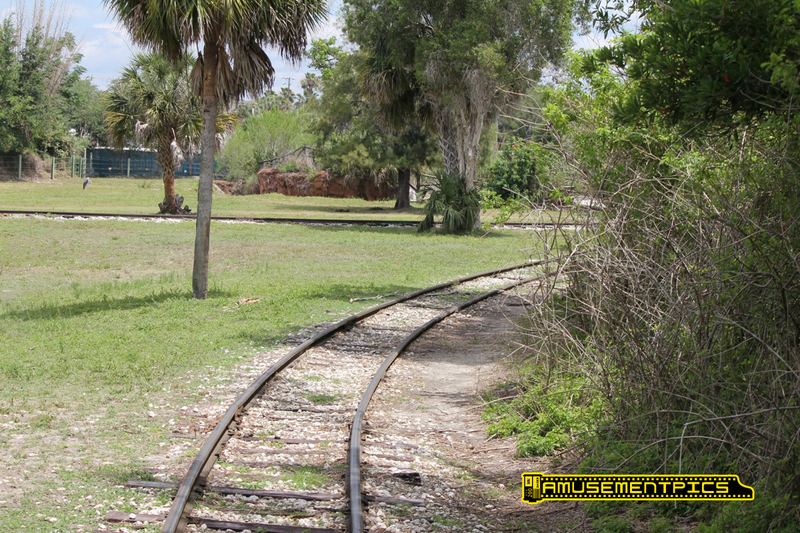 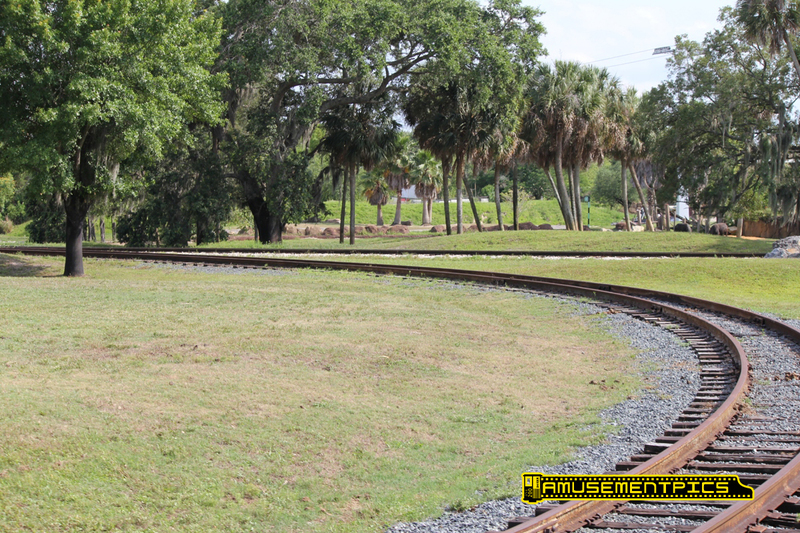 There are several grade crossings along the line as well to accommodate the growth of the park over the years. There are two tunnels along the line along with several bridges. 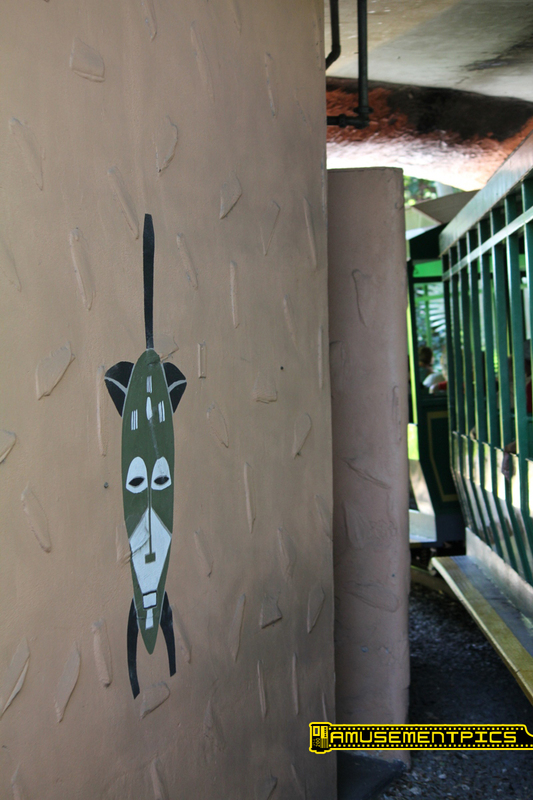 The bridges and tunnels help to separate the animals habitats along the way. 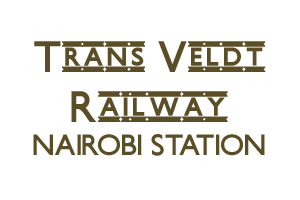 Nairobi Station is the most elaborate of the Trans Veldt Railway stations, and located closest to the park's entrance gates. 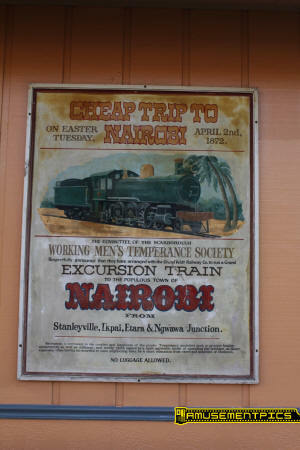 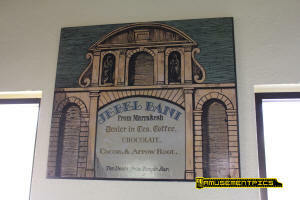 Nairobi was part of German East Africa and British East Africa in colonial times, and the style of the station reflects the architecture of the colonial powers. 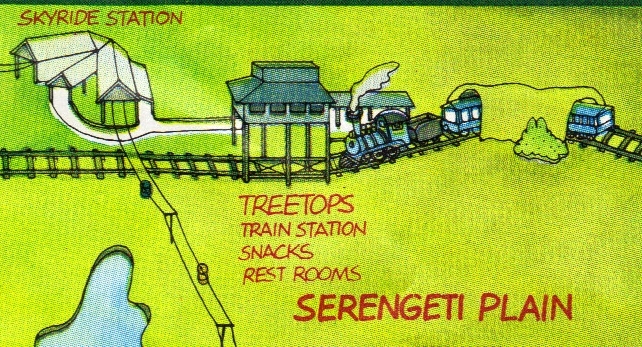 The Tree Tops Station was located on the far edge of the Serengeti Plain, and was connected with the Skyride Station at the point where the line turns. 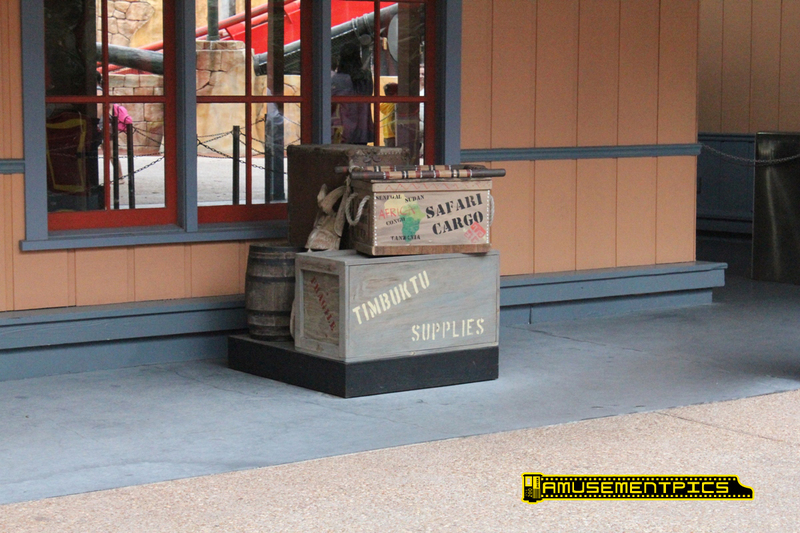 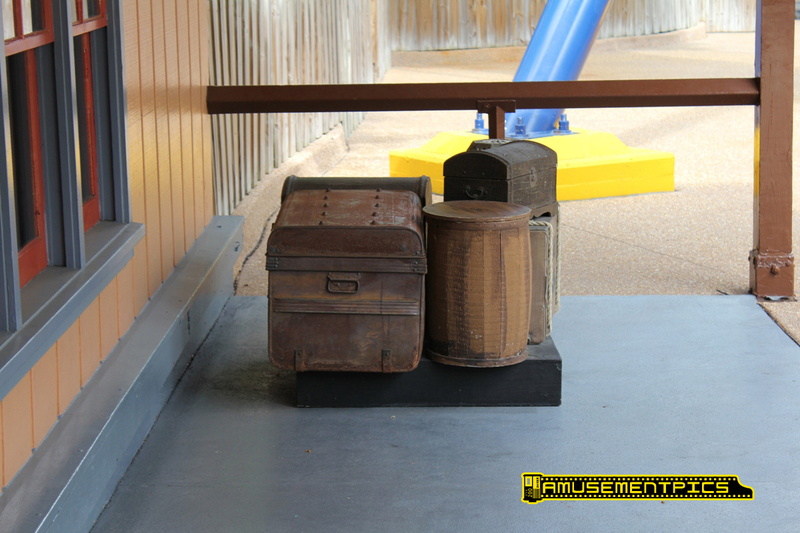 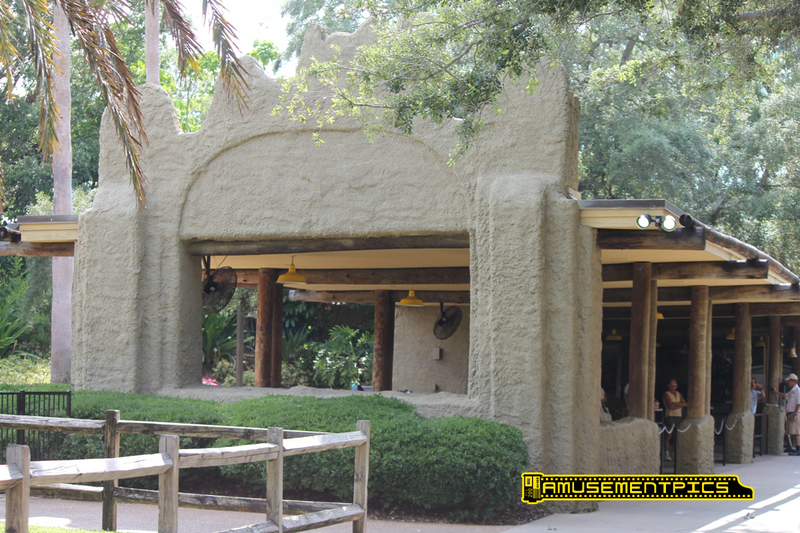 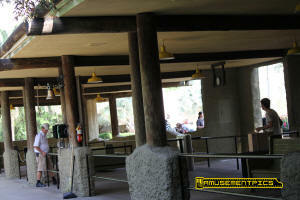 This was an isolated outpost before the park's pathways were connected. 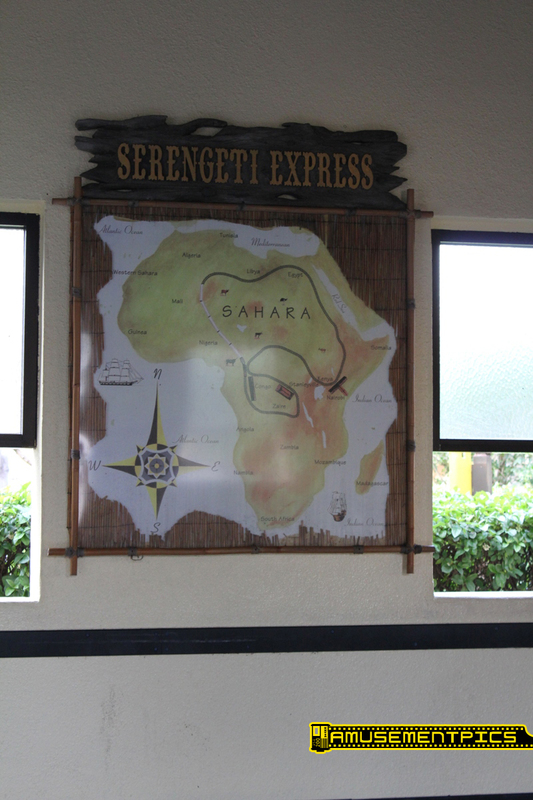 The station was a multi story structure which offered views of the animals roaming the Serengeti Plain as well as snacks and restroom facilities. 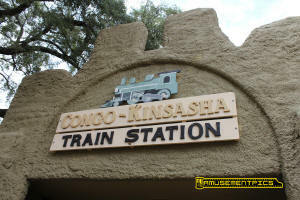 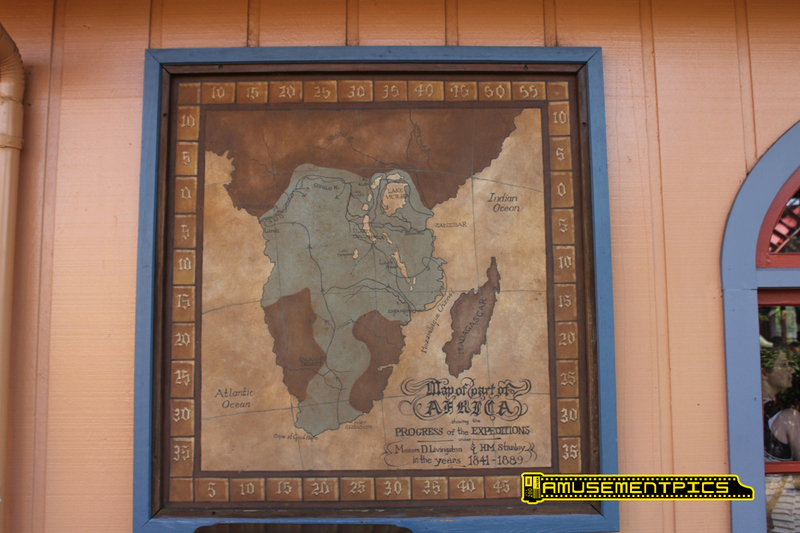 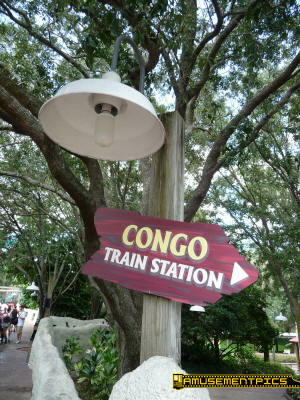 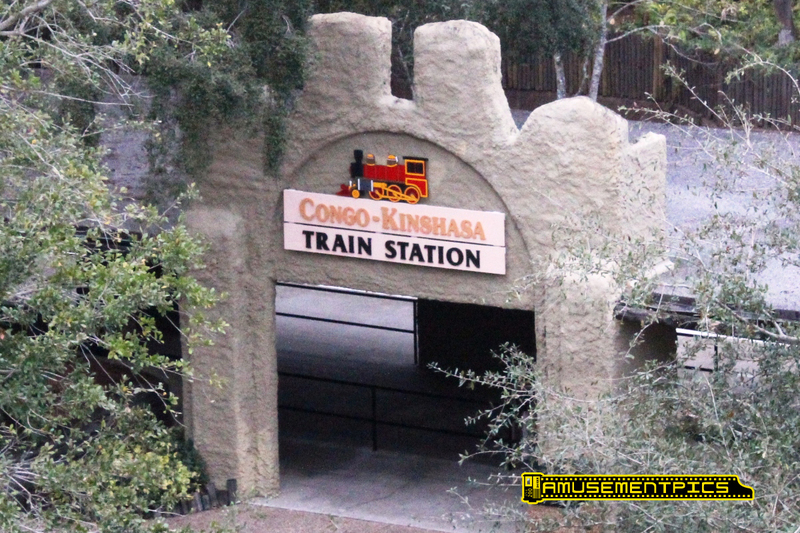 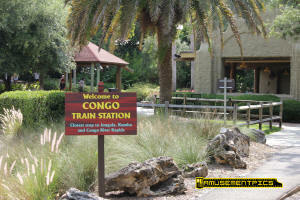 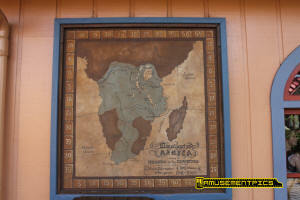 Congo-Kinshasa Station is located in the Congo section of the park beneath the Kumba roller coaster. The station features mud style architecture like the surrounding buildings of the Congo. 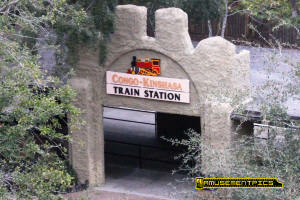 Supports for Kumba straddle the track and run through the station platform. 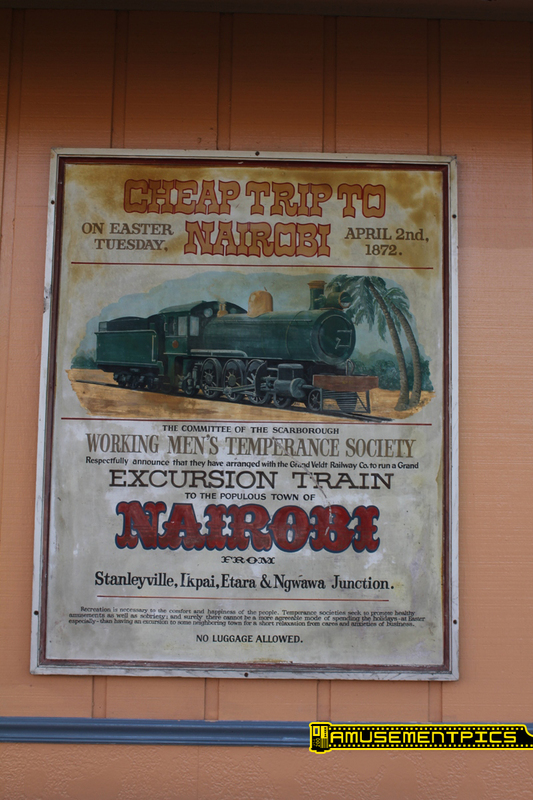 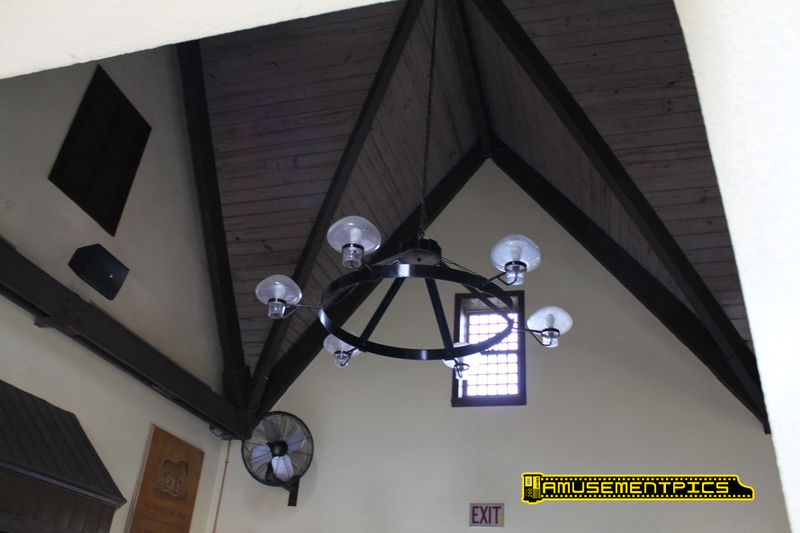 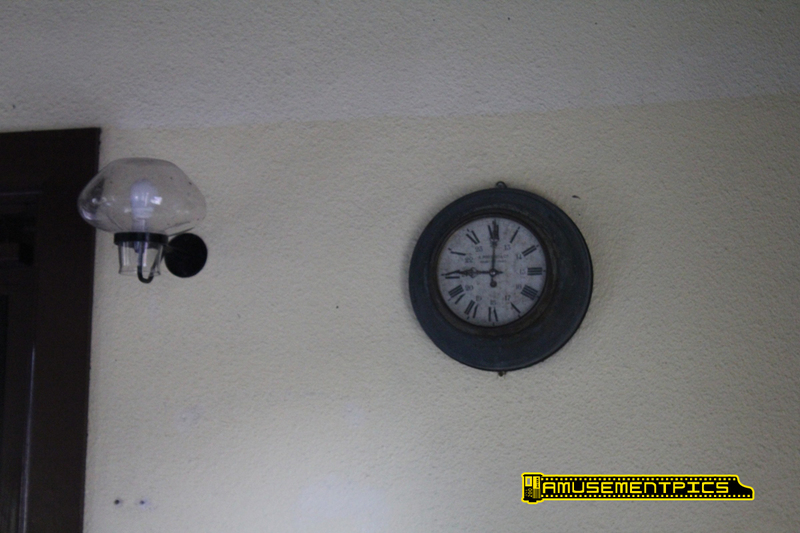 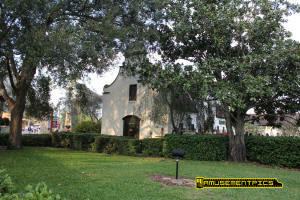 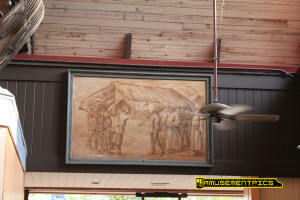 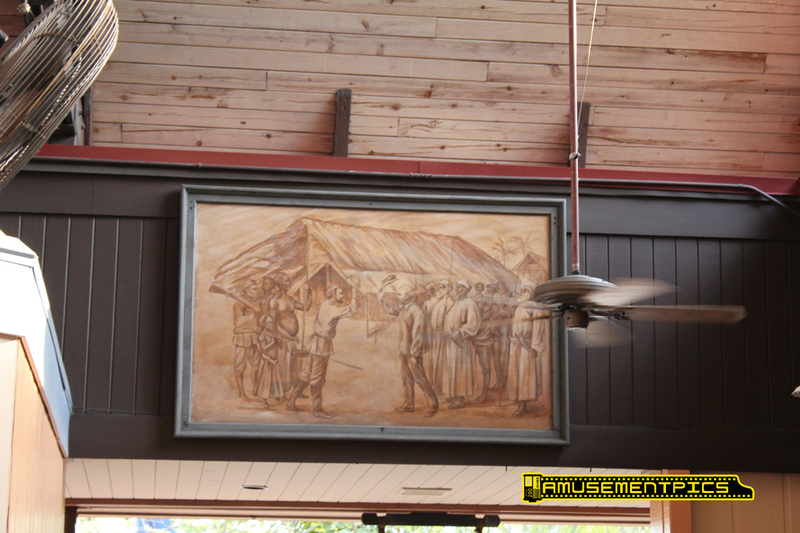 Stanleyville Station was one of the original depots along the Railway, and like Nairobi Station it features some nice thematic details. 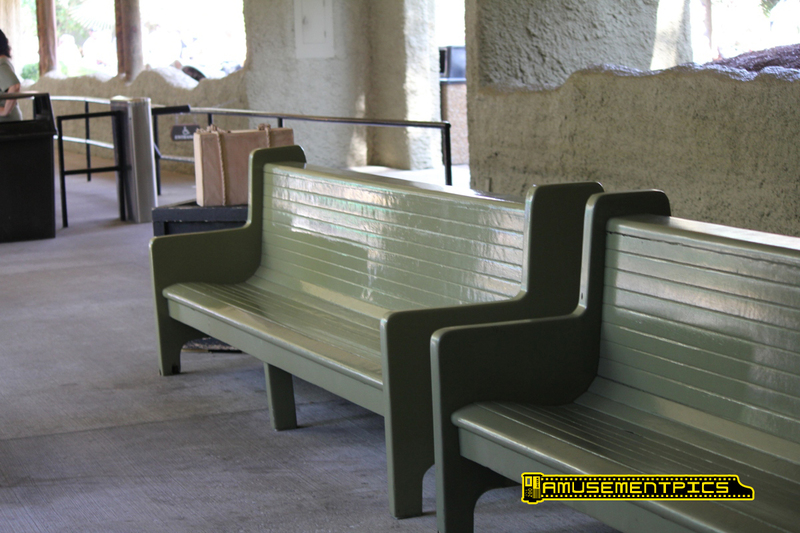 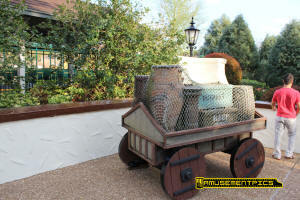 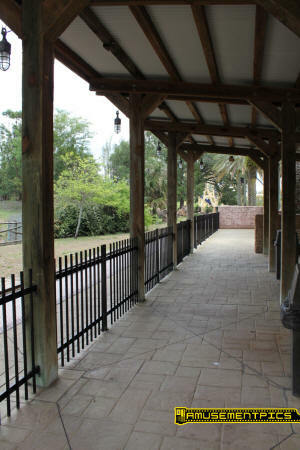 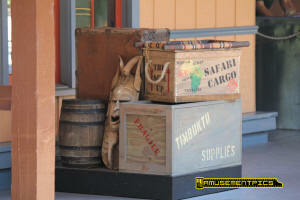 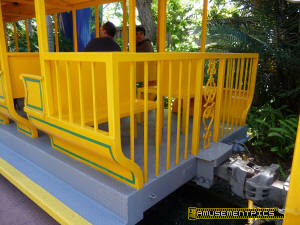 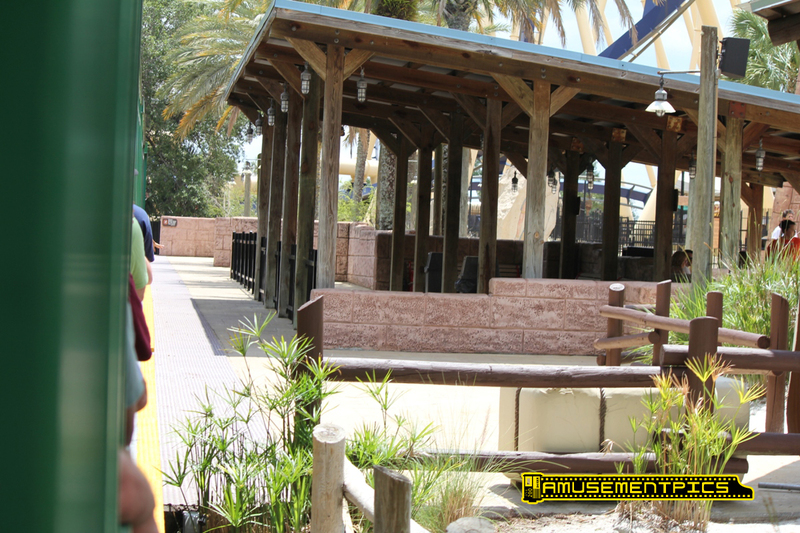 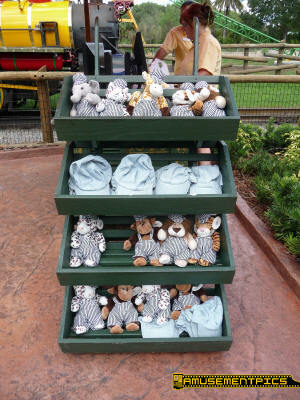 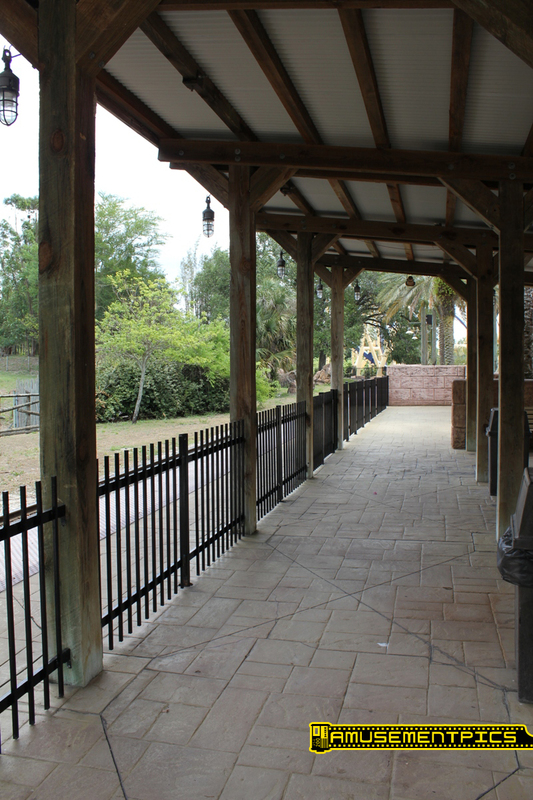 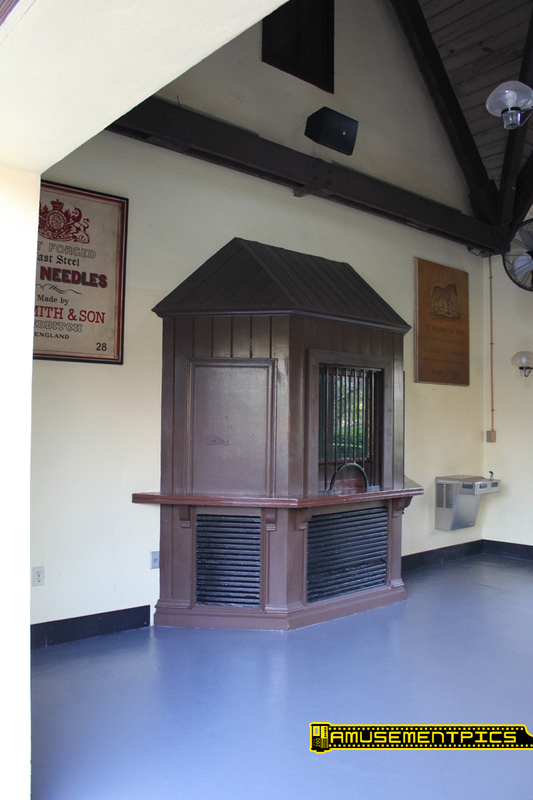 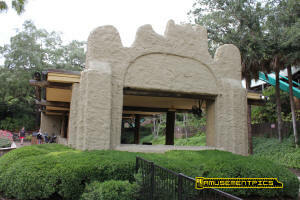 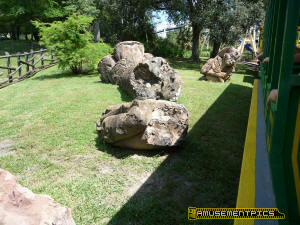 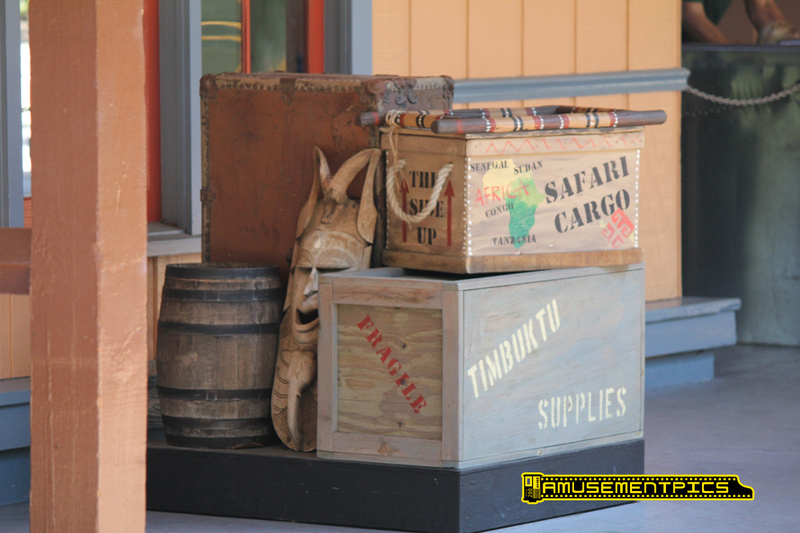 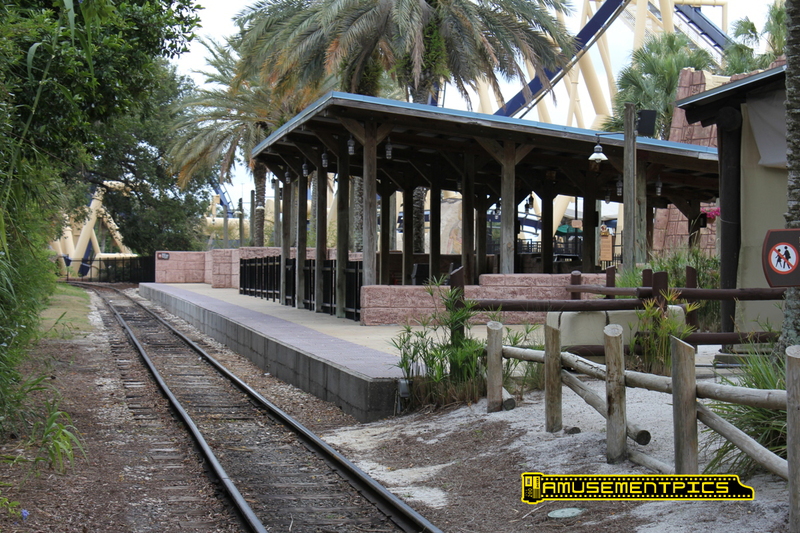 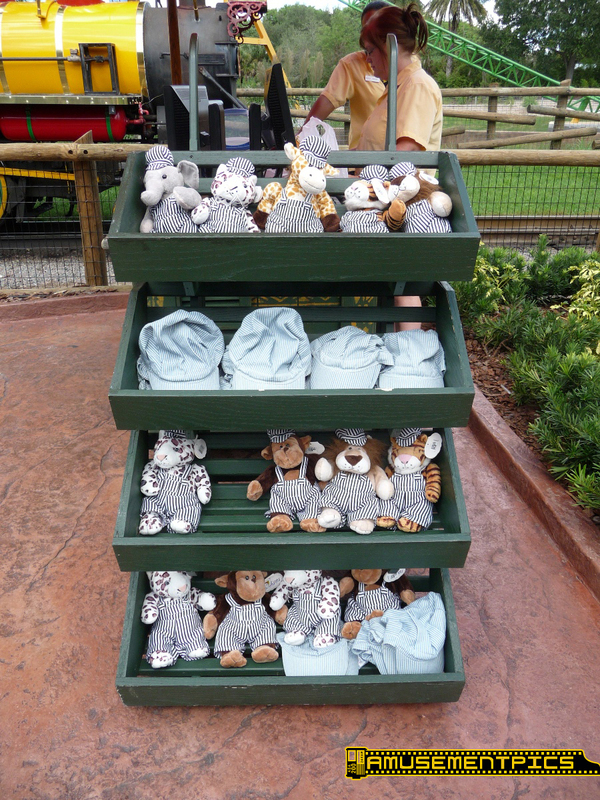 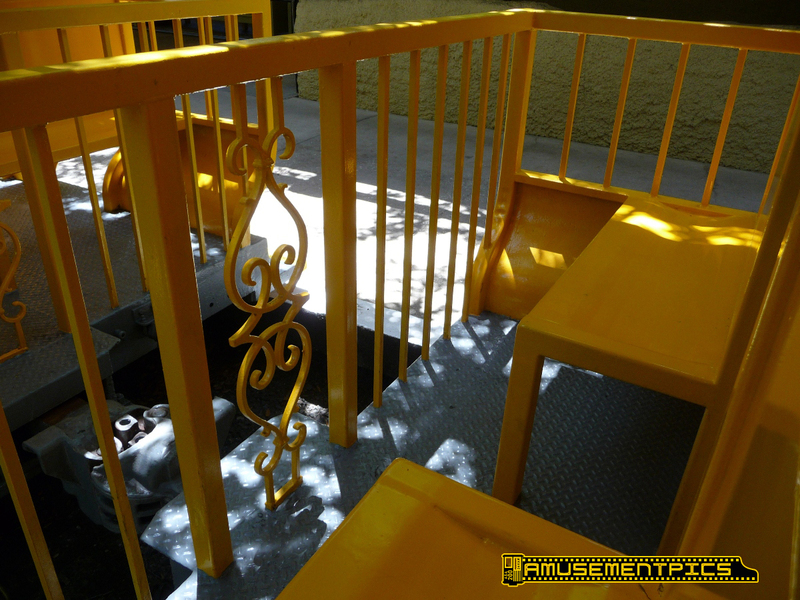 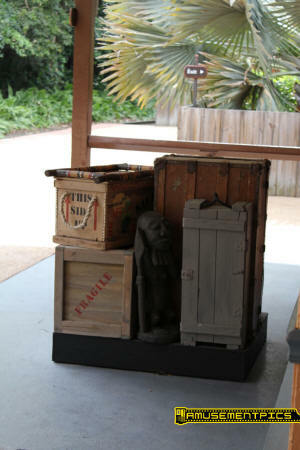 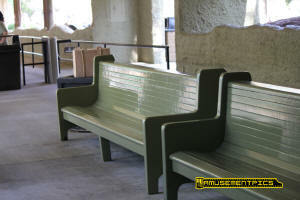 For the opening of the Egypt section of the park, an additional station was added to bring guests to the new area of the park. 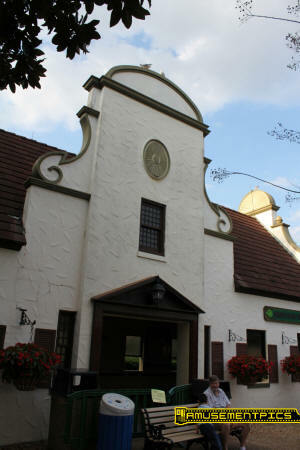 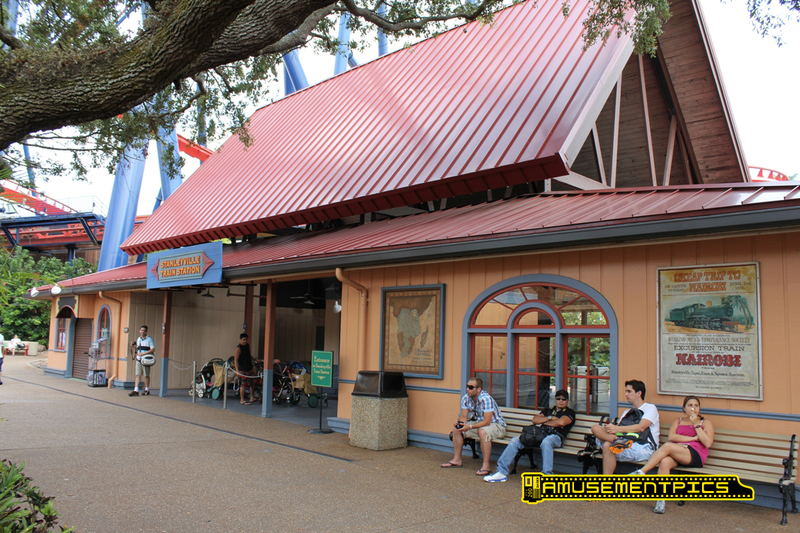 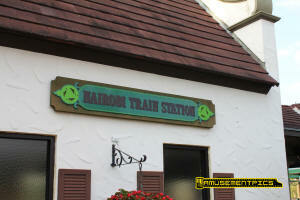 The Egypt station was closed several years ago and is now a smoking area in the park. 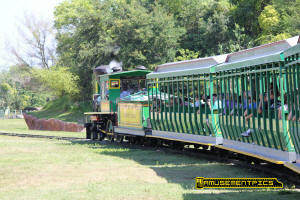 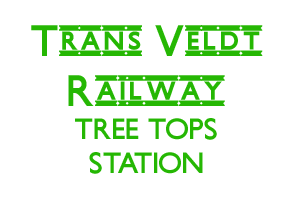 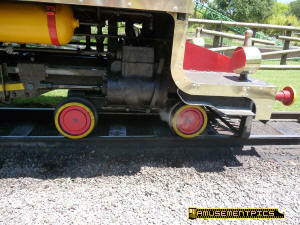 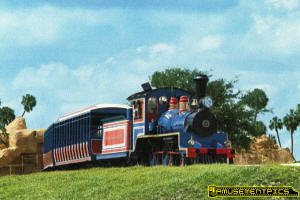 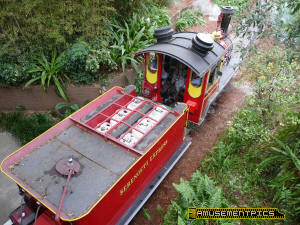 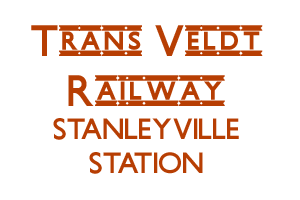 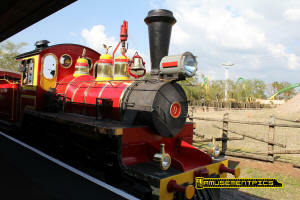 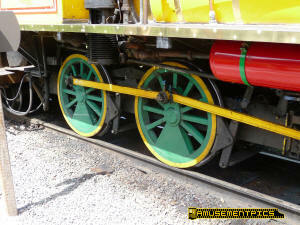 The Trans Veldt Railway was built in 1971, with twin custom designed locomotives and trains with a South African look. 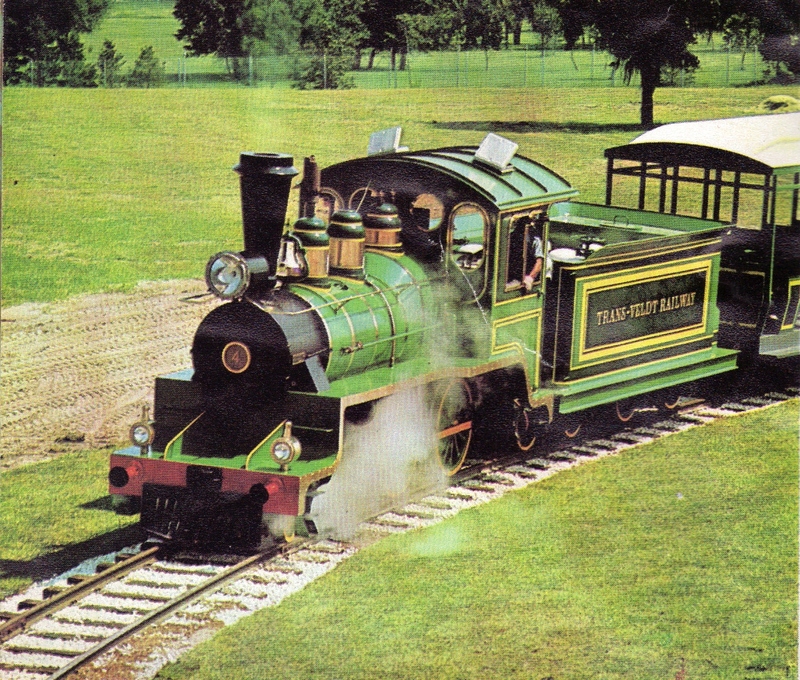 The basic Crown locomotive design was tweaked, with high running boards and buffers on either side of a small cow catcher. 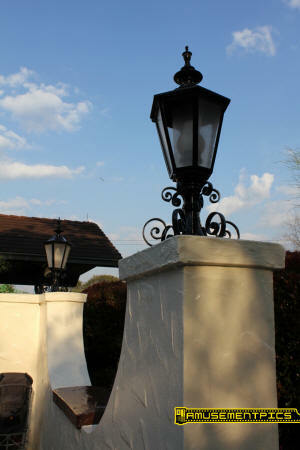 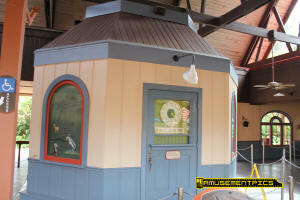 The cab was styled with round windows instead of the traditional squared windows the American style Crowns. 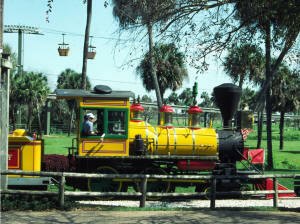 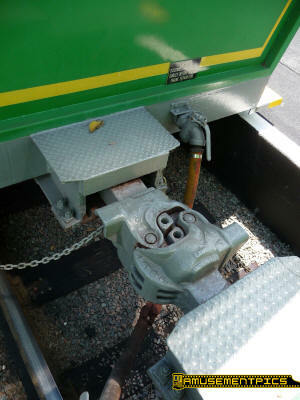 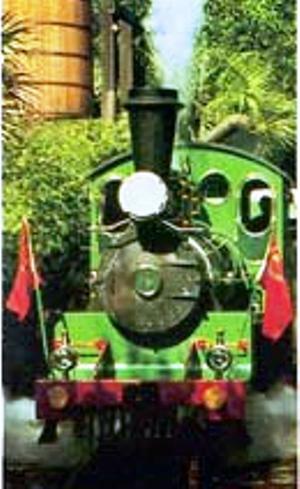 Locomotive #4 featured a green and yellow color scheme. 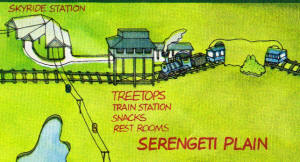 This early picture shows #4 sitting at the Tree Tops Station which was at the far edge of the Serengeti Plain. 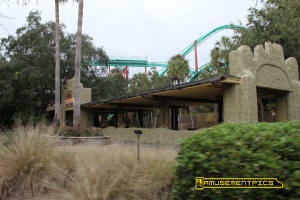 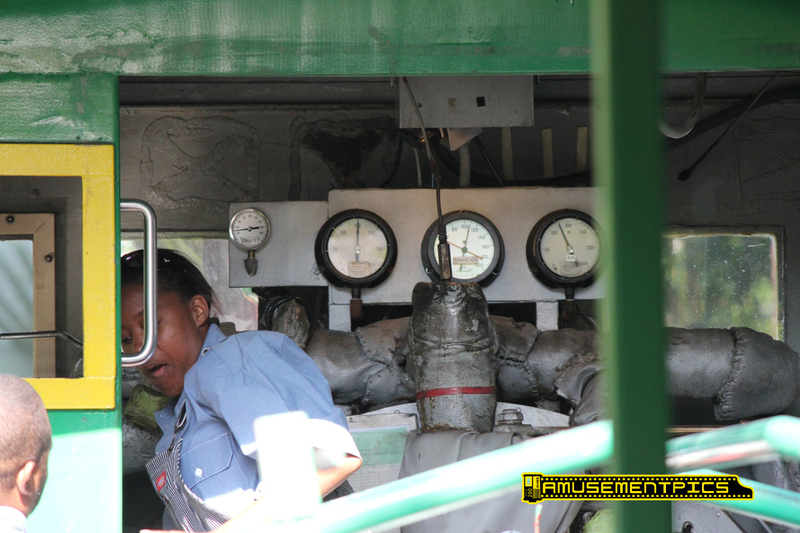 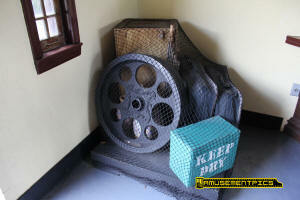 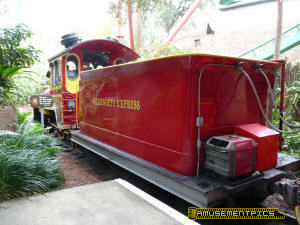 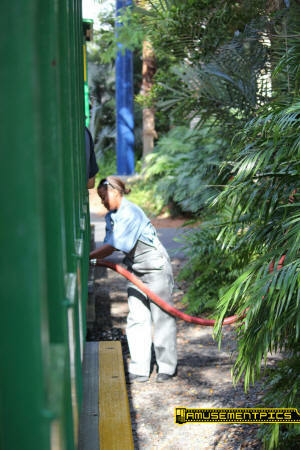 Currently #4 is out of service as it is undergoing extensive rehab in the Busch Gardens Engine House. 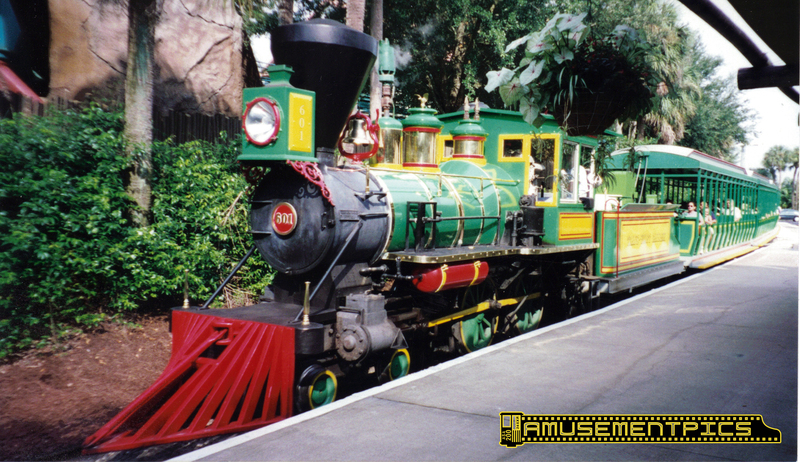 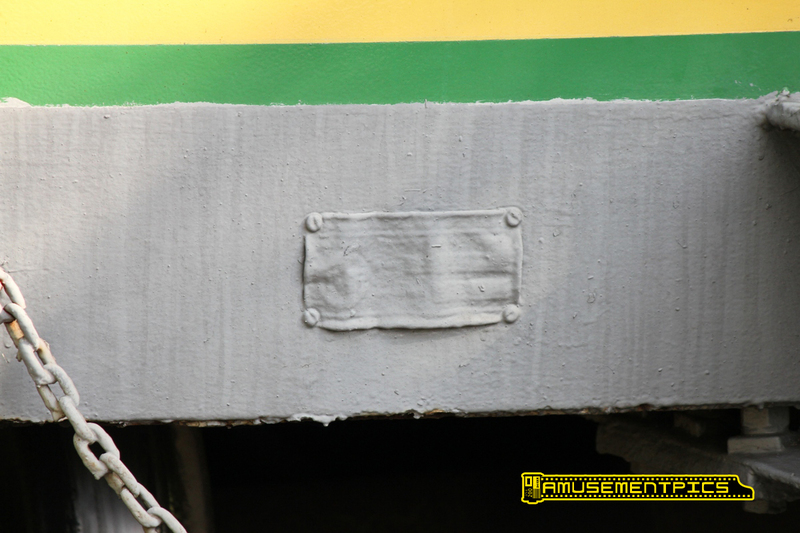 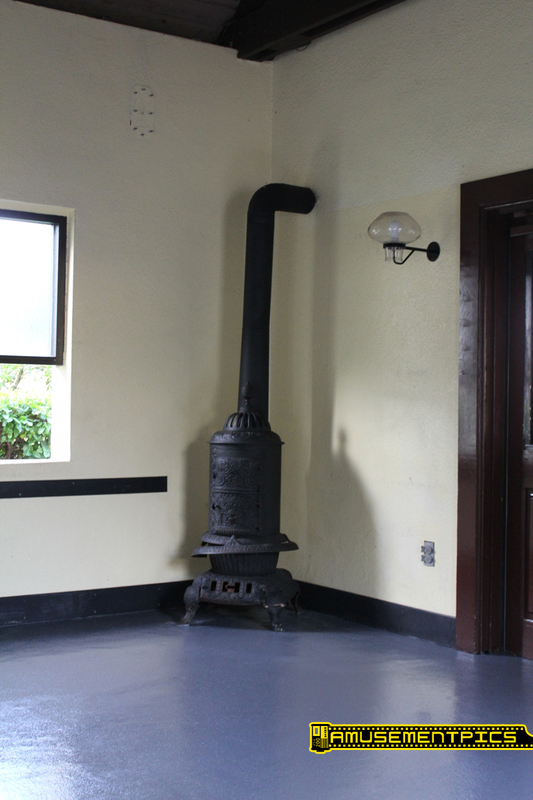 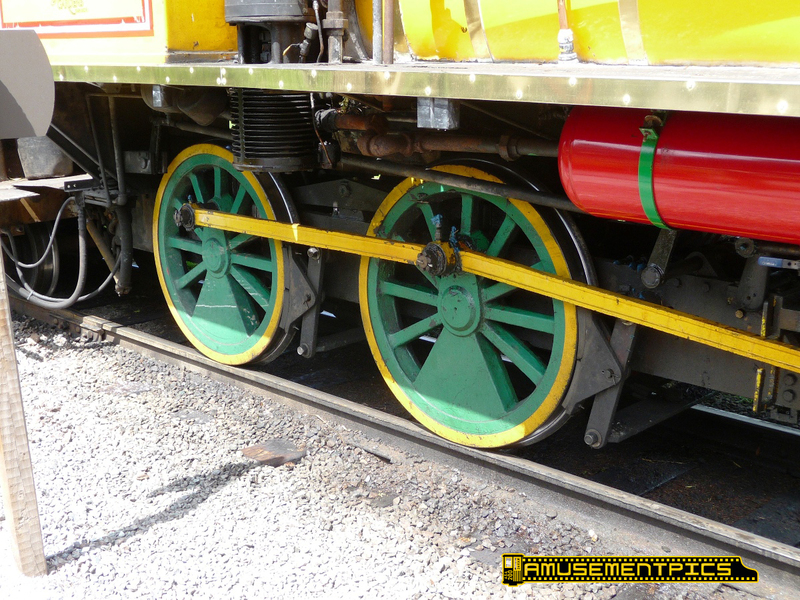 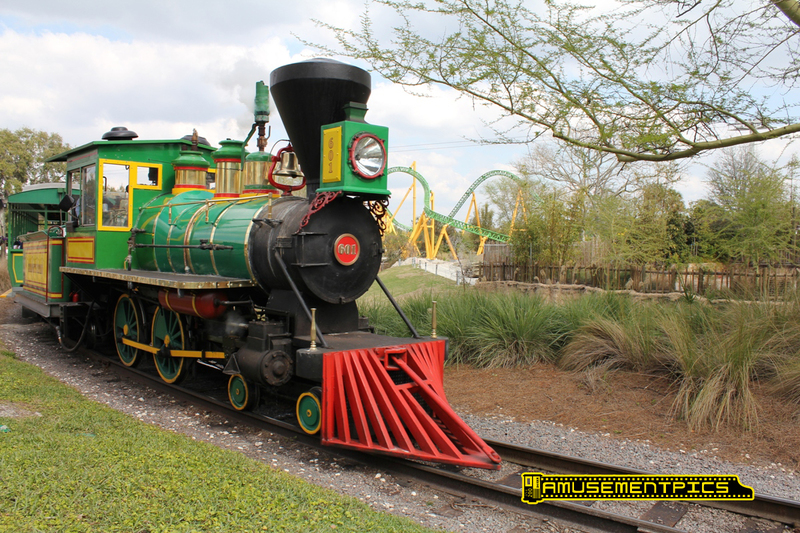 Since it was introduced in 1971, the trim colors have been changed with yellow accents added and removed, and the smokebox originally painted in a silvery gray color being changed to a dark gray/black to match the smokestack. 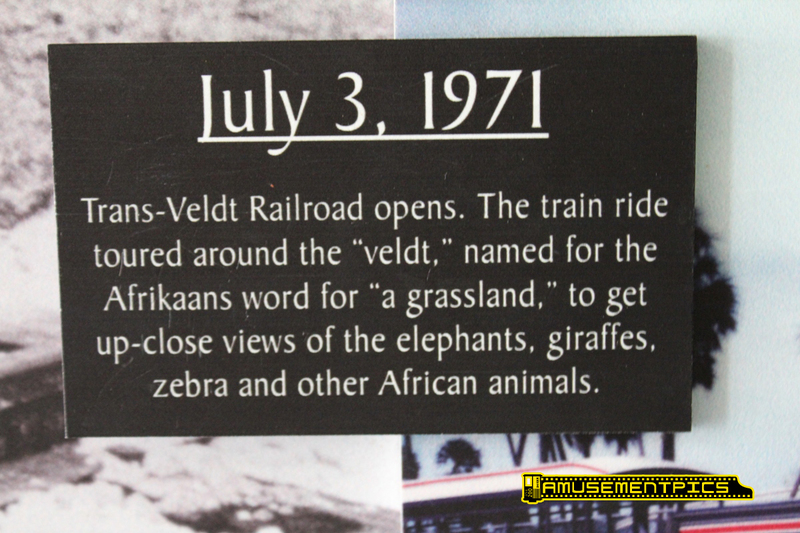 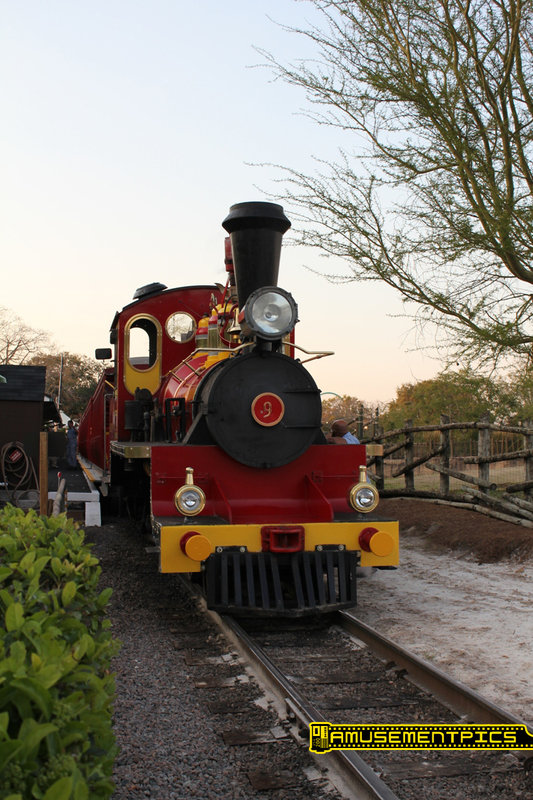 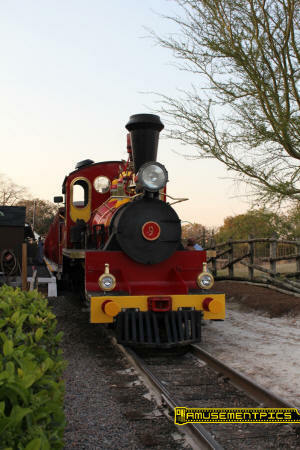 The Trans Veldt Railway was built in 1971, with twin custom-designed locomotives and trains with a South African look. 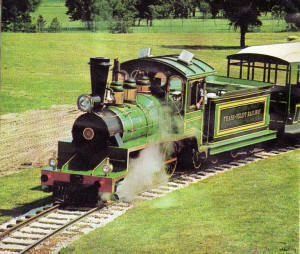 The basic Crown locomotive design was tweaked, with high running boards and buffers on either side of a small cow catcher. The cab was styled with round windows instead of the traditional squared windows the American style Crowns. Locomotive #9 originally featured a blue and red color scheme. Postcard views show the original blue paint scheme on #9, with variations through the years. 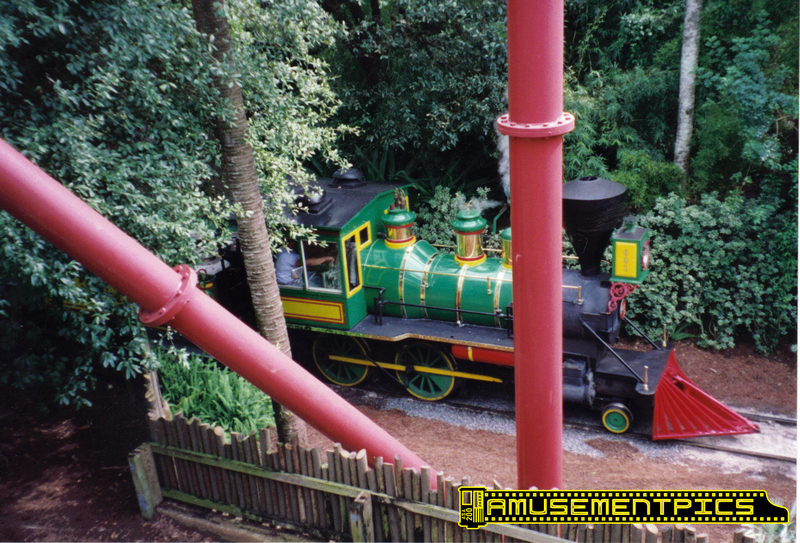 Originally #9 featured only 2 domes, with the whistle sitting directly on the boiler in the early years. 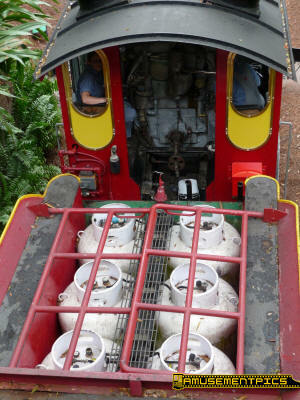 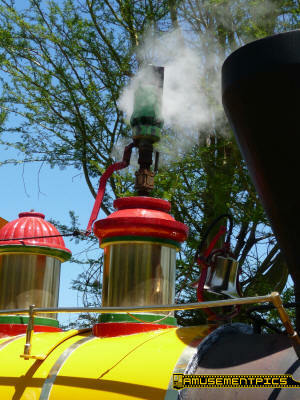 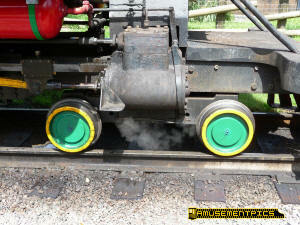 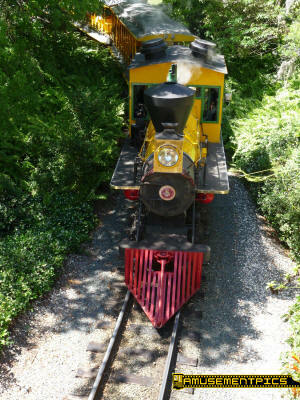 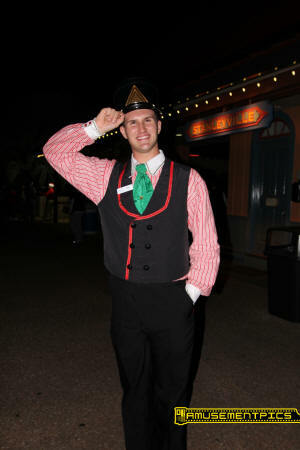 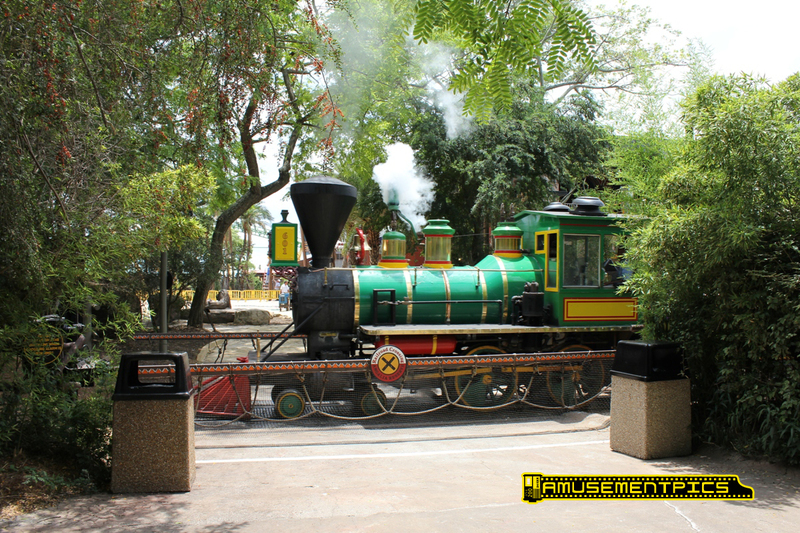 The third dome was added at some point in the engine's life, and the other Busch Gardens locomotives have also been retrofit with this second steam dome where the whistle is now mounted. 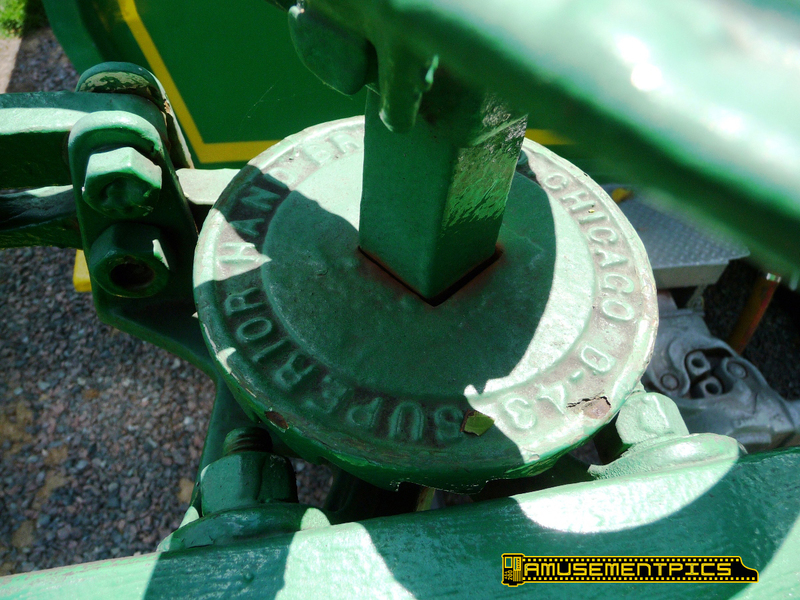 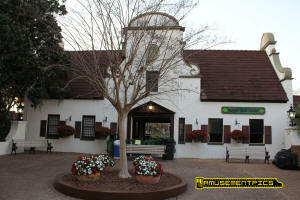 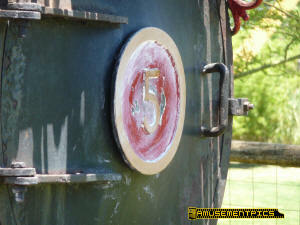 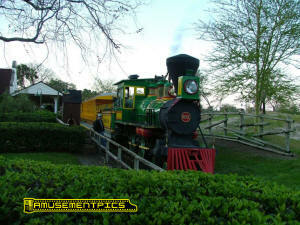 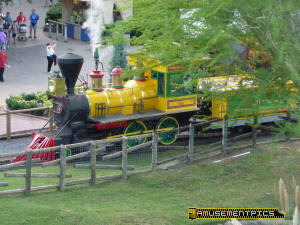 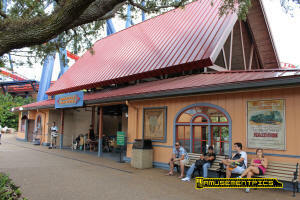 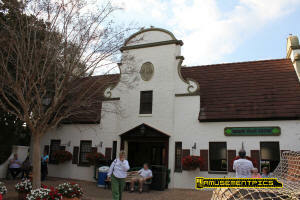 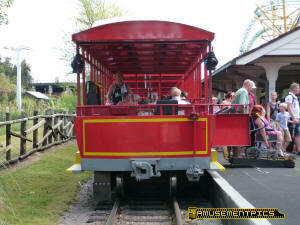 Built in 1971 for Six Flags Over Mid-America, #5 was purchased by Busch Gardens in the 1980's. 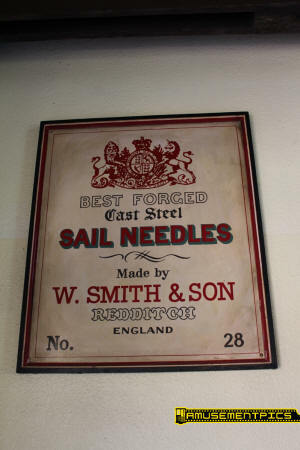 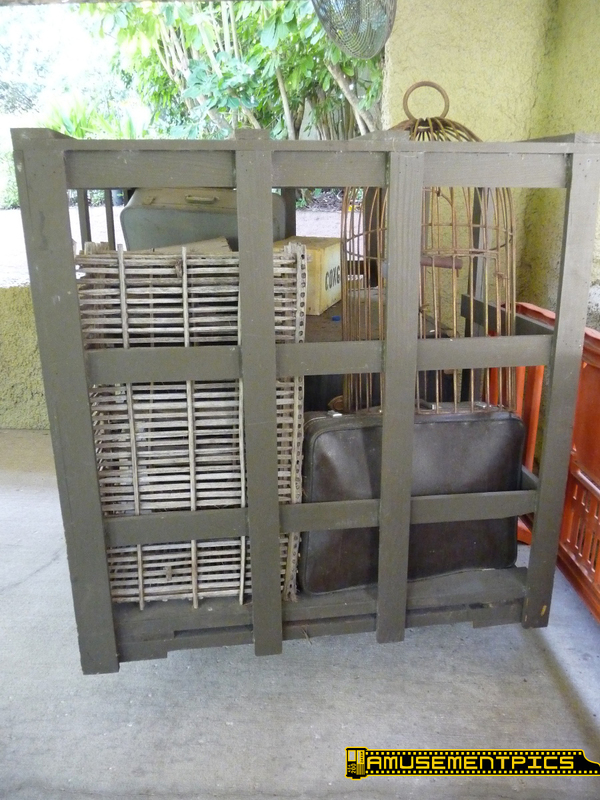 The original wood cab was replaced by a slightly modified steel cab. 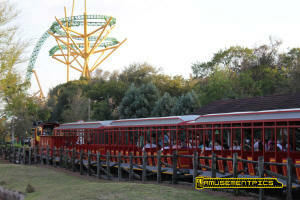 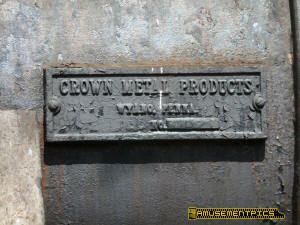 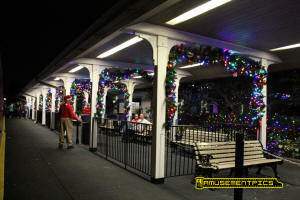 Photo from the Crown catalog of #5 at Six Flags Over Mid-America. 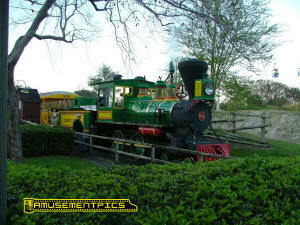 Built in 1974 for Kings Dominion in Doswell, Virginia, 601 was originally named the Patrick Henry. 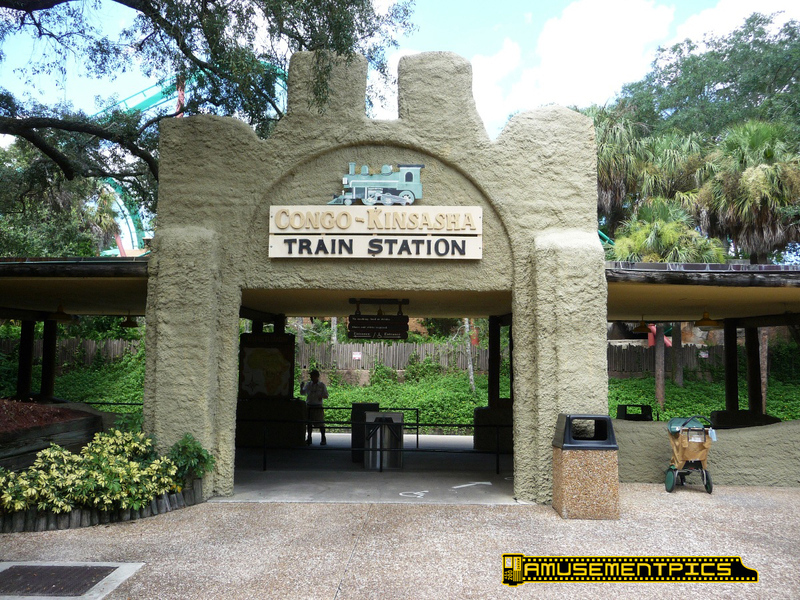 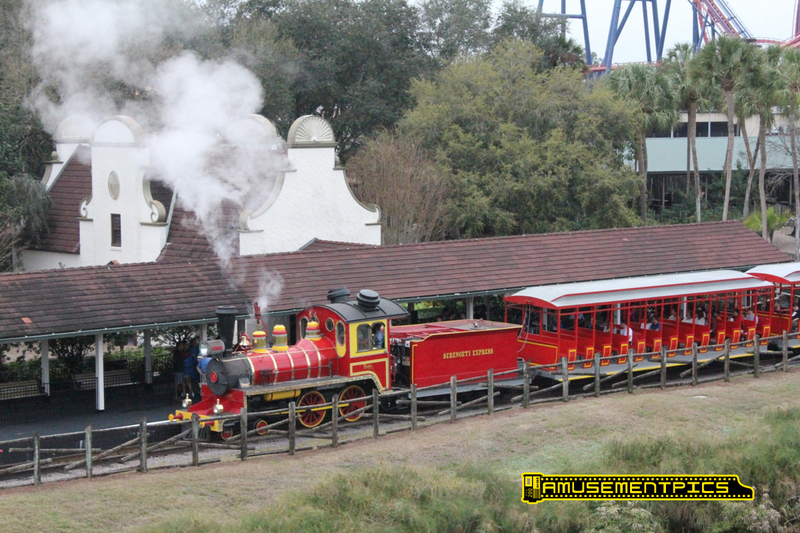 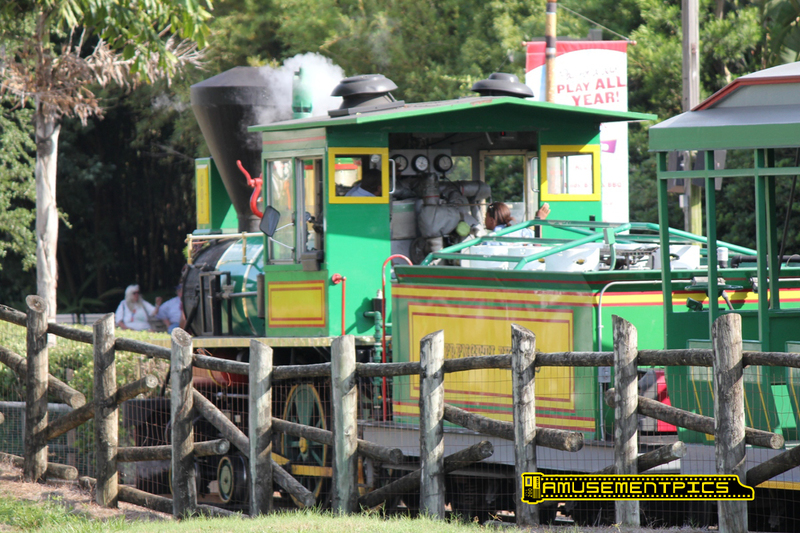 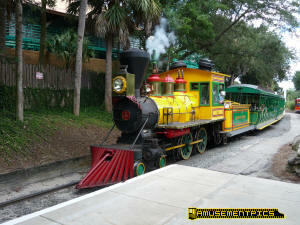 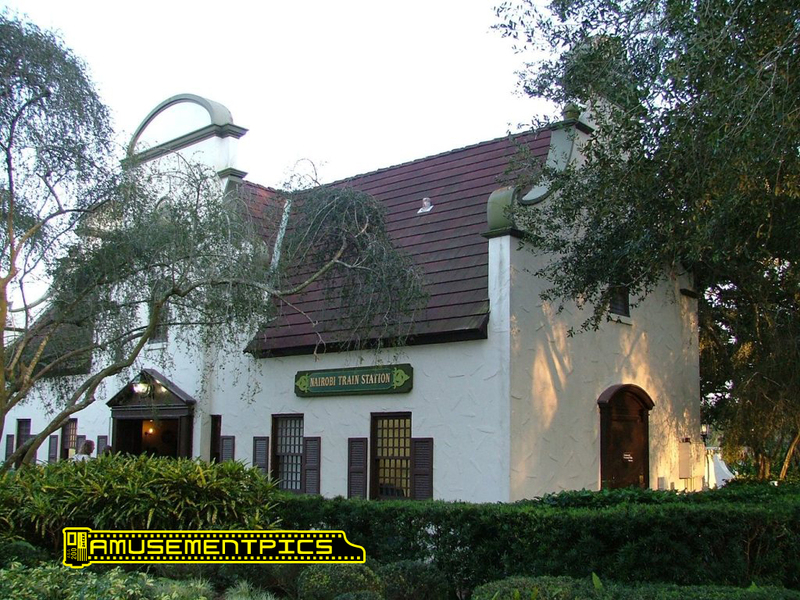 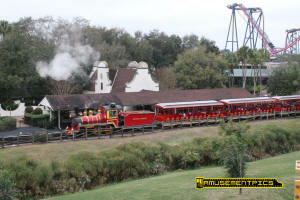 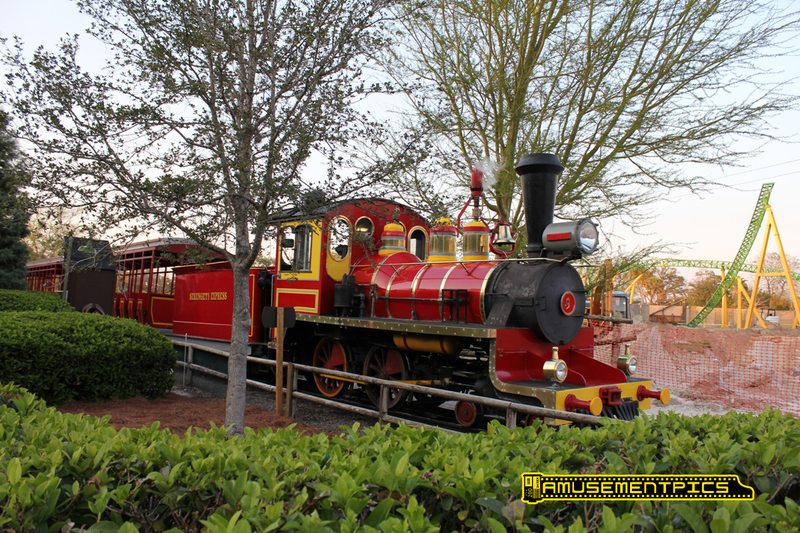 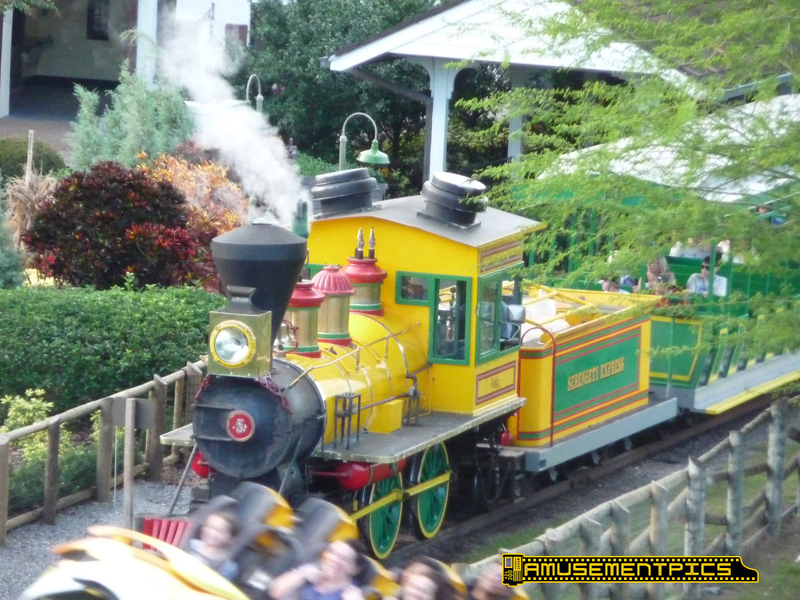 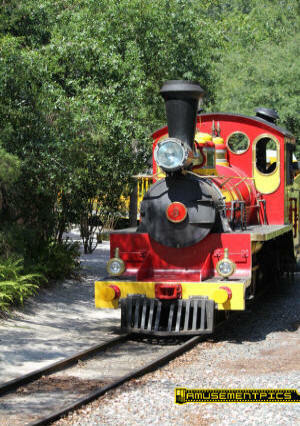 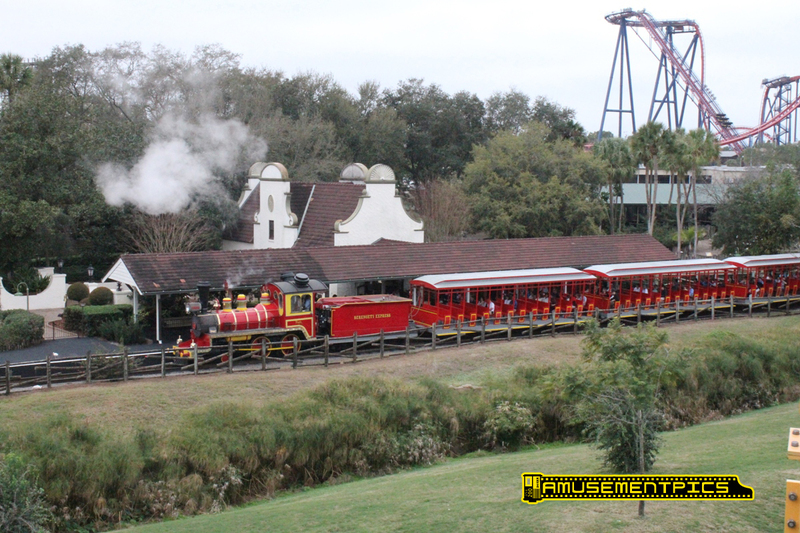 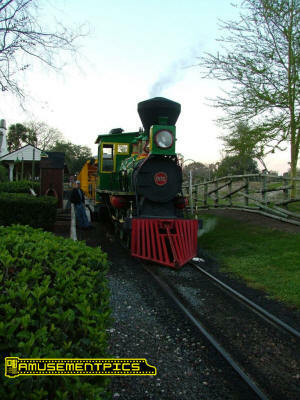 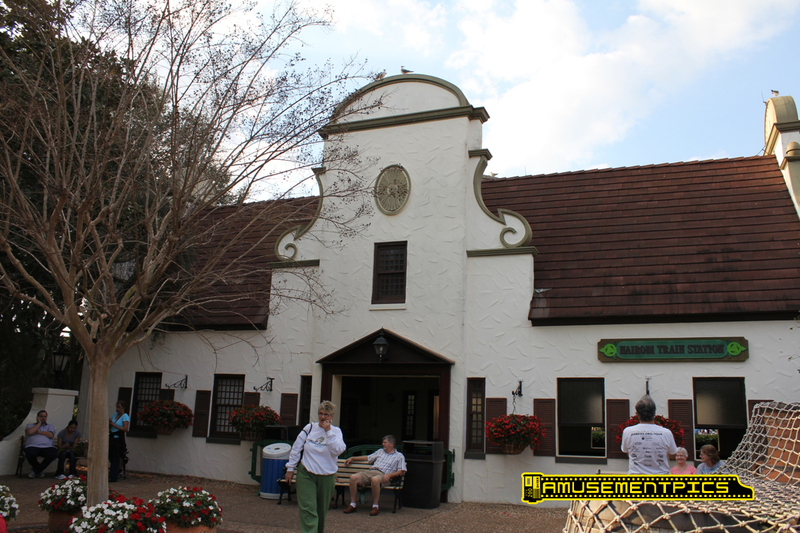 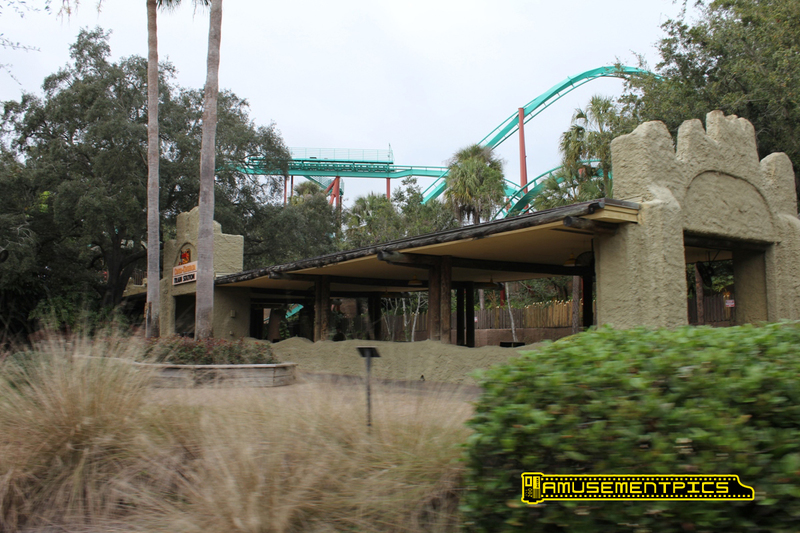 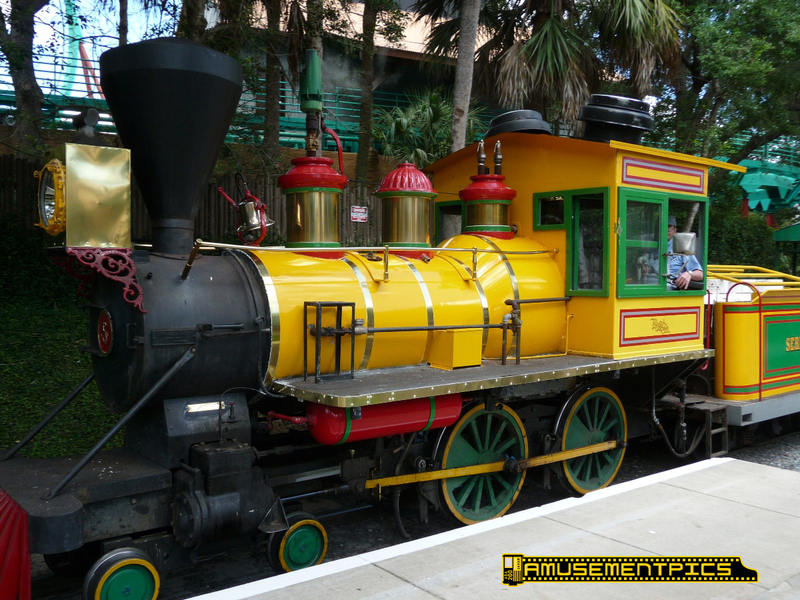 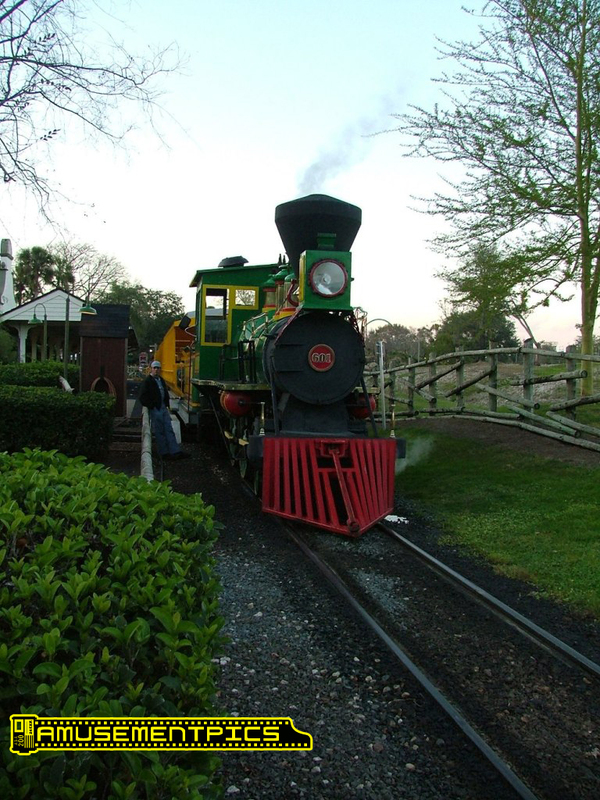 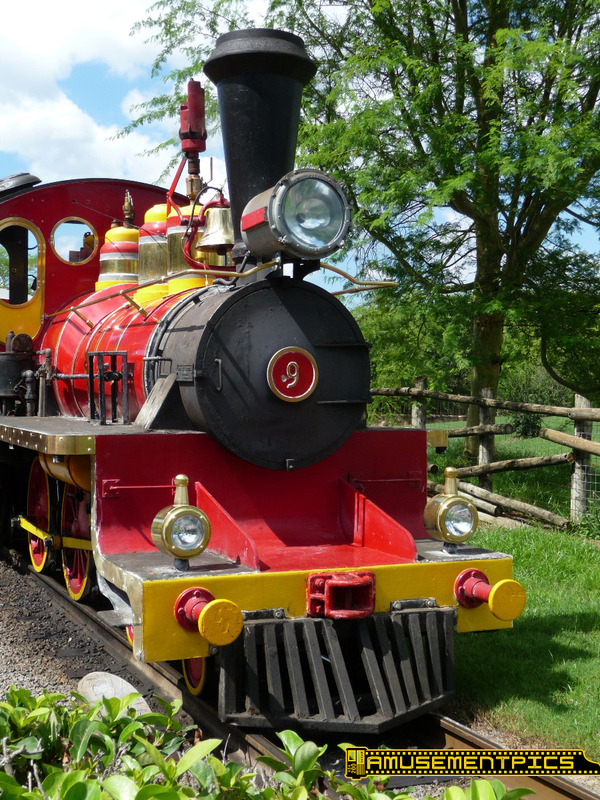 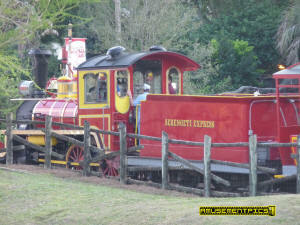 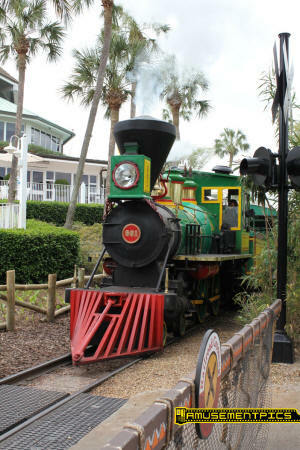 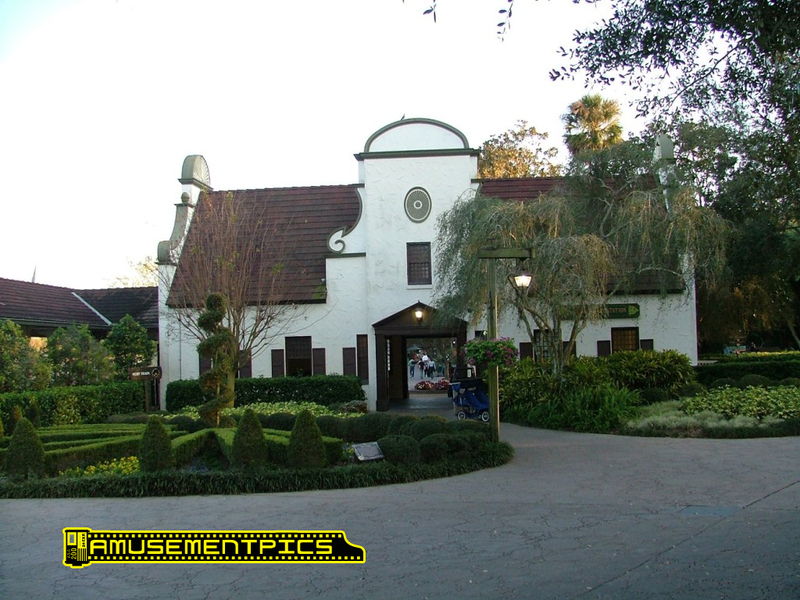 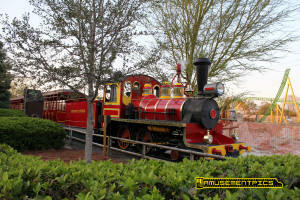 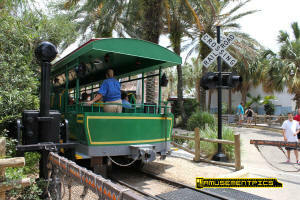 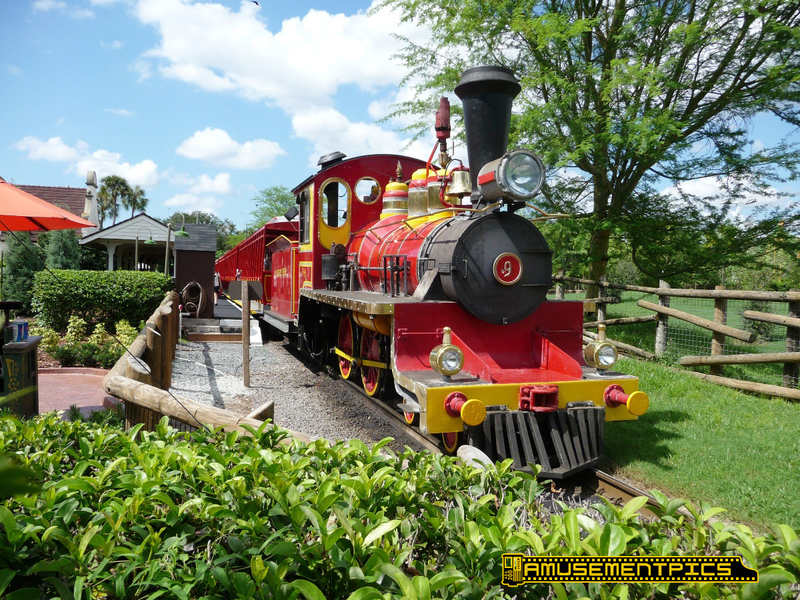 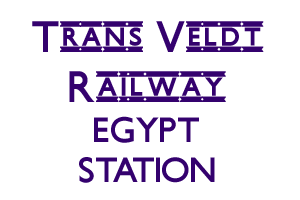 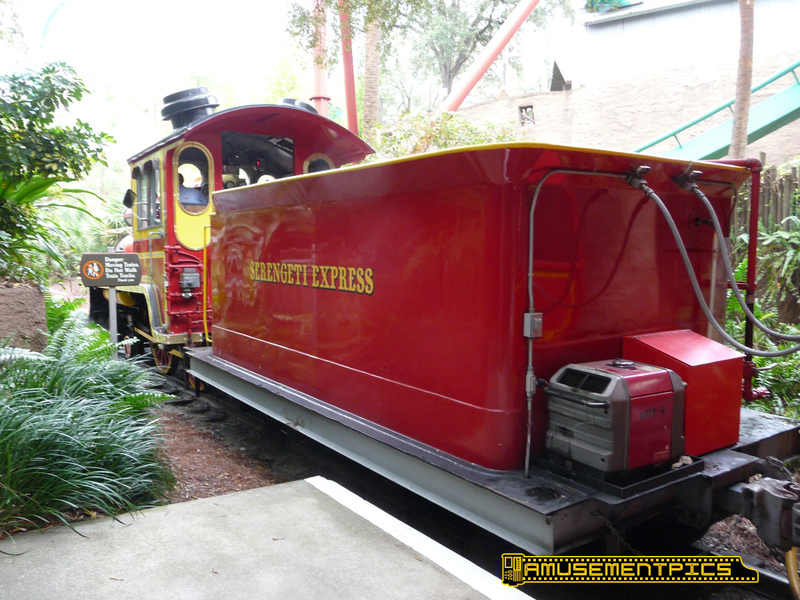 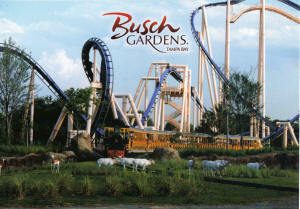 It was purchased by Busch Garden Tampa after Kings Dominion removed their Old Dominion Line railroad to make way for future expansion. 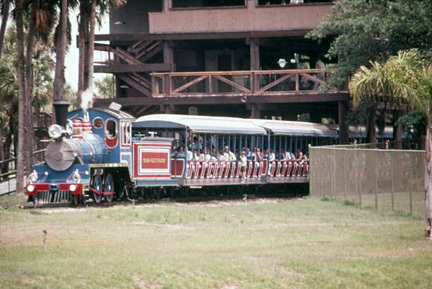 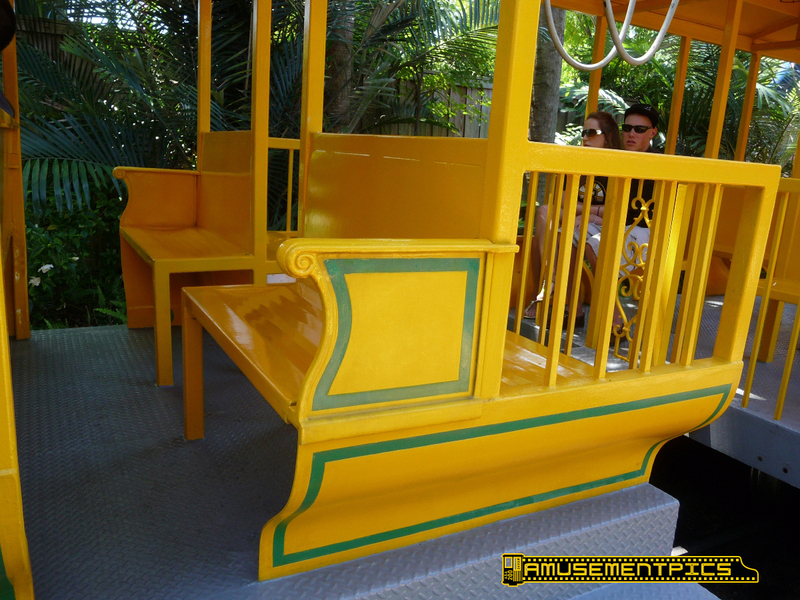 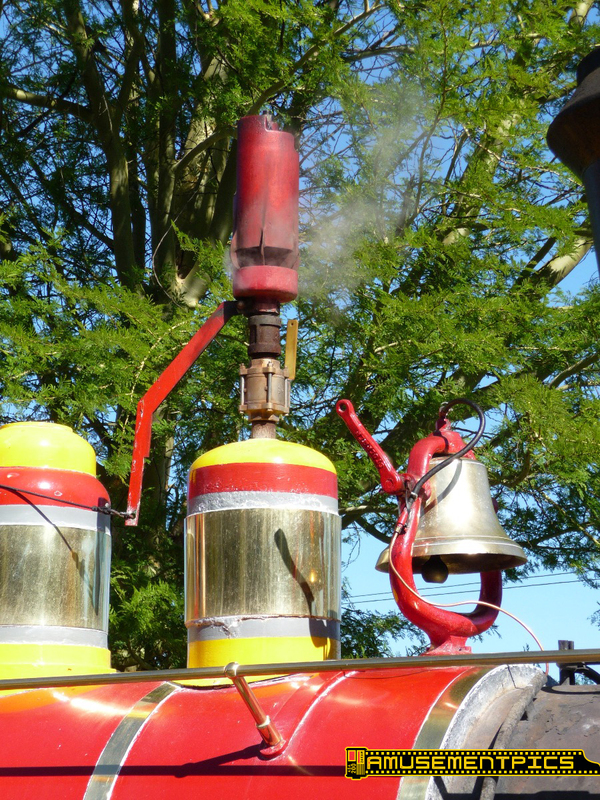 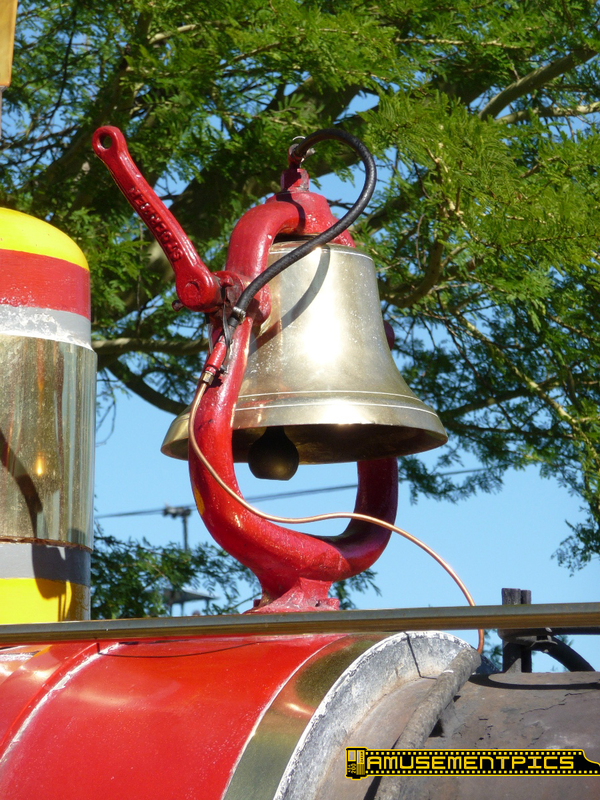 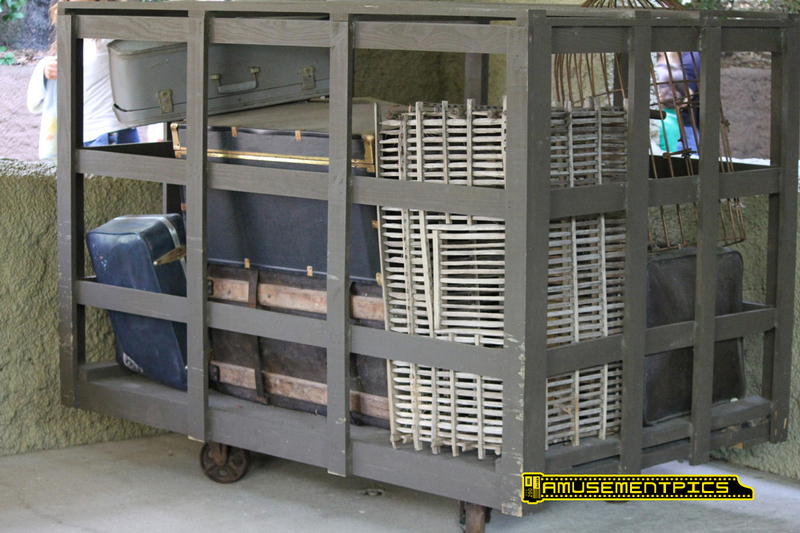 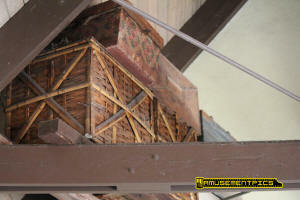 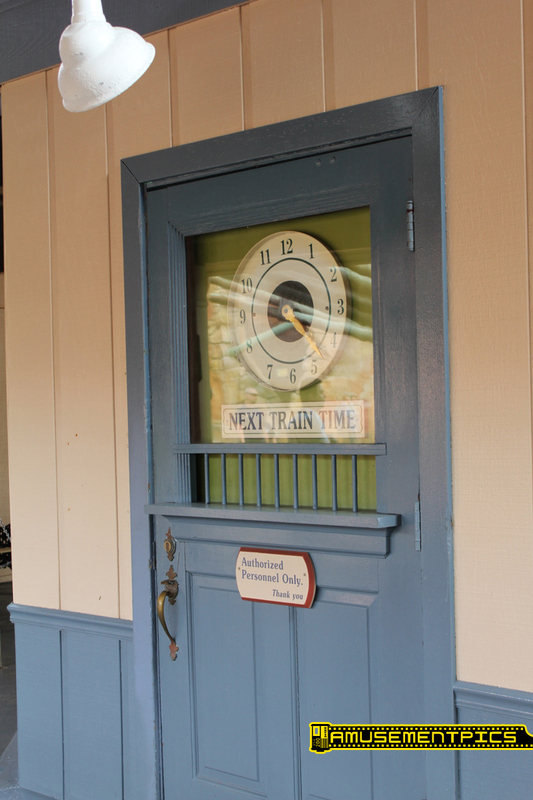 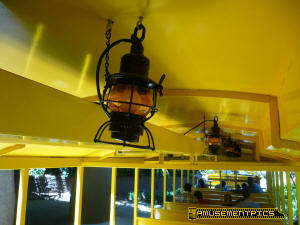 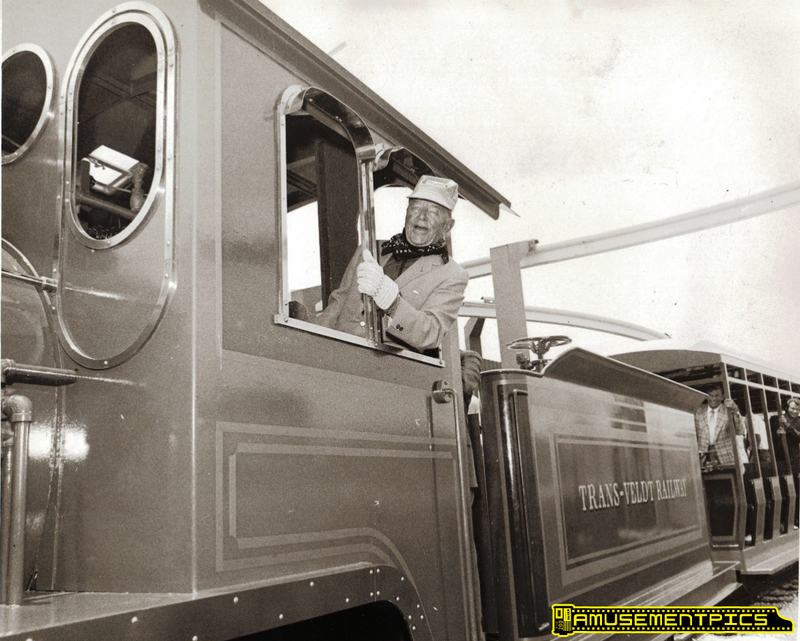 The original wooden cab was replaced with a steel cab and a third dome was added for the trains 5 chime whistle. 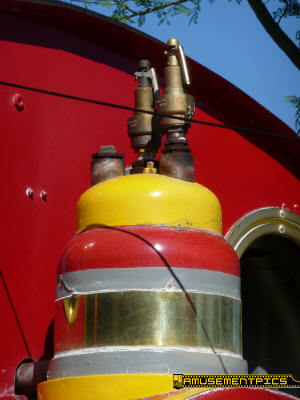 The American style #601 features additional ventilation for the cab with exhaust fans on the roof. 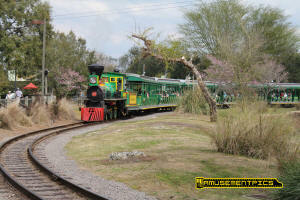 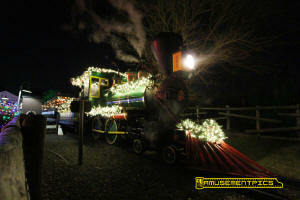 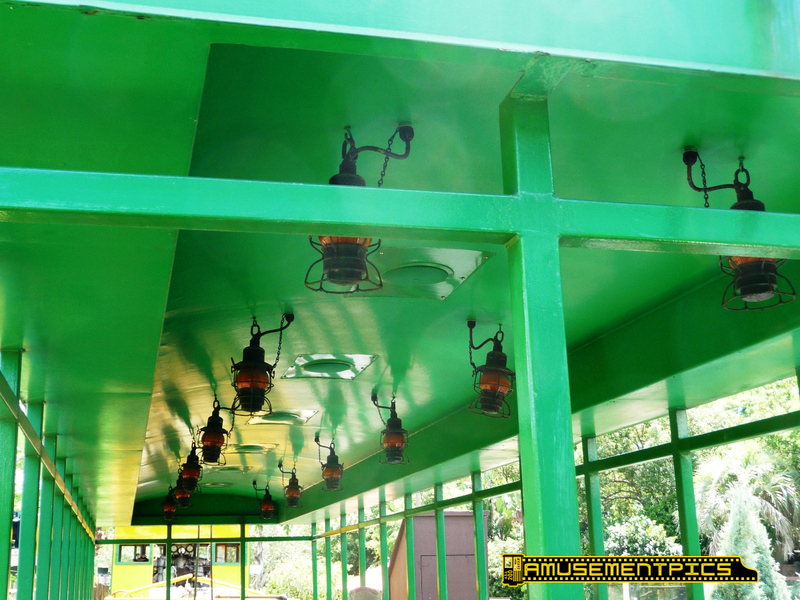 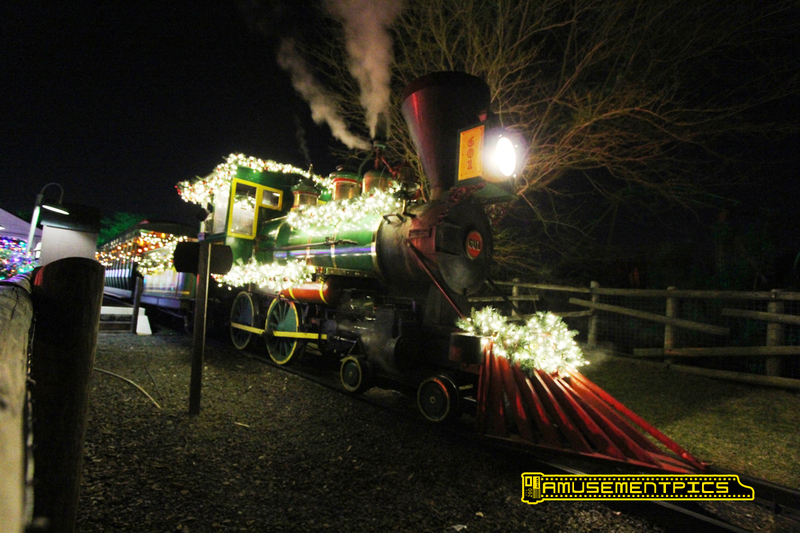 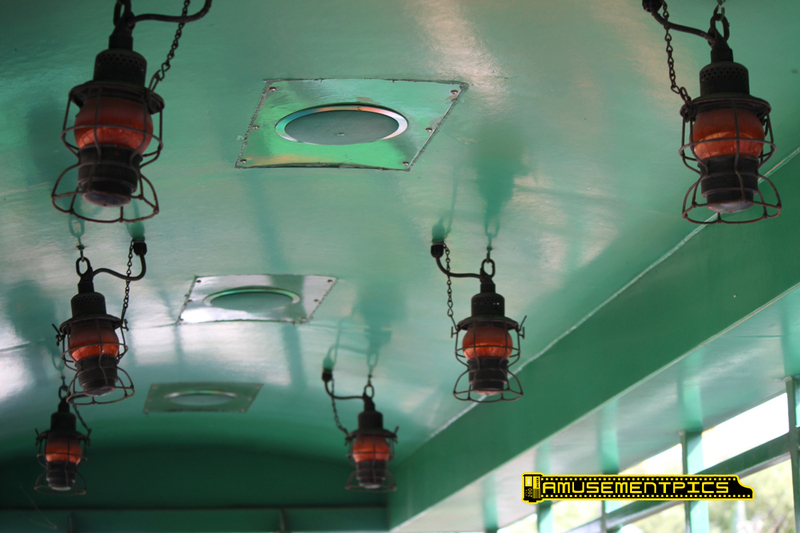 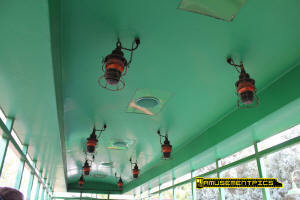 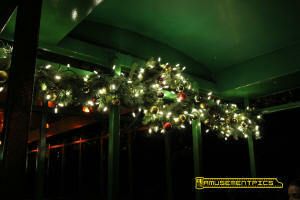 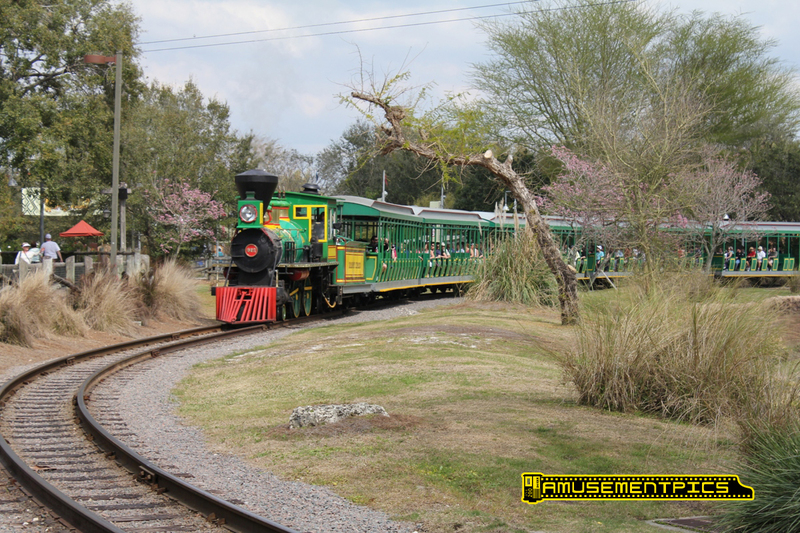 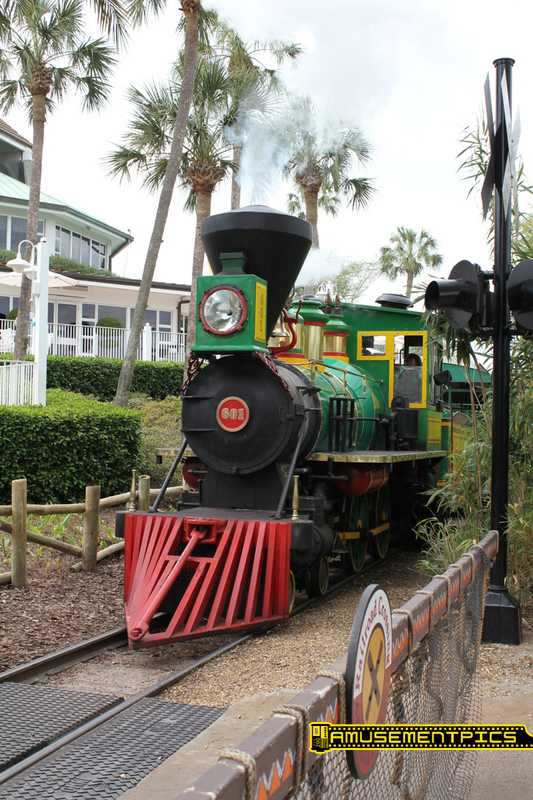 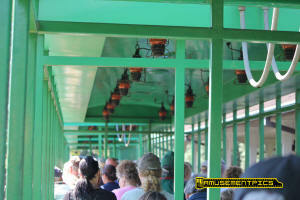 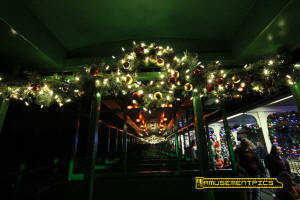 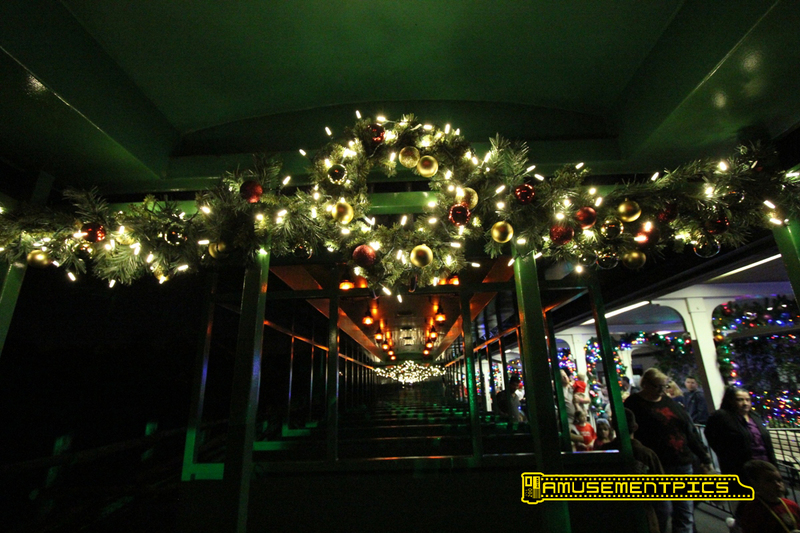 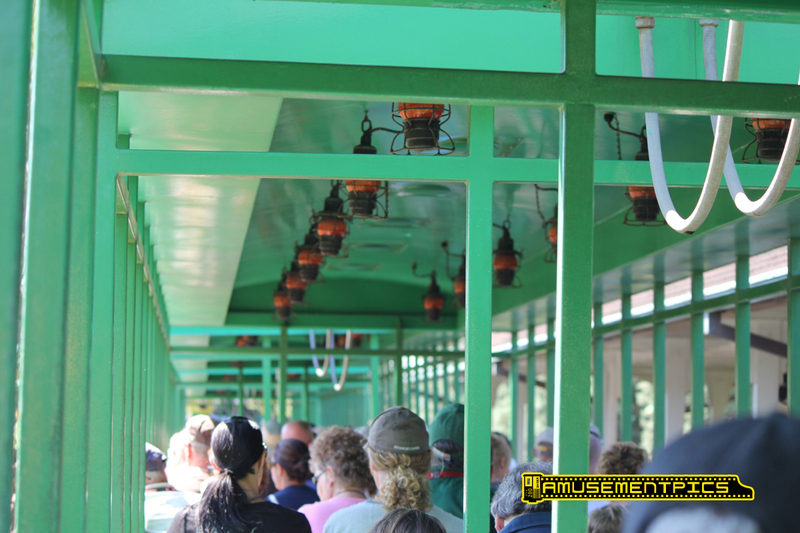 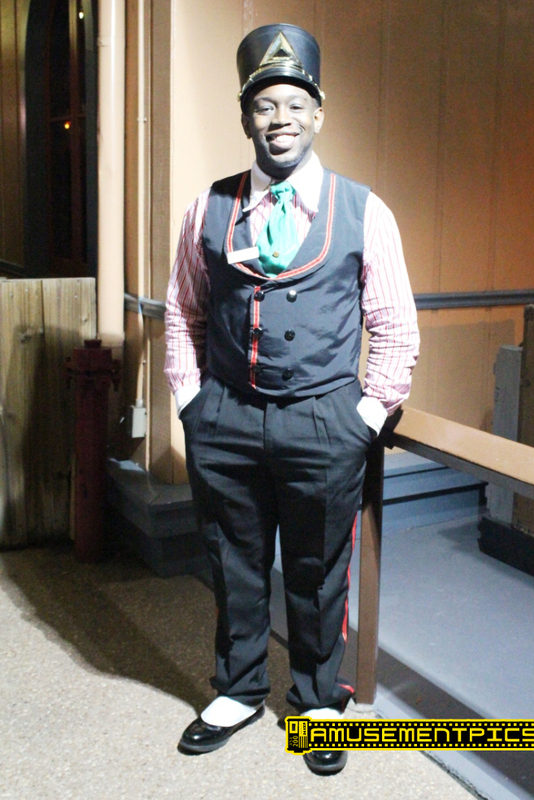 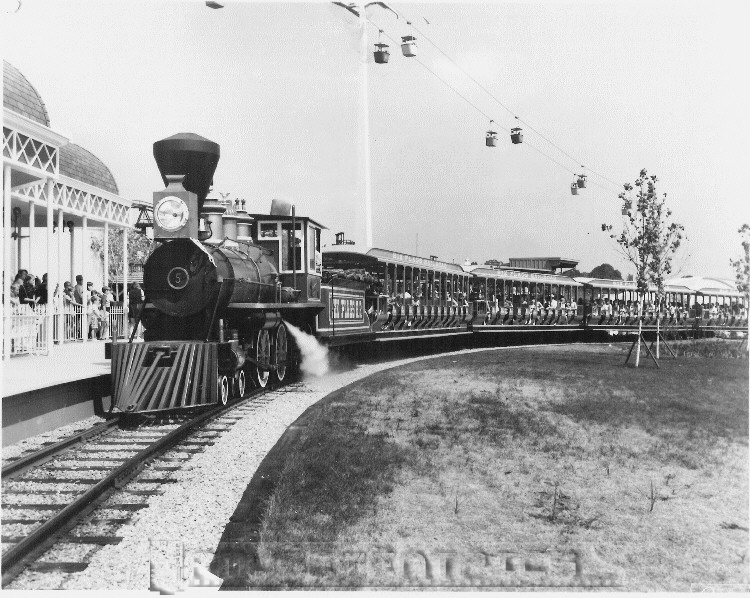 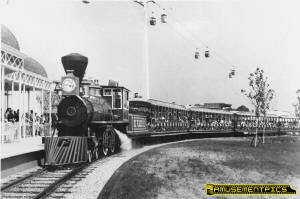 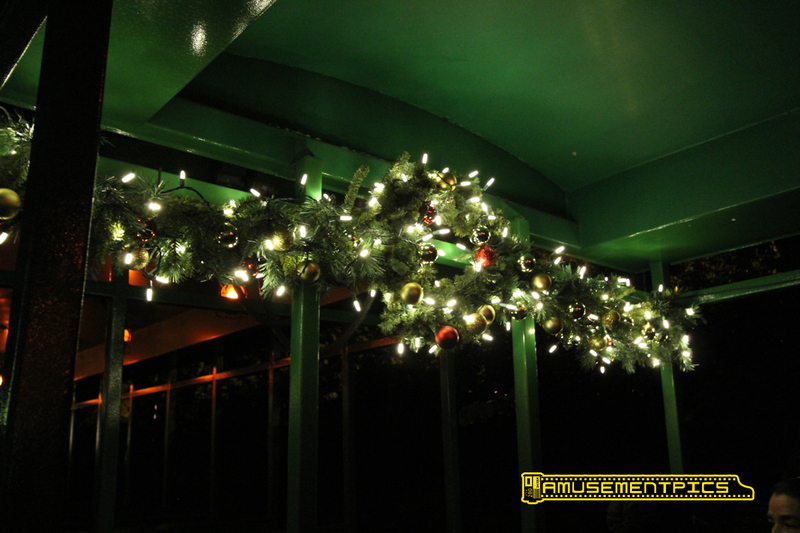 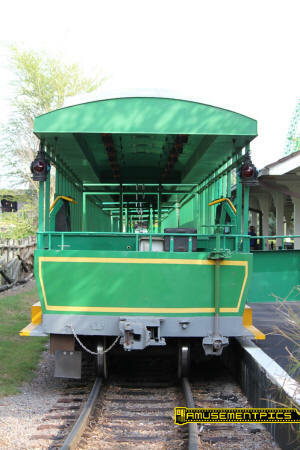 The 601's train is the original green train from #4 and features coaches with hanging railroad lanterns in the cars. The last car of the train has been retrofit with a wheelchair lift for ADA compliance. 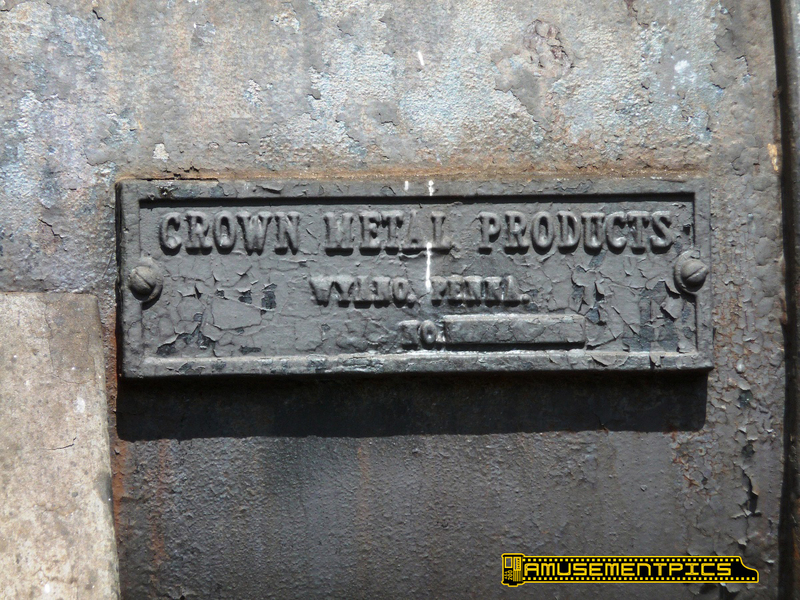 The rear of the car features the original Crown builder's plate, though it has been obscured by layers of paint.